The title of conductor seems more apt than director, for Tati oversees a veritable symphony of color, motion, and sound with virtuoso precision. 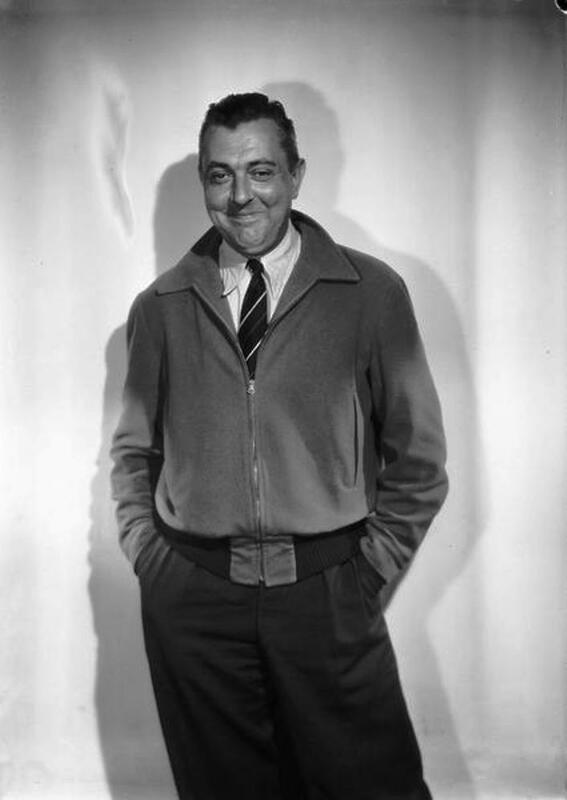 Though he made only a handful of feature films – there is a natural progression in Tati’s films from the mocked but adored countryside ( Jour de fête,) , to the stifling dullness of suburbs ( Monsieur Hulot’s Holiday, Mon Oncle ) to the crushing inhumanity of mega-cities and roads (in Play Tme and Trafic) and Parade – making Jacques Tati among the most beloved of all cinematic geniuses. His work represents the great migration of people and objects from the countryside to the city, from the ancient world to the modern world. 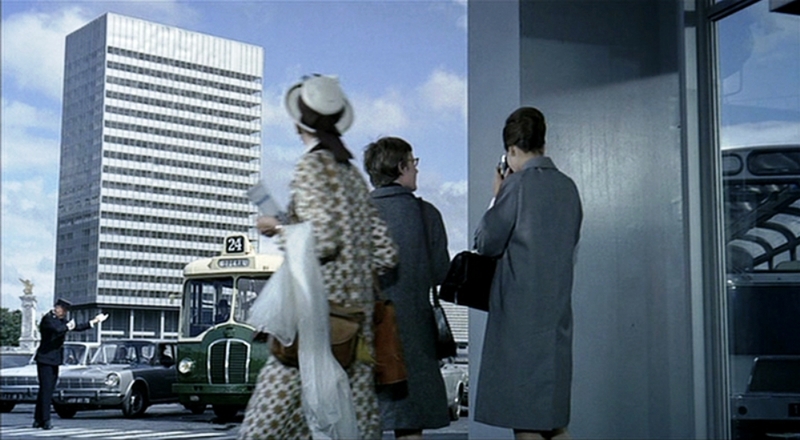 In Play Time, Tati’s character, M. Hulot, and a group of American tourists attempt to navigate a futuristic Paris constructed of straight lines, modernist glass and steel high-rise buildings, multi-lane roadways, and cold, artificial furnishings. 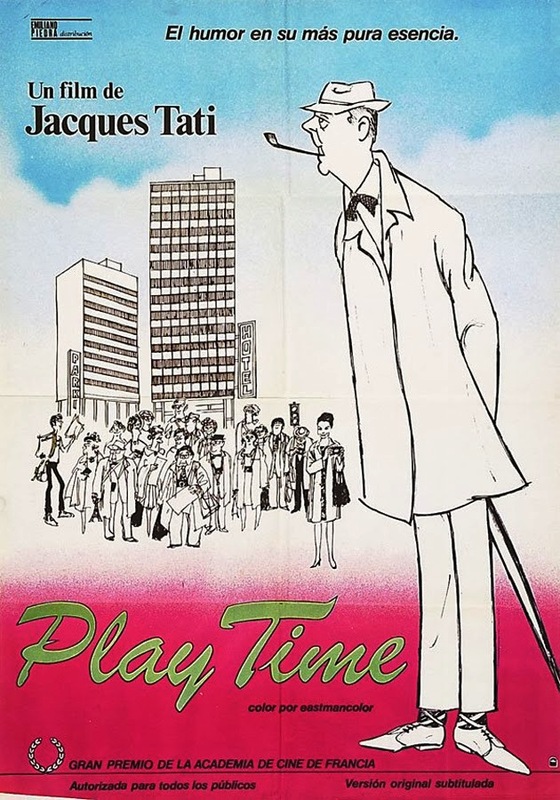 Play Time is a very funny film with the humour created through circumstances brought about by a barrage of modern impracticalities and the bumbling Hulot’s ( plated by Tati himself) attempts to navigate the overwhelming changes that have transformed the Paris he once knew. 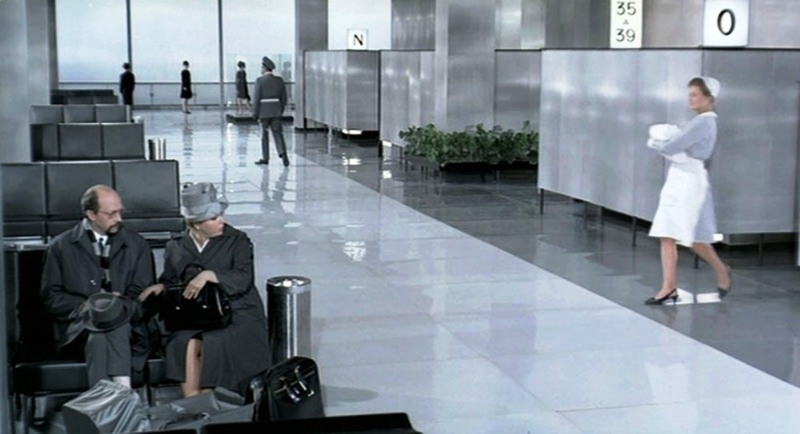 From the clinically ordered opening sequences in the sparse, empty airport to the subtle meaning of the heart warmingly sweet gesture of Hulot’s parting gift, this is a wonderful film from a filmmaker who has never forgotten the world he grew up in and never let go of the importance of human connection within a material-minded world that has become increasingly distracted. 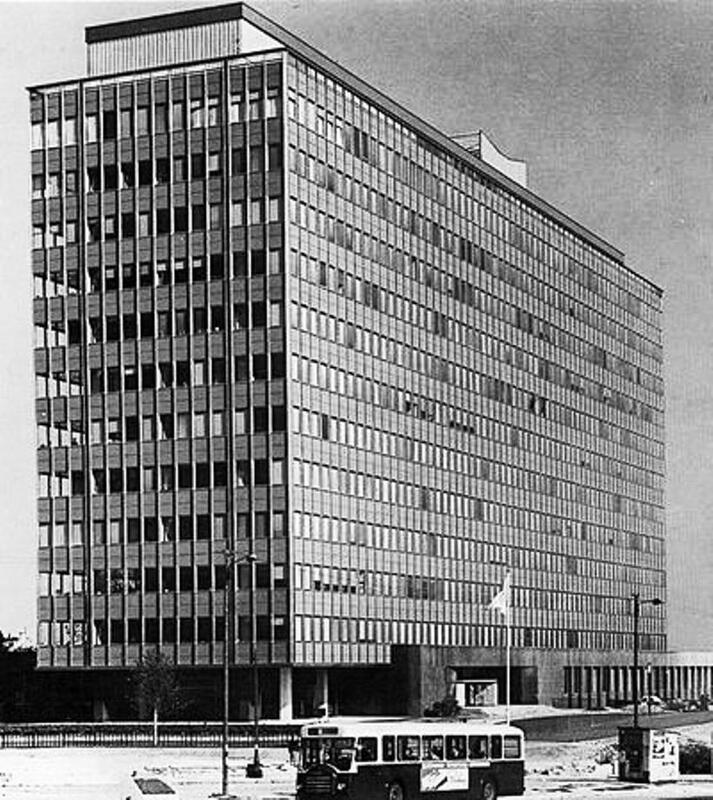 Many postwar cultures rebuilt their cities after the war zones raged between the Axis and the Allies and reduced much of ‘Old Europe’ to rubble. The architectural concept of the ‘new city’ or the ‘city of the future’ consequently took on a more pragmatic and urgent function as cities literally had to be re-built. 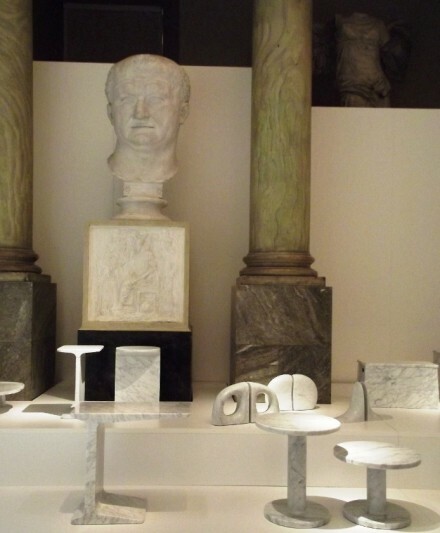 Different European cultures approached the resultant problems of design, theory, practice, purpose and usage from different perspectives. 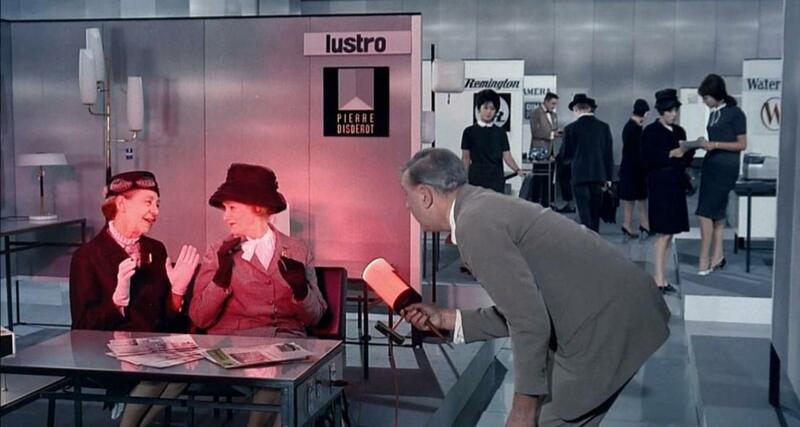 In Tati’s view, the French seemed absurdly attracted to the new-fangled gadgetry designed to make postwar affluence into a strange puppet-like existence. 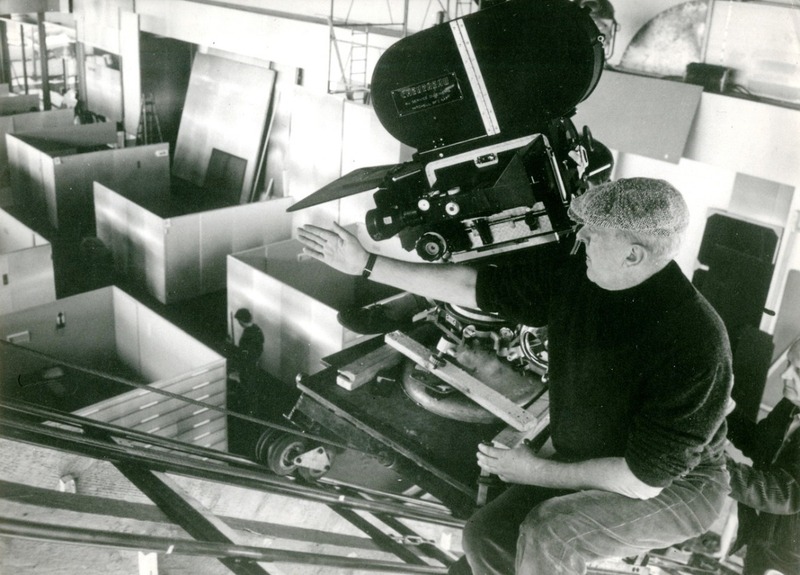 As such, notions of architecture, interior design, urban planning, transport, industrial design, consumerism and the growing leisure industries are all incorporated into the look, feel and sound of his films. Play Time portrays clearly the beginning of the rise of modern architecture and the corresponding modern lifestyle of French society. Paris is shown as a city designed purely for aesthetic power and modernity yet unsuitable for human habitation. 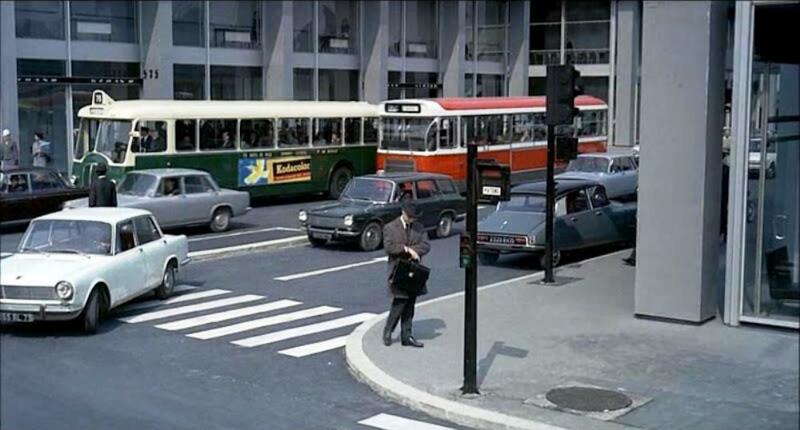 In this modern, nearly unrecognizable version of Paris that was entirely constructed for the film, the viewer is repeatedly shown the absurd relationship between people and a modern environment in which everything has been standardized. 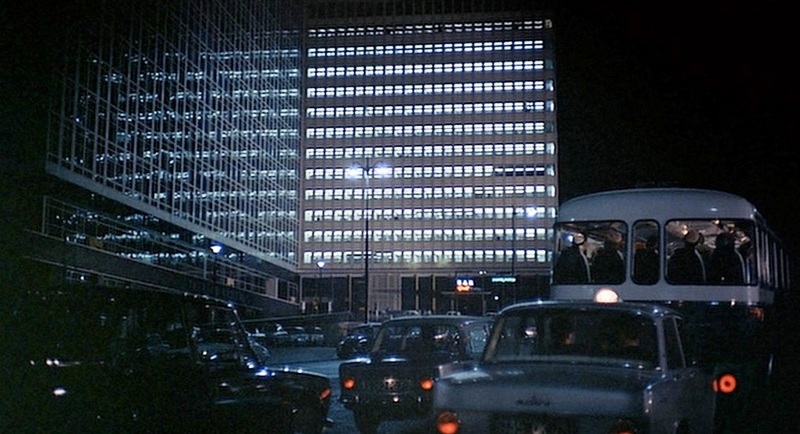 Most of the film is set in cold, sterile and lifeless ultra-modern buildings and artificial furnishings made up of pods and box-shaped offices and apartments. 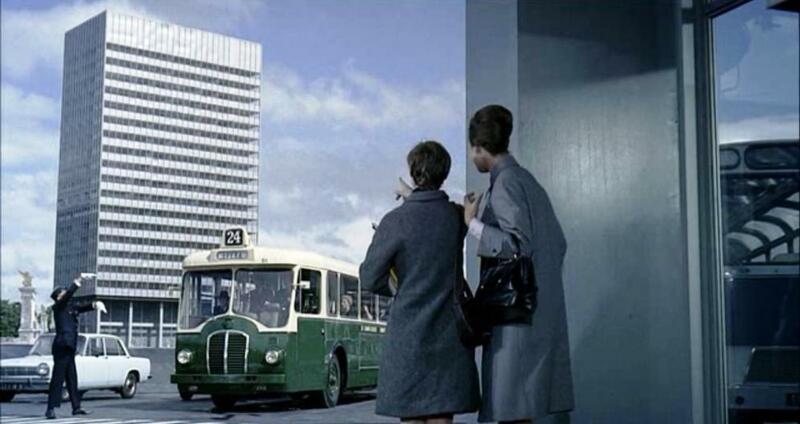 The movie’s carefully considered environment shows characteristics of the modernist movement at that time: repetition and regularity (the result of industrialisation) are represented from the smallest objects in the interiors to the larger scale of the city’s urban plan. His film is about how humans wander baffled and yet hopeful through impersonal cities and sterile architecture. Modern industrial technologies, accepted as necessary by society, are represented by Tati as obstructions to daily life and an interference to natural human interaction. 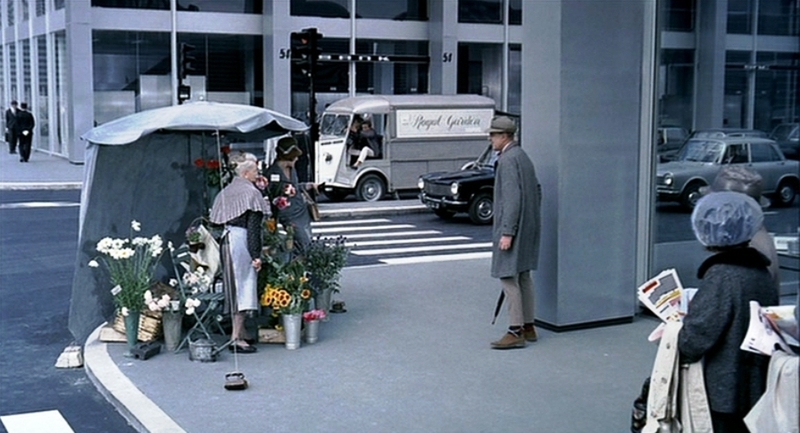 As Monsieur Hulot and a group of American tourists repeatedly cross paths in Paris during a single 24-hour period, Tati consistently keeps his 70mm camera beyond arm’s length and clutters his soundtrack with random and overlapping snatches of dialogue, musique concrète, and gonzo sound effects. 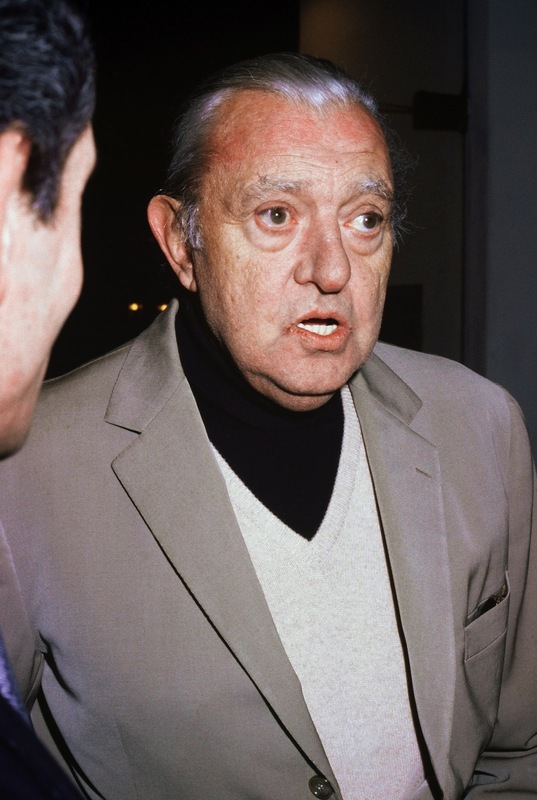 According to Tati biographer David Bellos, the contract for “Film Tati No. 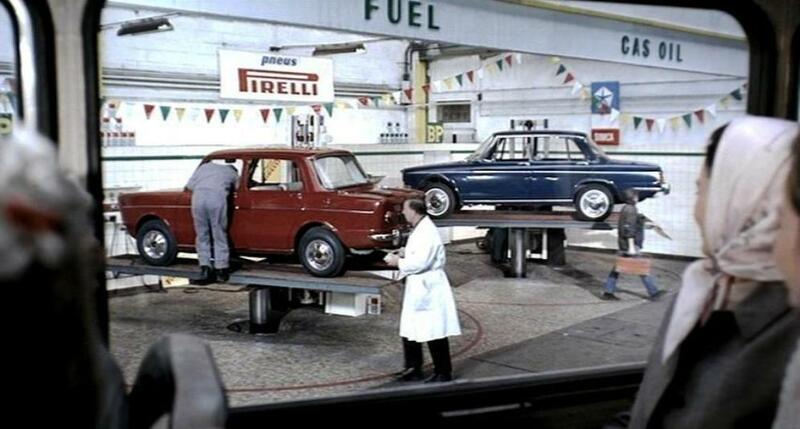 4” was signed in 1959 with the provisional title Recréation. 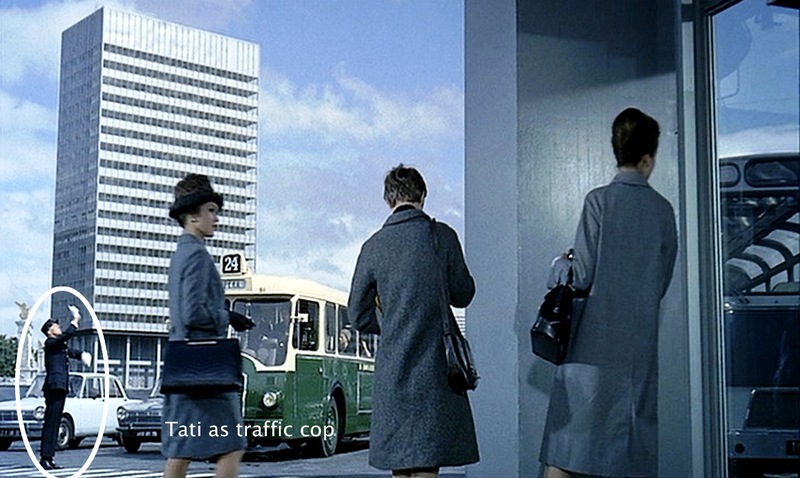 During pre-production, Tati visited many factories and airports throughout Europe ( including the Stockholm Arlanda airport, the German factories Siemens and AFG and some places considered as futuristic in Berlin, Brussels, Cologne, Geneva, etc. ) 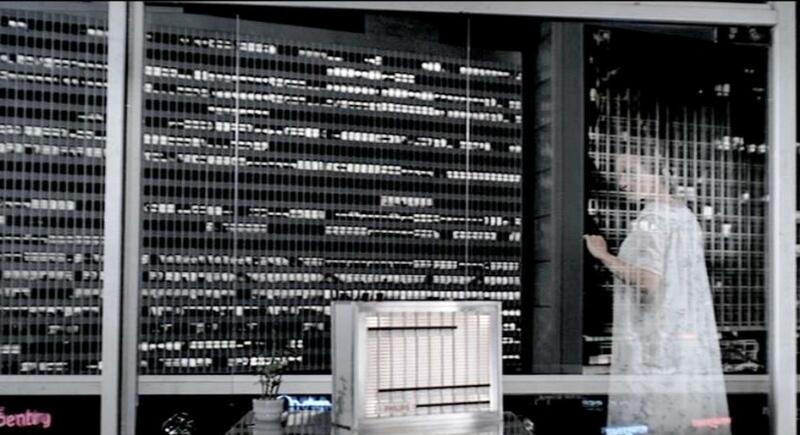 before his cinematographer Jean Badal came to the conclusion that he needed to build his own skyscraper. Badal was adamant, “If you want to shoot scenes of reflected clouds moving across the glass panes of a skyscraper, you will have to have the skyscraper all to yourself” … and that was what Tati did ! 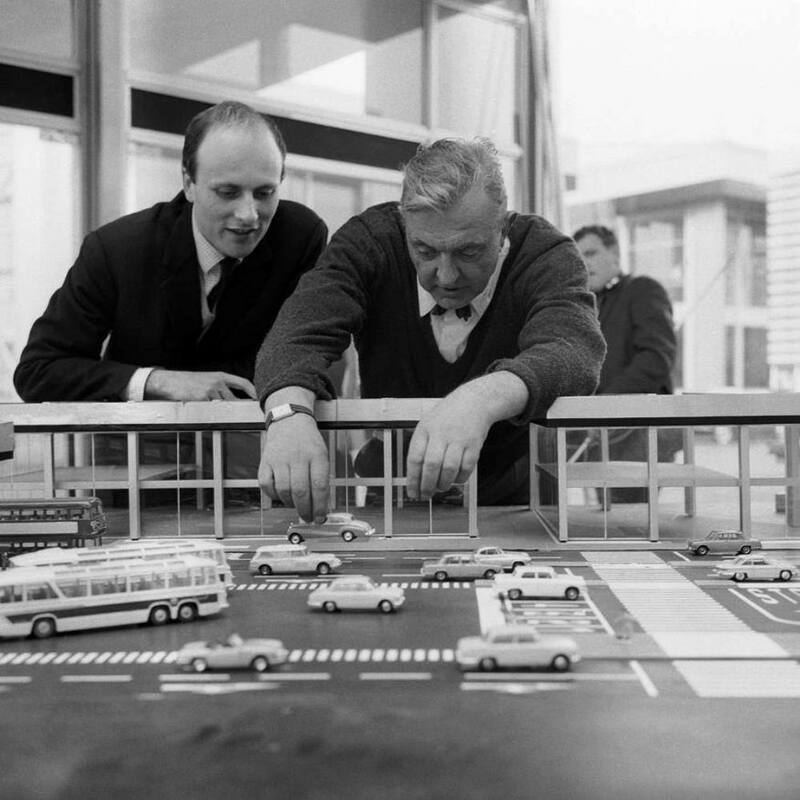 Not many filmmakers get to build their own city, but that’s exactly what French film director Jacques Tati did for his masterpiece, Play Time. 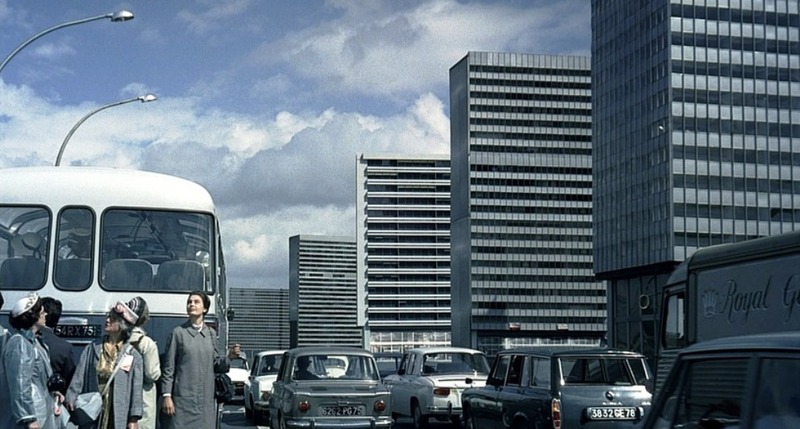 On an open field east of Paris, Tati created a combination of airline terminal, city streets, shops and high rise office blocks and a traffic roundabout – all designed in the most perfect shiny emptiness of the late International Style. 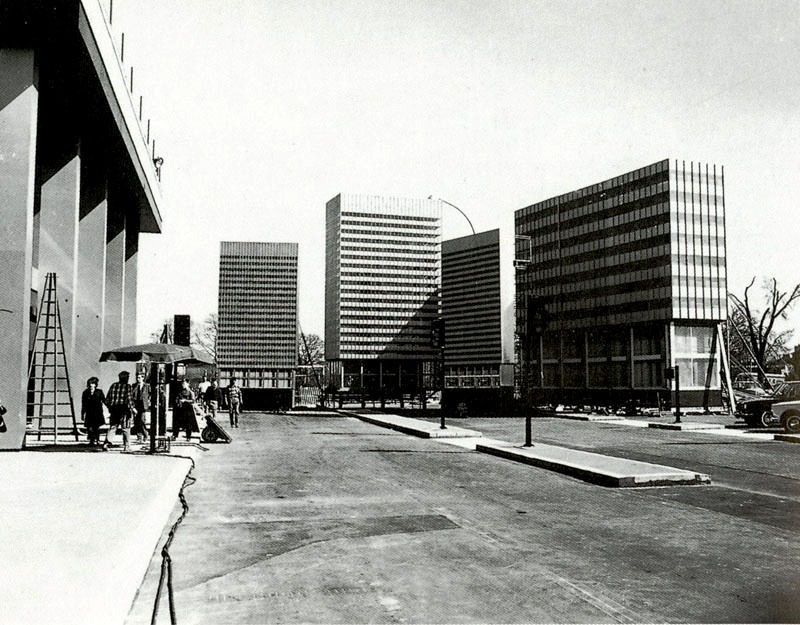 It is possible to think that the set of Play Time referred to the area of La Defense, but because the regulations in Paris to build high-rise buildings only changed after Charles de Gaulle got elected again in 1962, there wasn’t a lot built yet, when Tati started his Tativille. 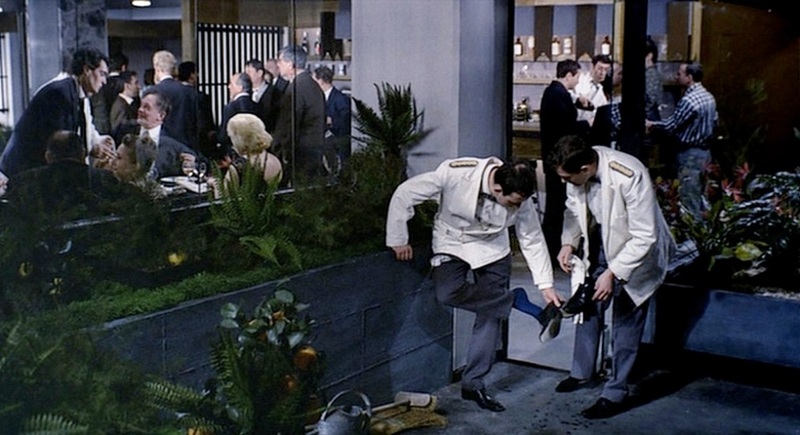 The Tativille sets were covered with photographic prints of non reflective metallic surfaces, so as to make sure no crew or equipment or lights might ever be caught by accident. 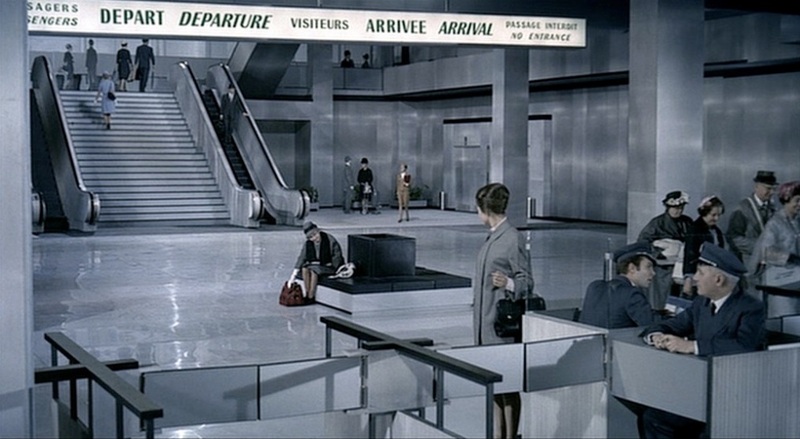 The Play Time sets didn’t pretend to be real and were clearly recognizable as such and to save money, some of the building facades and the interior of the Orly set were actually giant photographs. No ‘real city’ could have given him that flexibility. 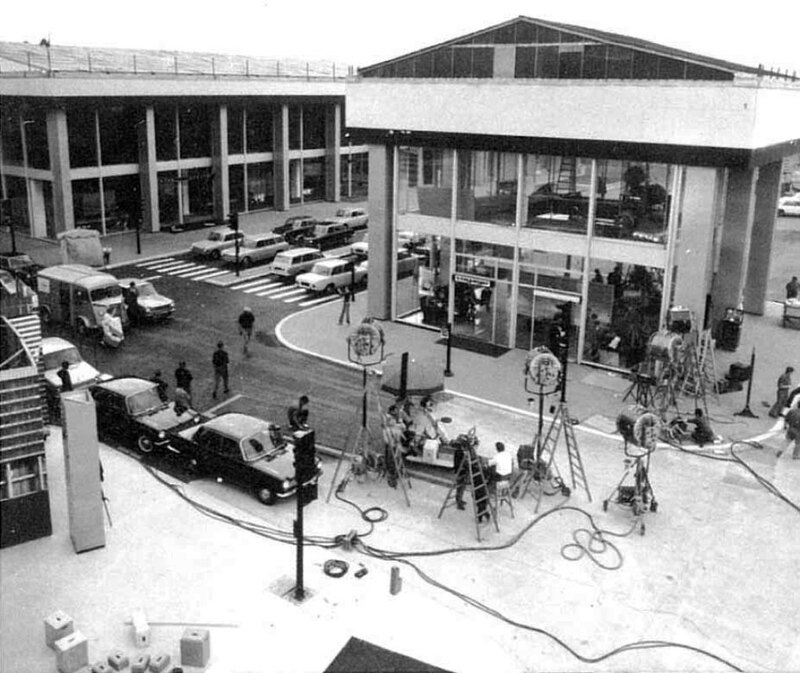 Tati’s Specta Films built Tativille: an entire city inhabited by no one but actors – who left after each day of filming. Specta Films employed about 100 workers laboured ceaselessly for 5 months to construct this revolutionary studio with transparent partitions, which extended over 15,000 square metres. 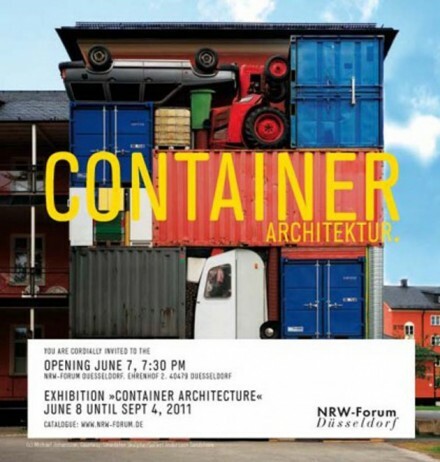 One estimate puts the total mass of built space and material at ……. Tativille had its own power plant and approach road, and building number one had its own working escalator. Each building was centrally heated by oil. 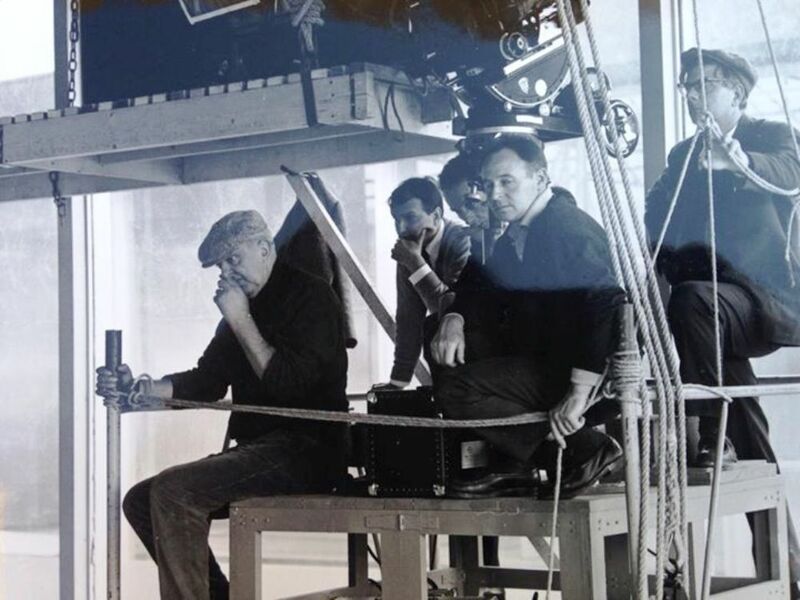 Budget crises and other disasters stretched the shooting schedule to three years, including 1.4 million francs in repairs after a sizable portion of the set was damaged by storms in the Autumn of 1964 and required rebuilding. 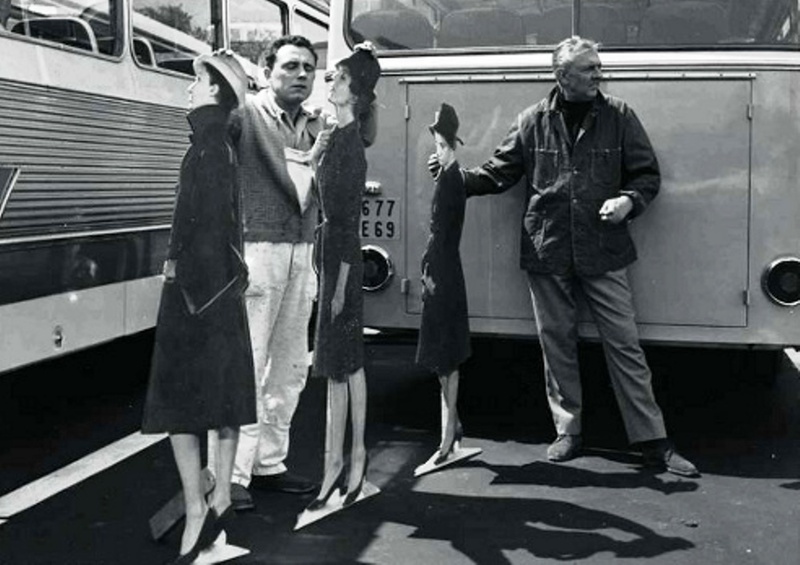 To trim the budget, Tati used life-sized cardboard cutout extras, who stood in the background to “interact” with live extras. 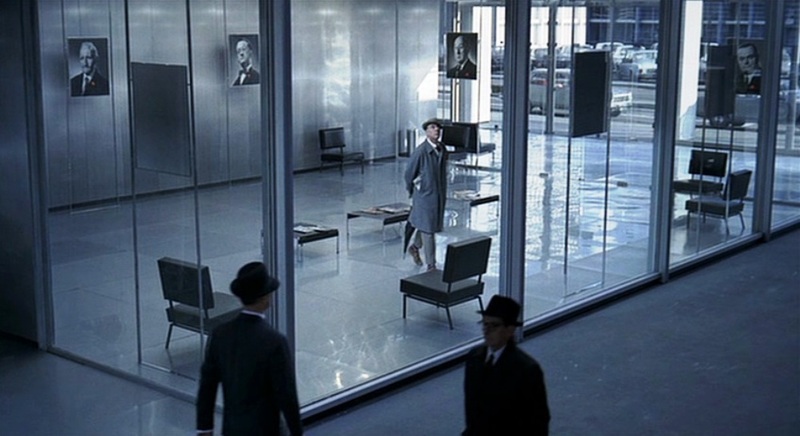 These cutouts are noticeable in some of the cubicles when Hulot overlooks the maze of offices, and in the deep background in some of the shots at ground level from one office building to another. 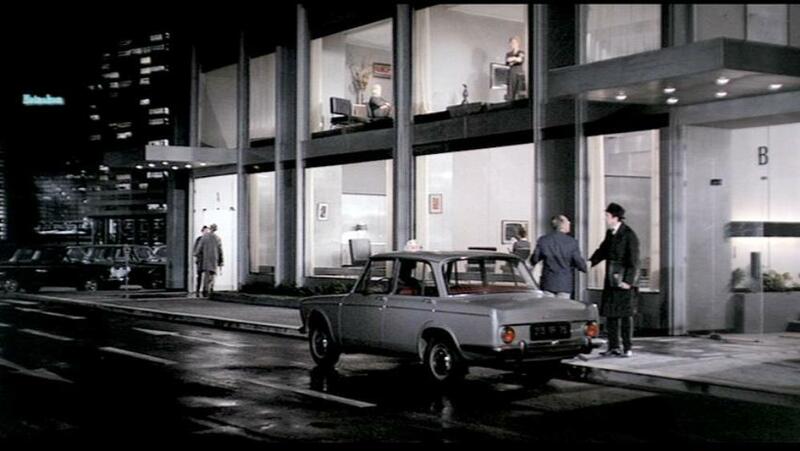 The original idea (from Jacques Lagrange, a painter and Tati’s co-writer in Play time, M. Hulot and Mon oncle) had been to build real commercial buildings whose units they could sell off afterwards, with minor modifications, as offices and flats. 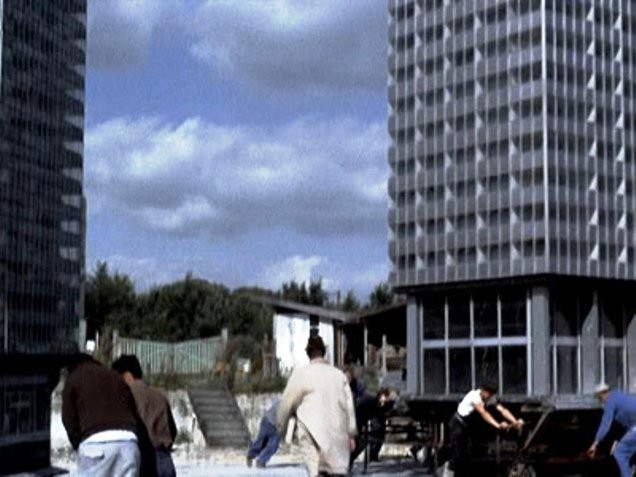 Tati then decided he wanted the resulting buildings to be used as a studio complex by other filmmakers and film students, and secured a promise from then-Minister of Cultural Affairs André Malraux that this would be the case, which laid the groundwork for what would become a financial disaster. 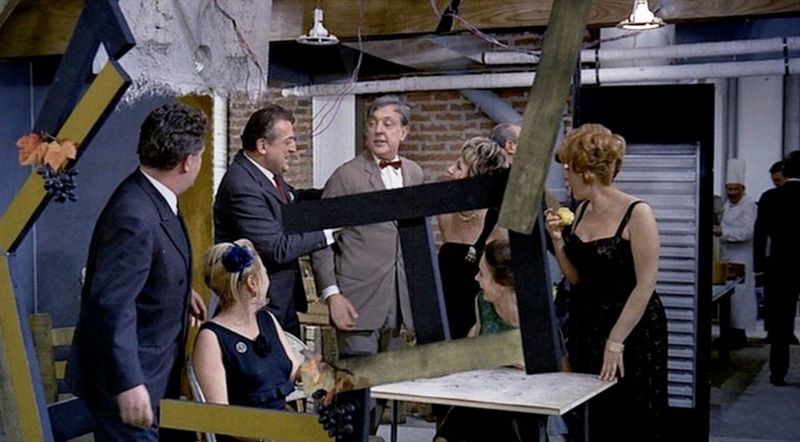 As it turned out, Andre Malraux did not hold true to his word once Tati ran into financial trouble, and the sets were torn down. As Play Time depended greatly on visual comedy and sound effects, Tati chose to shoot the film on the costly high-resolution 70 mm film format (with its magnificent widescreen clarity and depth) together with a complicated stereophonic soundtrack. 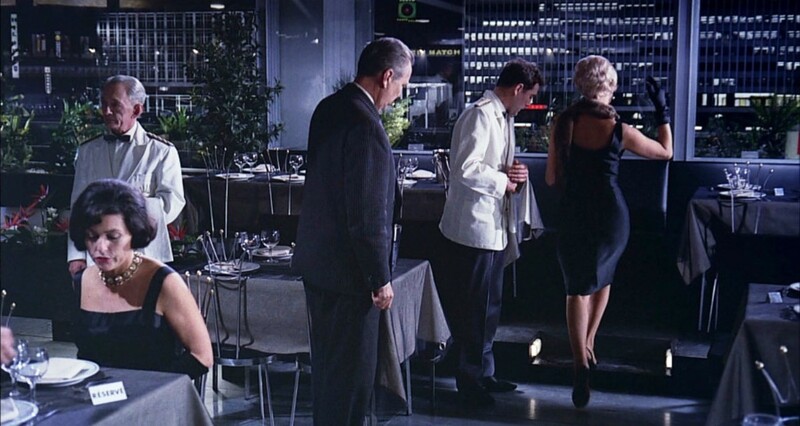 The big film format permitted to capture the enormous dimensions of the set and fostered the director’s obsession with long shots, deep focus, and dense mise-en-scene compositions. 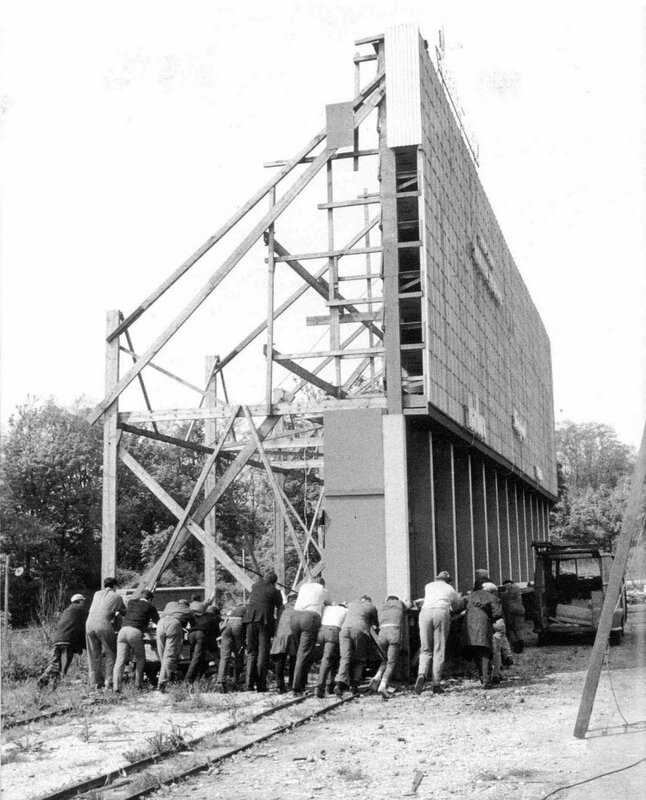 The 70 mm had a space (5 mm) for six tracks of magnetic sound that was carefully recorded, edited, and mixed by Tati and Jacques Maoumont, the sound supervisor. Play Time’s soundtrack was completely made during post production using magnetic sound. The magnetic sound enabled the creation of a very stylized and highly defined soundtrack whose main characteristic is the proliferation of loud sound effects rich in high frequencies. The high definition magnetic sound facilitated the creation of poly rhythms and poly phonics, and a very dynamic treatment of the different elements of the soundtrack (dialogue, music, sound effects, and ambient sounds). For being a film from the pre Dolby era (before 1975), it is quite amazing the degree of sonic sophistication that Play Time achieves. 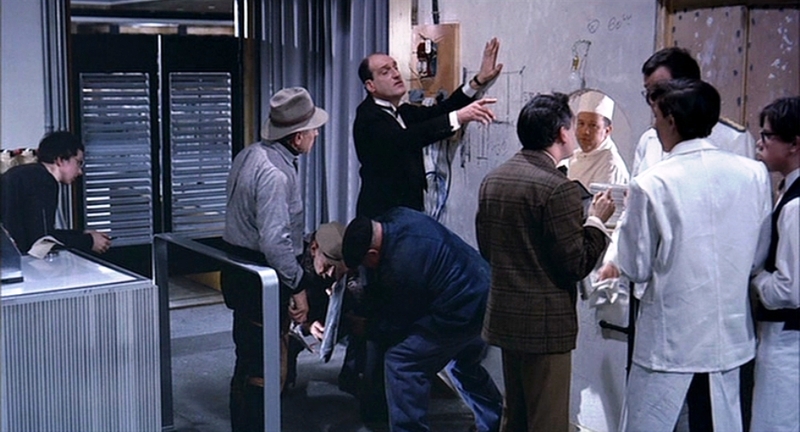 The method in which Jacques Tati based his artistic style and technique dates back to the timeless period of Charlie Chaplin and Buster Keaton. In a world completely absent of sound, pioneering filmmakers needed to construct a spatial playground in which the eyes did both the seeing and listening. 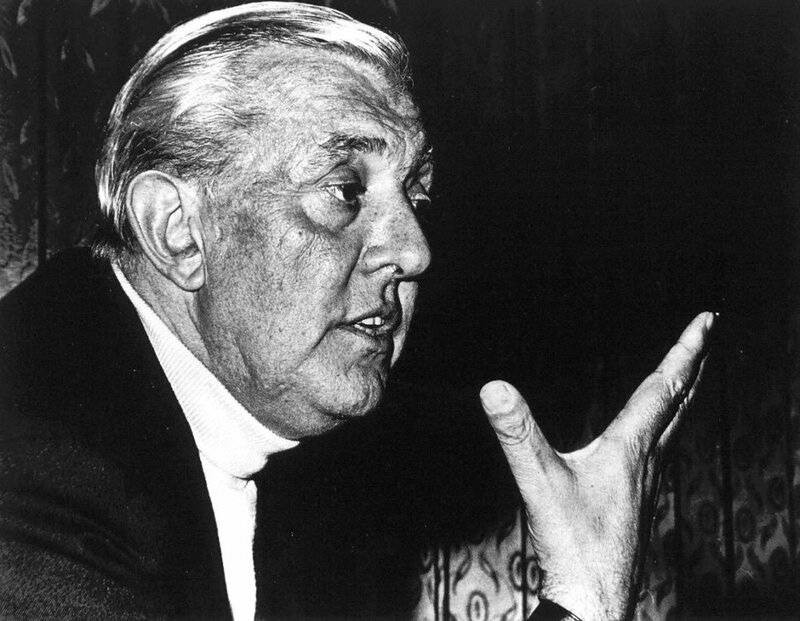 So infatuated to this idea was Tati, that he devoted his life and career to that very philosophy. 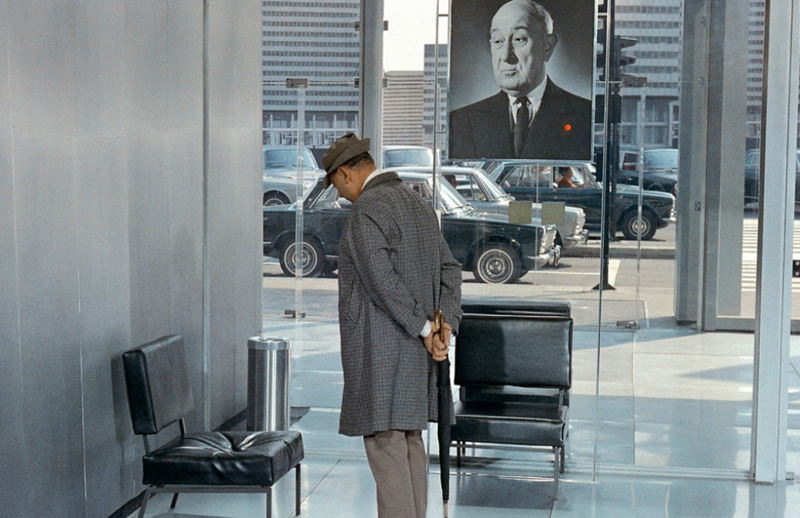 In what he called, Democratic Comedy, Jacques Tati took such an idea of visual observation to a completely different plane of existence. 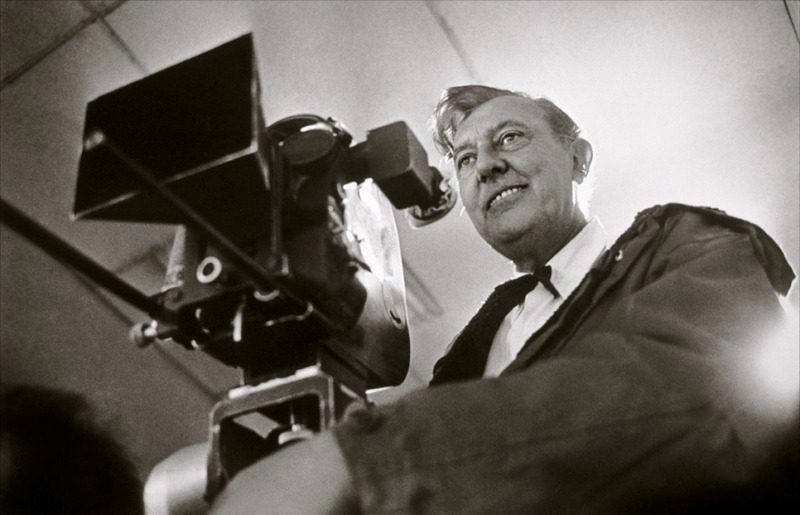 Within the conventions of film making, it is customary to use the camera as a means of leading the audience to the focal point of the scene, something evidently recognizable in the works of such masters as Alfred Hitchcock. But Tati does an extremely radical thing, something nearly unheard of! Play Time has no focal point. Within the complete 126 minutes of this “observation piece,” there is no attempt to concentrate our attention, no close-ups, no noticeable camera movements to attract our awareness, and no main characters to follow. Without close ups Tati drew the audience’s attention to particulars in a scene through audible cues. The film is also dominated by the long take, and this observational feel is accentuated by the combined use of deep focus and deep staging. When watching the film there is much going on that you may miss, since we do not see a clear story line, but several intertwining characters through various encounters and events throughout the day. Everybody in the audience will, at the end, have their own unique experience. Some will notice things that others did not, and vice versa. It is a democratic experience, one that gives people the freedom and liberty to make their own “film” from a series of events laid out on the screen. In Play Time, everybody in the audience plays the role of the Director. Tati spent three years putting the movie together (the centerpiece restaurant sequence alone took nearly two months to shoot), built an entire mini-city, painstakingly demonstrated to each extra (or maybe that should be “inhabitant”) their movements and gestures, re-shot sequences over seemingly inconsequential structural quibbles, and drove the budget up over six times its initial projected cost. As his own producer, and because he insisted for as long as he could on retaining distribution rights as well, Tati, through Specta Films contracted large debts with the French state sponsored film finance company UFIC and with several other banks too. 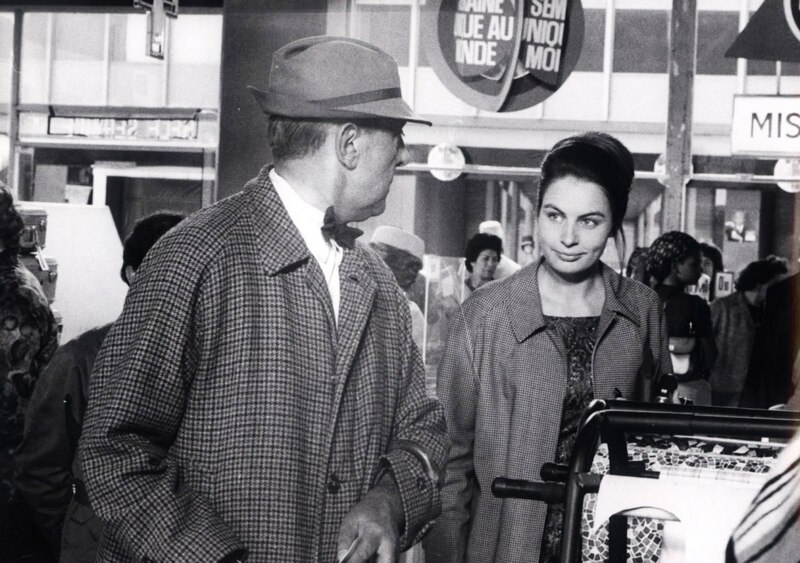 After the unseasonable rains in Autumn 1964, the cash stopped flowing, and Tati had to do what many filmmakers spend the bulk of their time doing >>> beg for money. 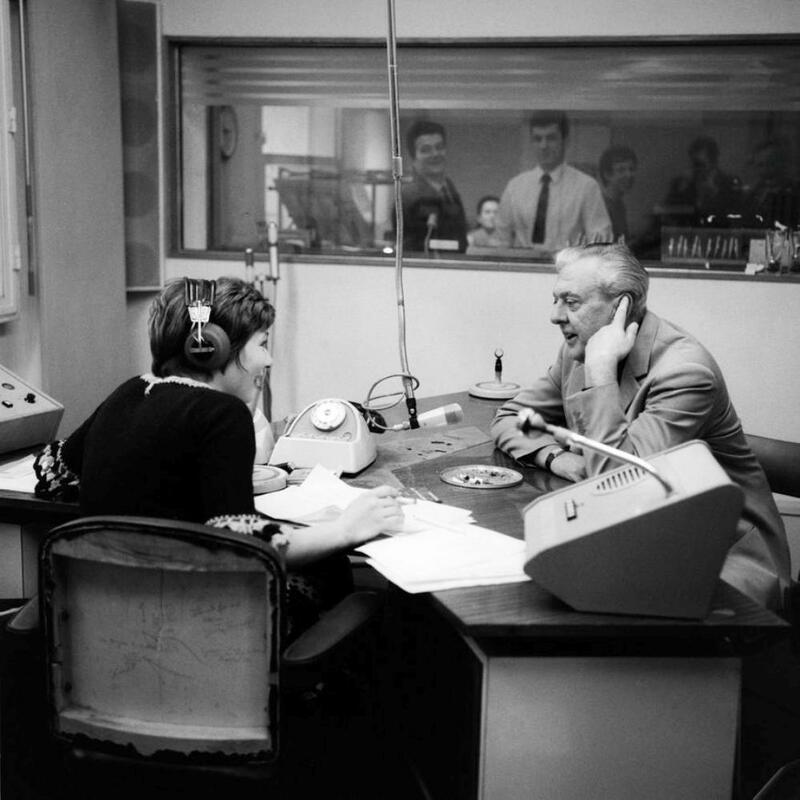 Nobert Terry, who acted as the film’s “product placement consultant,” put the director in touch with Prime Minister Georges Pompidou, who engineered a loan from Crédit Lyonnais. But in order to secure the loan, Tati basically had to mortgage away his future and that of his family as well. 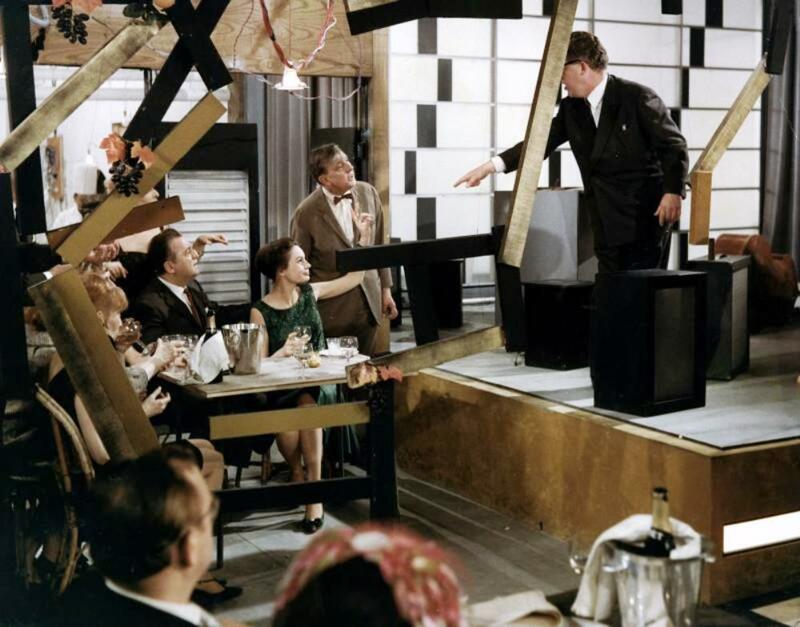 After 365 shooting days punctuated by long delays (due to everything from foul weather to the development of new gags to keep the film as up to the minute as possible), and after nine months of post-production, Play Time premiered in December 1967, (originally 152 min.) with the equivalent of an American “road show” presentation. 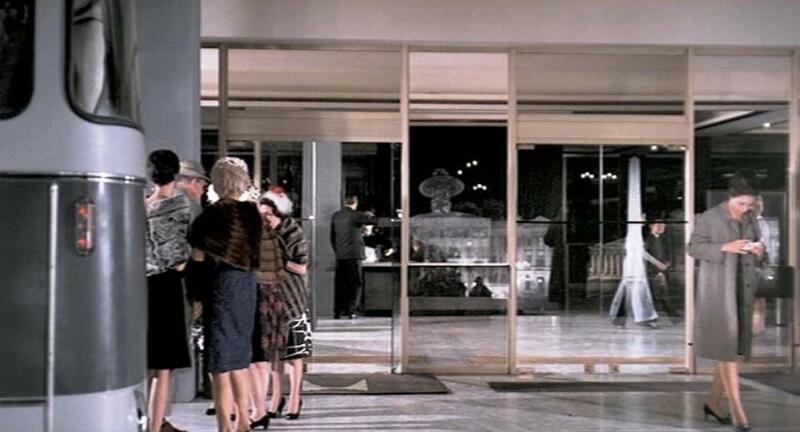 “Play Time” premiered at the Paris Empire Cinerama on Sunday, 17 December 1967 @ 137 mins. 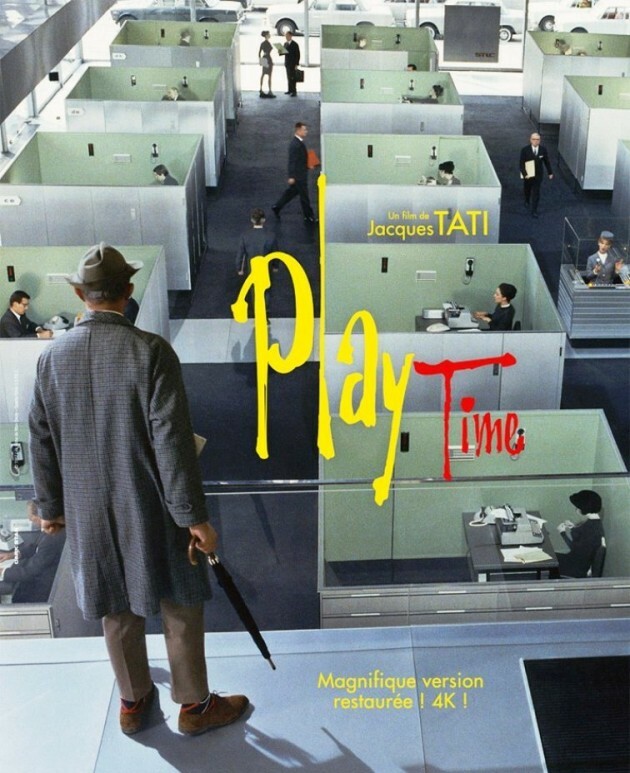 The March 1968 issue of Cahiers du Cinema devotes 25 pages to Tati and “Play Time” – filmography includes the notation: reduced since mid-February to 137 mins. Tati had held out for a long while to have it seen in its original format, but when U.S. distributors refused to accept it in 70mm he found discretion the better part of valor and made it available in a 35mm print with which he is apparently satisfied. The original version of the film (besides being at least half an hour longer) also used a stereophonic sound track to great effect. 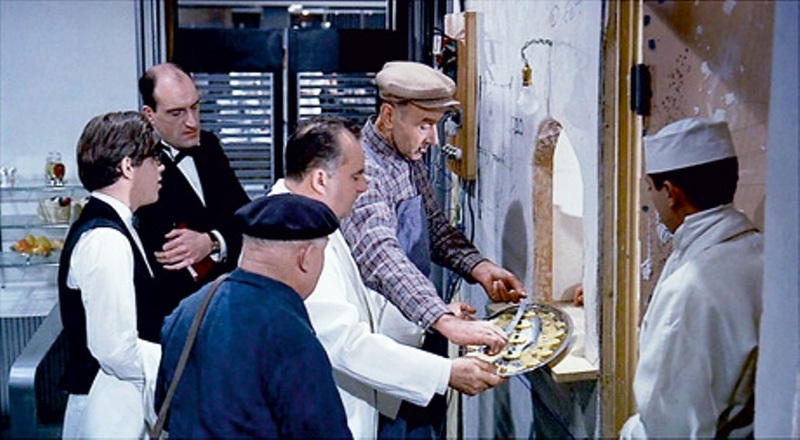 Sadly, not all of the missing footage—most of it reportedly devoted to further variations of existing gags—has been recovered, but everything else was enhanced in a 2002 65mm restoration of the original sound and image. 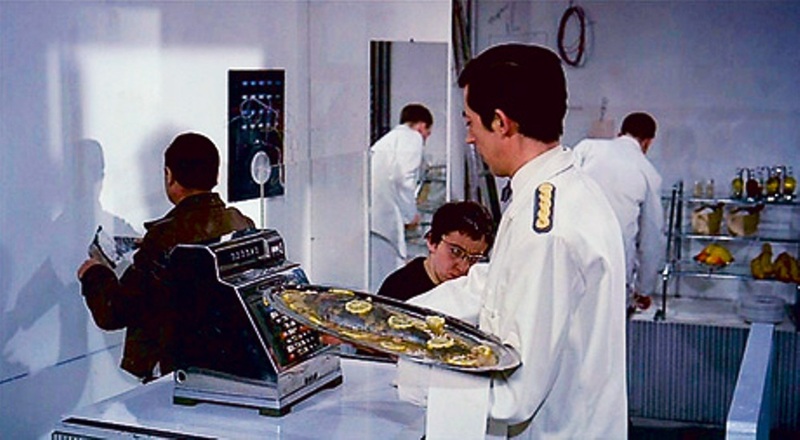 Results were the same upon the film’s eventual release in the U.S. in 1973 (even though it had finally been converted to a 35 mm format at the insistence of U.S. distributors and edited down to 103 minutes). 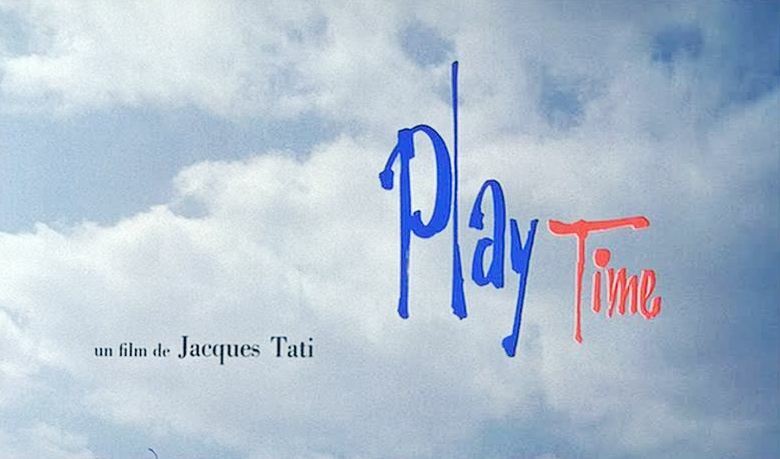 The New York Times called Play Time “Tati’s most brilliant film”, however it was no more a commercial success in the U.S. than in France. 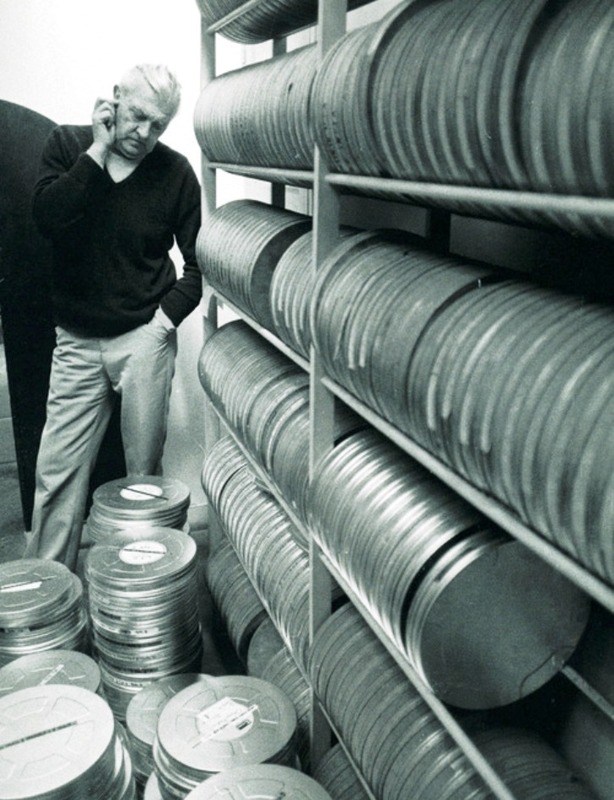 One reason for the film’s commercial failure may have been Tati’s insistence that the film be limited to those theaters equipped with 70 mm projectors and stereophonic sound (he refused to provide a 35 mm version for smaller theaters). 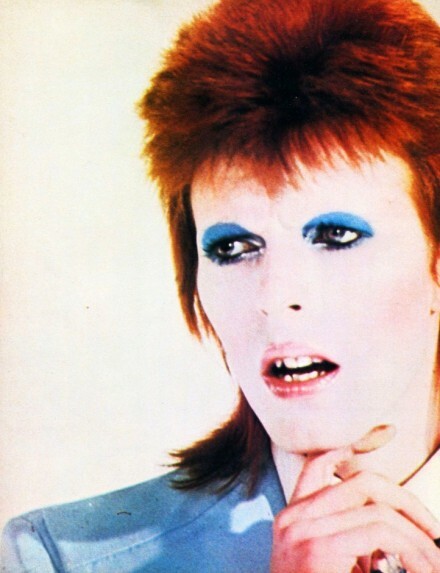 Play Time was the victim of a backlash, largely based on the outsized expectations surrounding this popular artist whose desire for publicity was equalled by his supposedly arrogant need for privacy during the (lengthy) act of creation. Moreover, despite critical appreciation, Play Time was so completely, alarmingly new in every way (plotless, starring not one or two people but a cast of hundreds, and completely dispensing with conventional notions of background and foreground) that it needed time to sink in with the public—time that it never got. 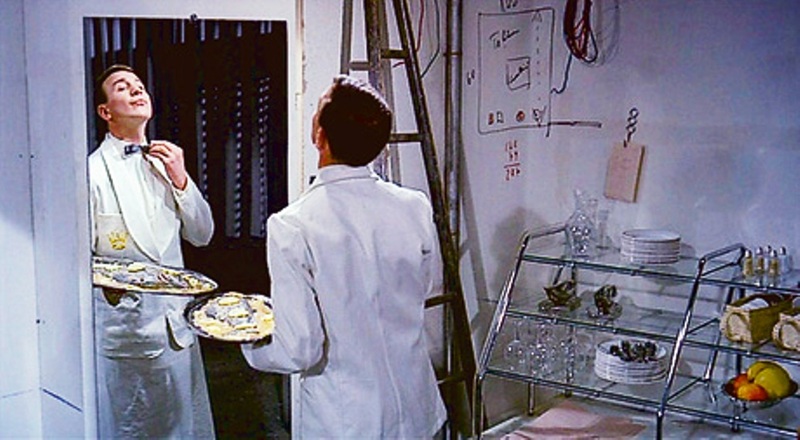 Others disliked its nearly plot-less story line, while those who only saw a single showing frequently missed the intricate, sometimes simultaneous comic sight gags performed in the various group scenes. 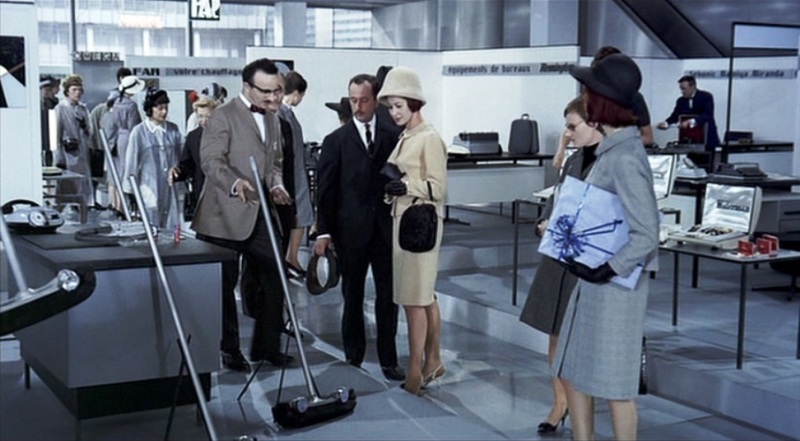 A final reason for the film’s poor reception may have been its release date; while the film’s satire of modern life may have been cutting-edge when first conceptualized in 1959, by the end of 1967 such themes were old-hat to film audiences. His journey was a long one, ten years in all. At the end of the road, there was ignominy and bankruptcy. 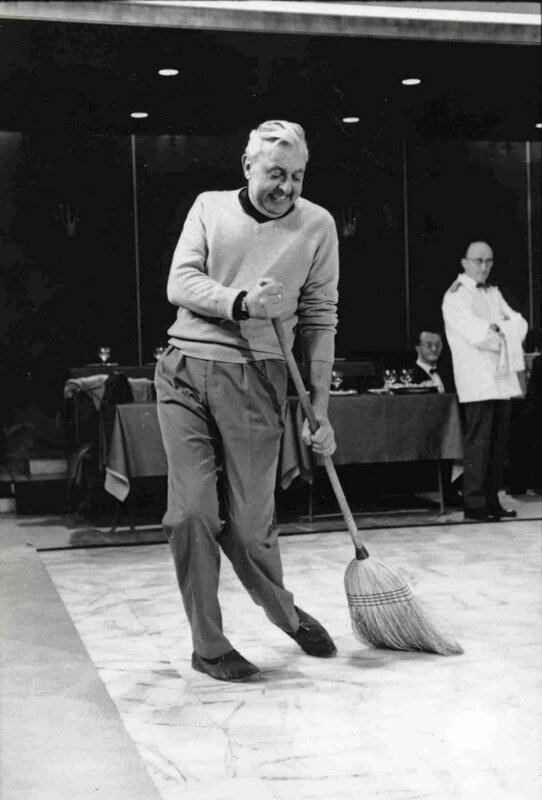 He got back on his feet in 1977, five years before his death in 1982. 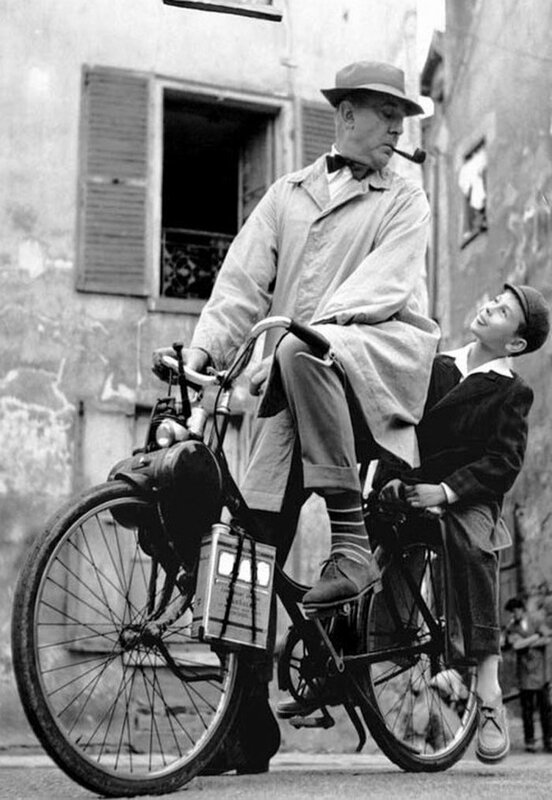 Monsieur Hulot, is a charming symbol of humanity lost in a relentlessly modernizing modern age. He was a dinosaur, a silent comedian trapped in a land of sound, a wandering poet drowning in a sea of science. 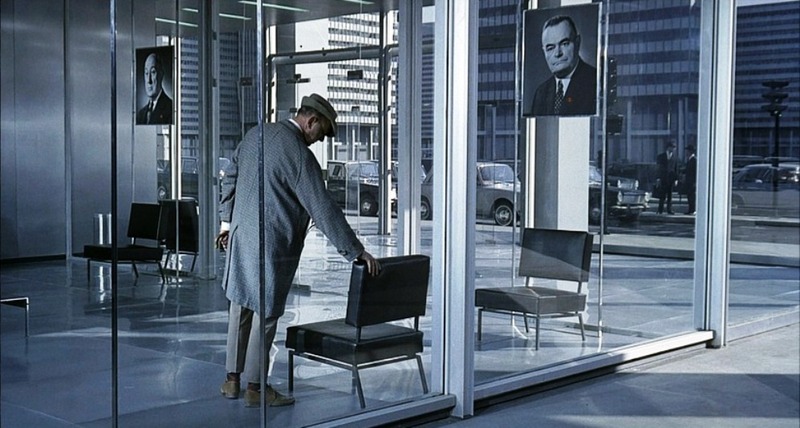 in Play Time M. Hulot himself only wanders into the action periodically, and serves chiefly as a signifier of Tati’s own wariness about the hectic, sterile world that was emerging in the mid-twentieth century. 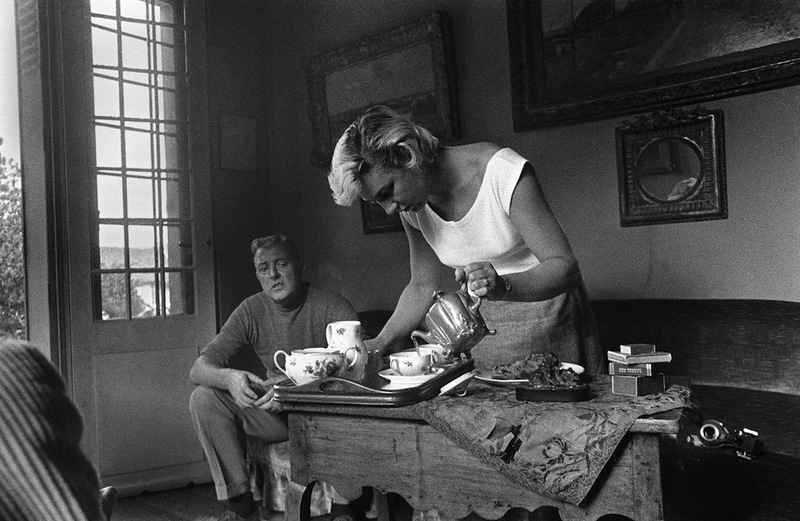 Tati’s previous film Mon Oncle (1958 ) is about the family Arpel who live together with their son Gerard in a suburban modern villa and they own all of the latest gadgets. 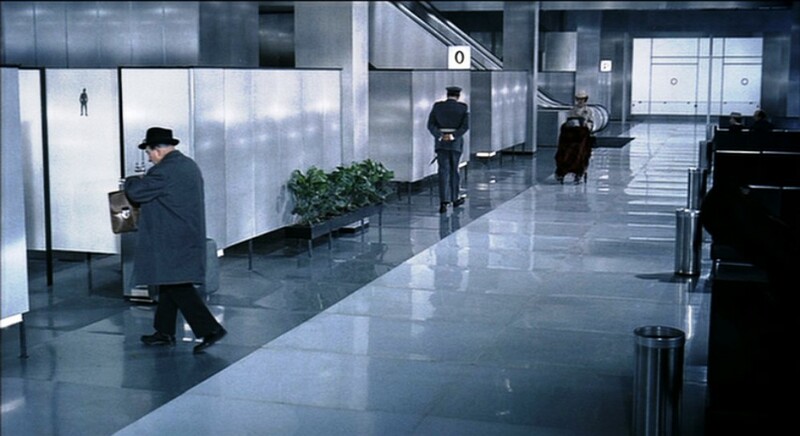 In Play Time, Hulot arrives in the newer part of the city to have a job interview, after he got fired from his job in the plastic factory. 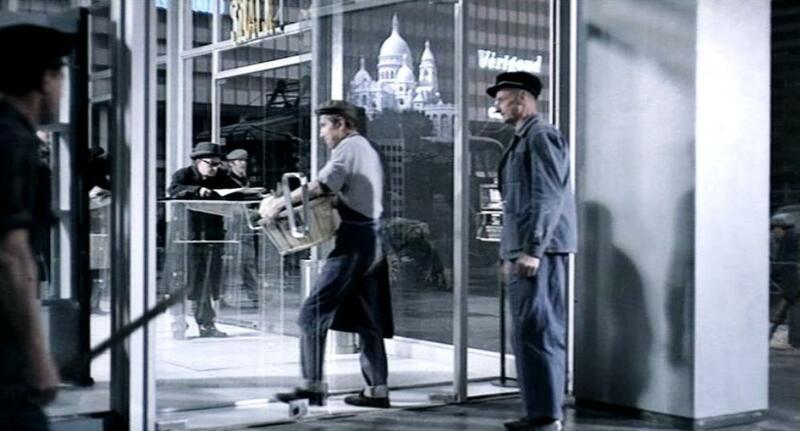 Looking for a job, Monsieur Hulot has an appointment with Mr Giffard, in an ultramodern Paris city full of glass and steel. His reactions to strange modern phenomenon are an effortless form of comedy, as are the awkward situations he finds himself in and the friends he makes along the way. However, he’s not really the main character here and this film would prove to be Tati’s most ambitious and difficult. 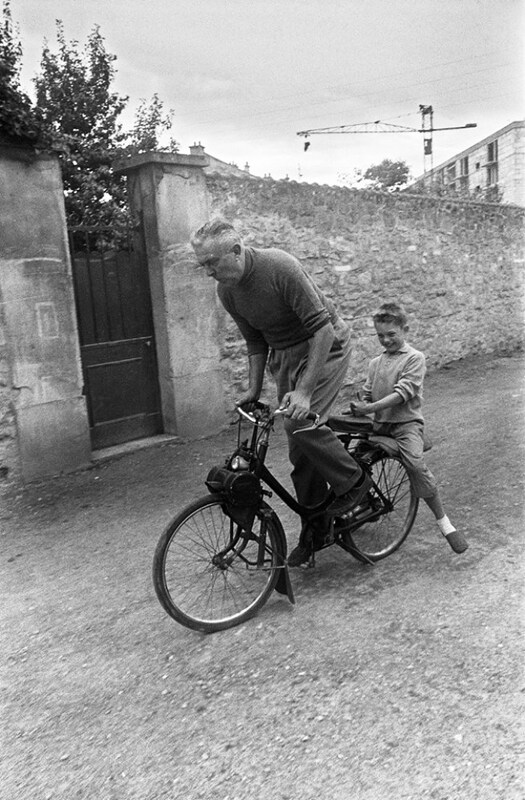 After the success of Mon Oncle in 1958, Jacques Tati had become fed up with Monsieur Hulot, his signature comic creation. 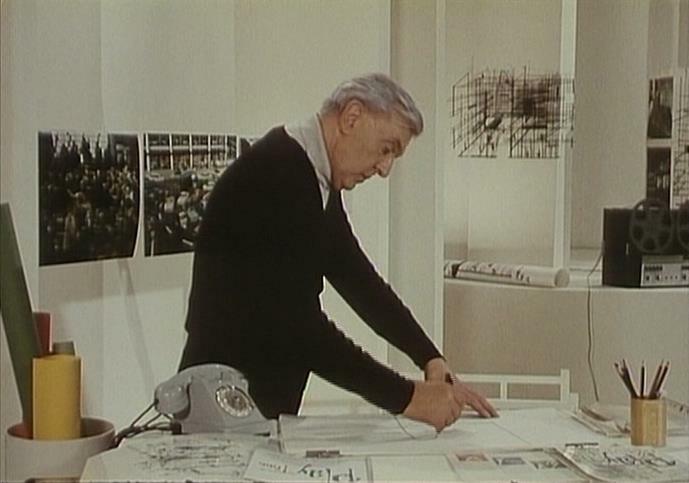 Tati studied the architecture of airports, offices, supermarkets, and other public institutions during his promotional trips for Mon Oncle, making observations that informed Play Time. 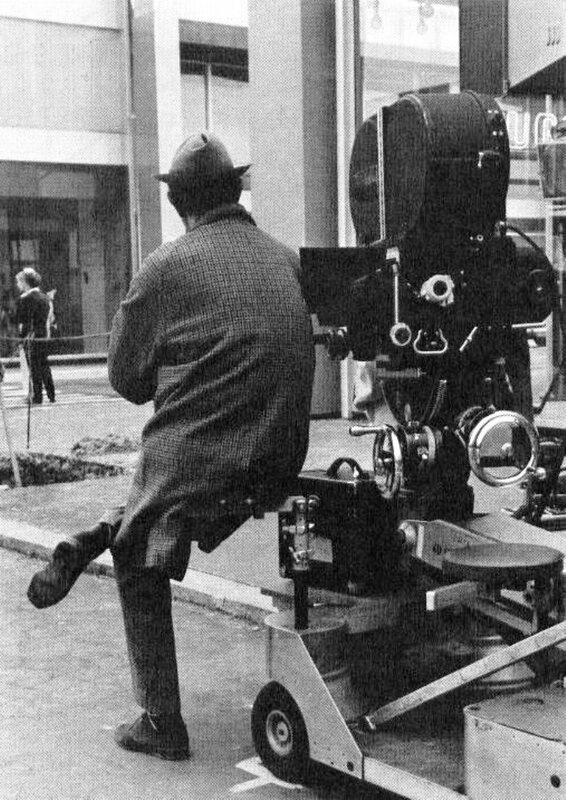 But nearly 10 years passed before Tati found uncertain financing for the expensive “Play Time,” and he wanted to move on from Hulot; to make a movie in which the characters might seem more or less equal and — just as important — more or less random, the people the film happens to come across. 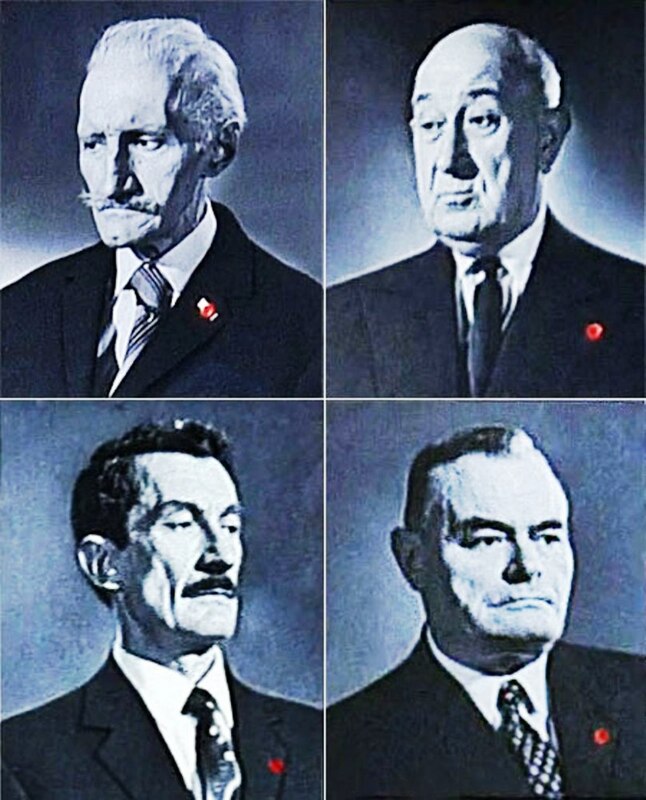 Even when he is recognized by people, M Hulot is referred to as their ‘old friend’ from the war. The false Hulots are seldom more than fleeting appearances who do not necessarily have to do anything; just as often, they are simply passers-by. 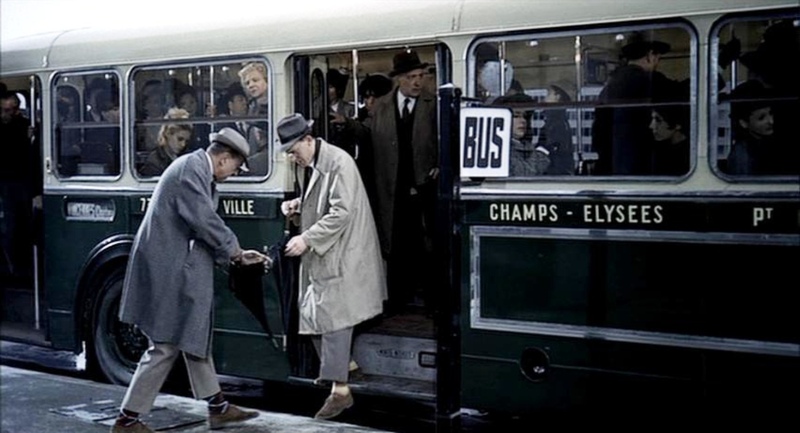 Only after four false sightings at the Airport, and only after being twice misidentified and once sternly denied: “I’m not Hulot, what are you talking about?” , do we get to see the M. Hulot, who first appears as he alights from a bus – and crosses paths with another Hulot. 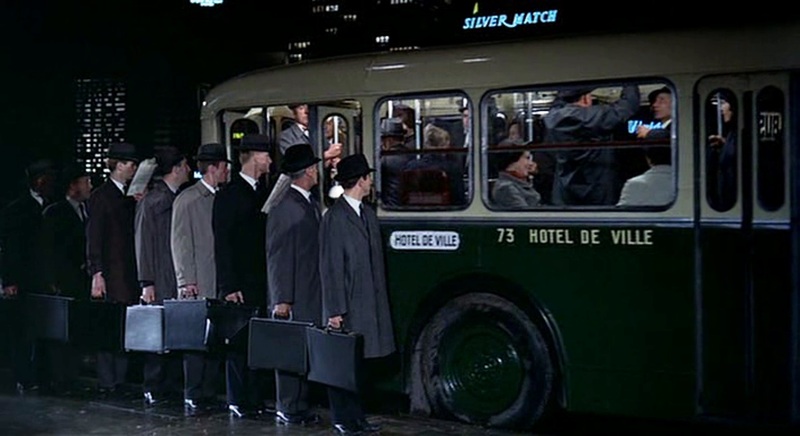 The genuine article doesn’t appear until nearly ten minutes into the movie, trying to get off a crowded Parisian bus with his umbrella entangled with that of one of his doubles. 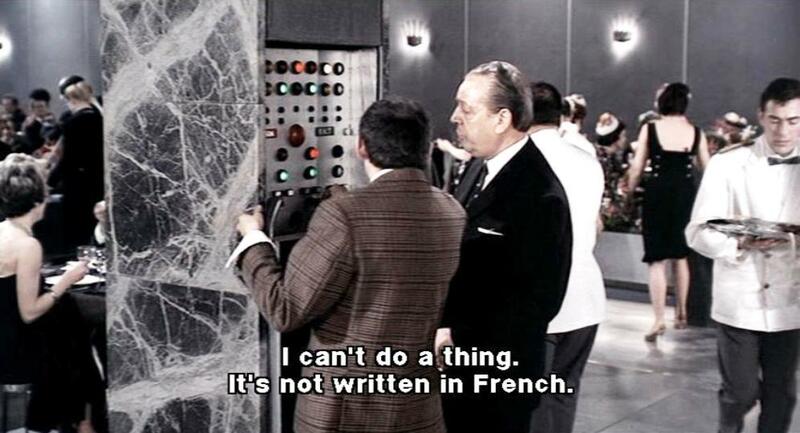 Just like the original, his “copies” are often busy disrupting the organised, regimented business of daily life (and at least one of them, it would seem, does so out of mischief), so that Hulot might indeed be seen as a type rather than an individual, or even something like a virus. And like someone carrying a virus, Hulot contaminates others around him with his off-the-grid, unwittingly Situationist behaviour. Tati appears numerous times through the film in non-Hulot roles. 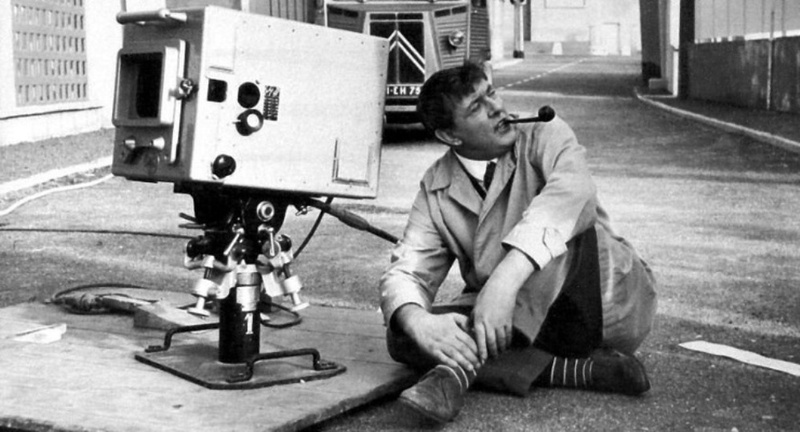 Unable to dispense with the popular character altogether, Hulot appears intermittently in Play Time, alternating between central and supporting roles. Where possible, Tati cast non-professional actors in Play Time. He wanted people whose inner essence matched their characters and who could move in the way he wanted. As part of this world of constraint, guides herd the American tourists here and there. They are enduring one of the American Express-type tours: ” If it’s Tuesday, then this must be Brussels.” One day in Paris they spend their time looking at modern gadgets at the Expo Show and not at the historic Paris of old ! 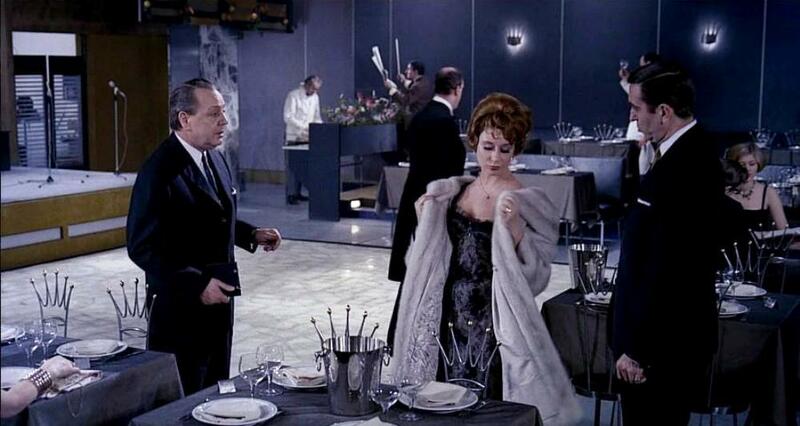 Like Martine in M. Hulot’s Holiday or the concierge’s daughter in Mon Oncle, she is the amused onlooker. She is, in one sense, a surrogate for us. She demonstrates for us the attitude of tolerant enjoyment that we should adopt (as Tati does) toward the human foibles that he films for us. But she also takes pictures, and, with her camera, she is, like Tati, a perfectionist. In that sense, Barbara mediates. She stands both for us and for Tati. She stands between us, an outsider whom we watch, yet someone we identify with. The film casually follows the activities of a group of American tourists on a day out in Paris. 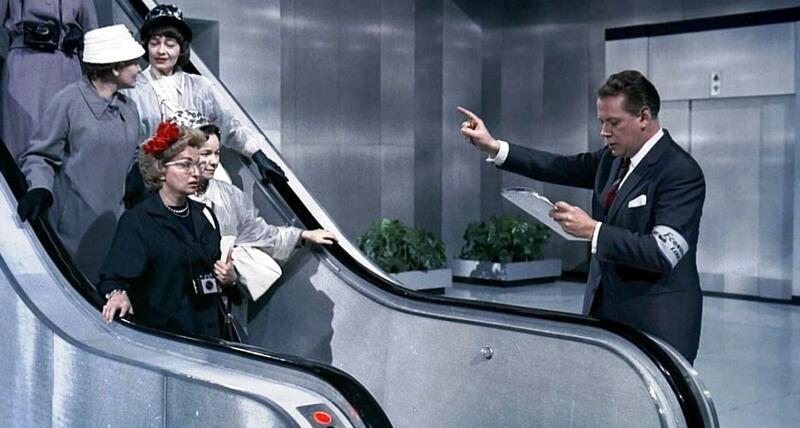 The management of the tourists is part of this standardization, they are moved around in tour groups, directed by guides, as well as the architecture, from one space to the next, often shown being directed onto escalators. Drawn to consumer showrooms and led by the nose from hotel to designated restaurant and back, the tourists uniformly collect Eiffel Tower knick-knacks, but can’t seem to see the monument’s essence any more than we can in its two-dimensional appearance on a travel poster or its fleeting reflection in a glass door. 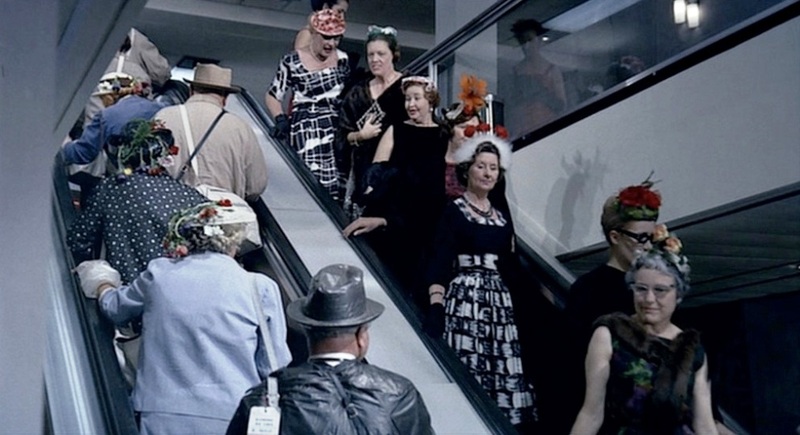 This group of tourists is shown in their hotel on a ‘down’ escalator, headed out for the evening. On the opposite ‘up’ escalator a tired looking group of tourists appears to be returning to the hotel from their day of site-seeing. In this modernized world, uniformity is synonymous with sophistication. The tourists are portrayed as unsophisticated as they do not integrate into the overly designed surroundings. The locals, on the other hand are integrated to the point that they become part of the setting and part of the sites that these tourists are viewing. The American tourists are immediately corralled by waiters off to the side, away from the Parisian diners. They receive negative attention from the local clientele who make comments such as “how tourist” and “it’s a flood of tourists”. The dresses worn by the American women stand out from the neutrality of the crowd and setting, as does their attitude. Particular attention is given to the green colour of one of the tourist’s dress. The woman in red seems especially excited by the prospect of dancing and joyously ignorant of the demure disposition of the locals around her. 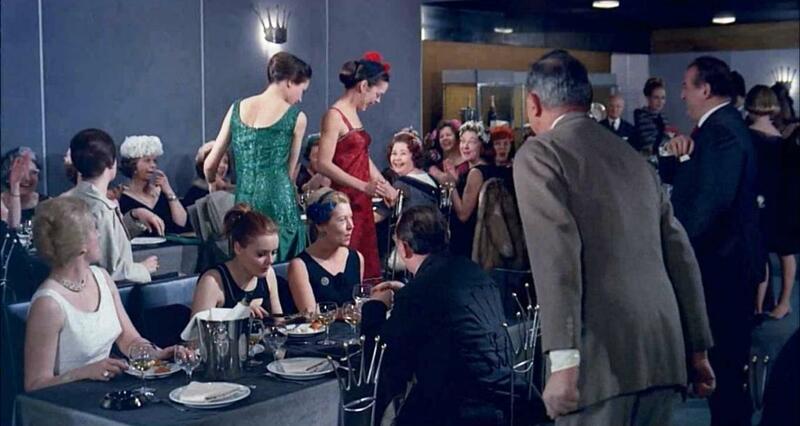 Barbara ( green dress ) and a friend ( red dress ) have just excitedly agreed to dance with two French men at the restaurant. The running gag throughout Play Time is that modern culture has eaten the old world. 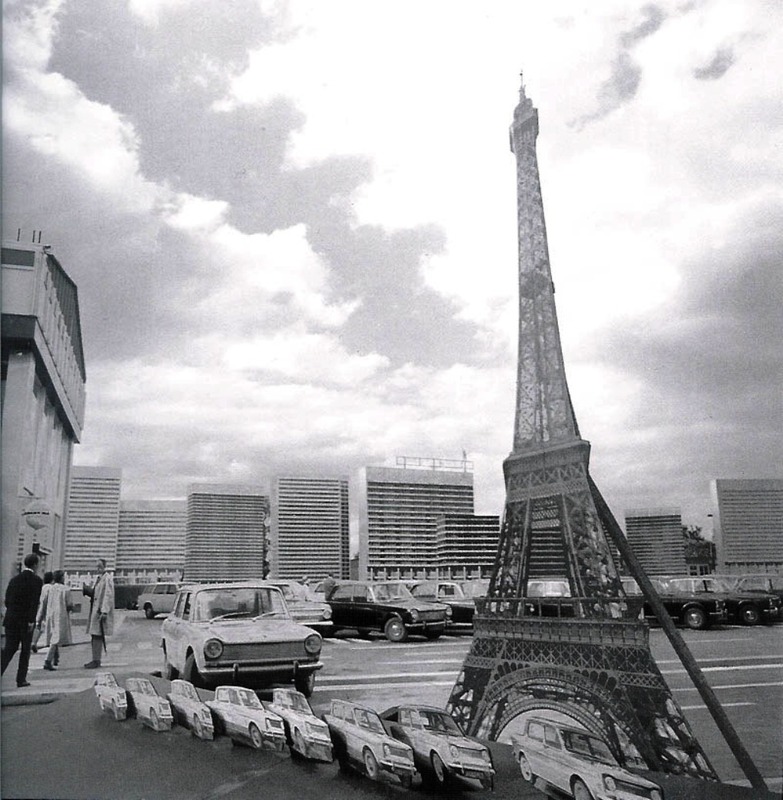 As part of his concern with connections between people and nations, Tati plays with the Americanization of Europe and, in particular, Paris. 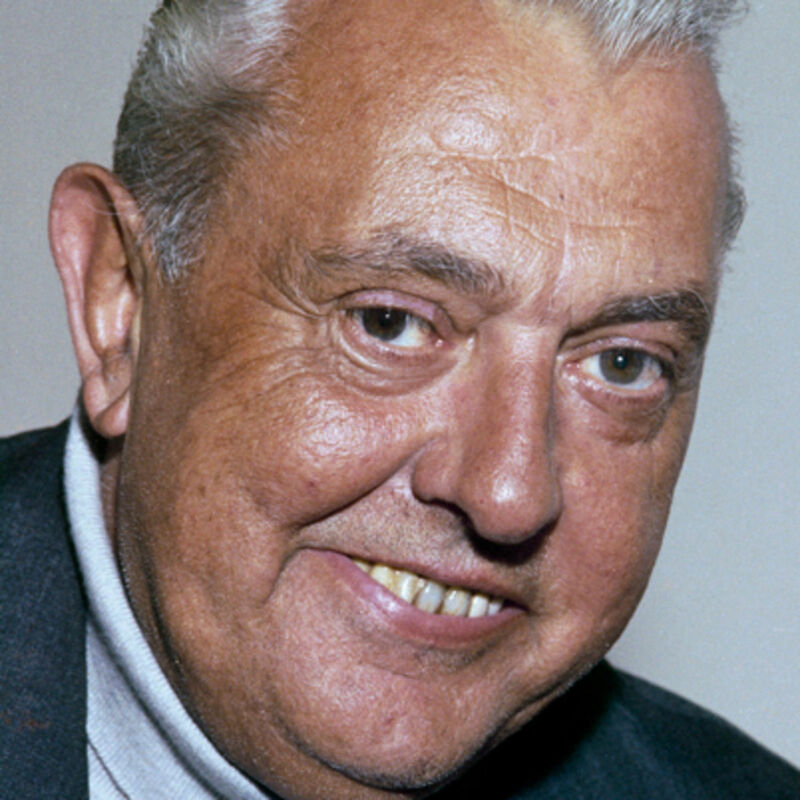 a) Mr. Lacs (John Abbey), an American businessman obsessed with neatness and business. 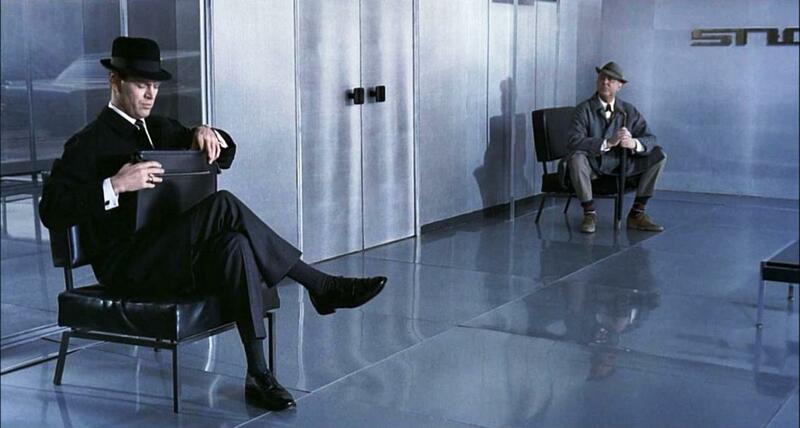 He joins M. Hulot in the waiting room, but he is all efficiency as opposed to M. Hulot who is all bumble. Lacs turns up later in the restaurant. He is loud, rude, intrusive and abusive. He throws his money around. 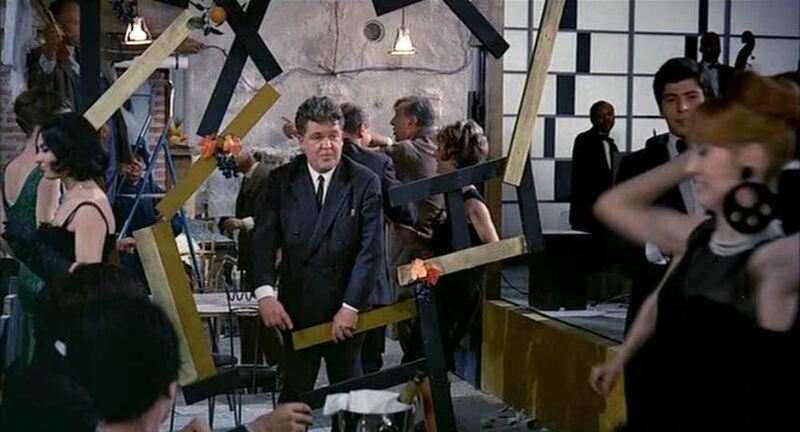 But he turns out to be the joyous Bacchus who provides the party spirit for the second half of the movie. And he won’t let Lacs into the impromptu bistro he sets up as he is too preoccupied with business. 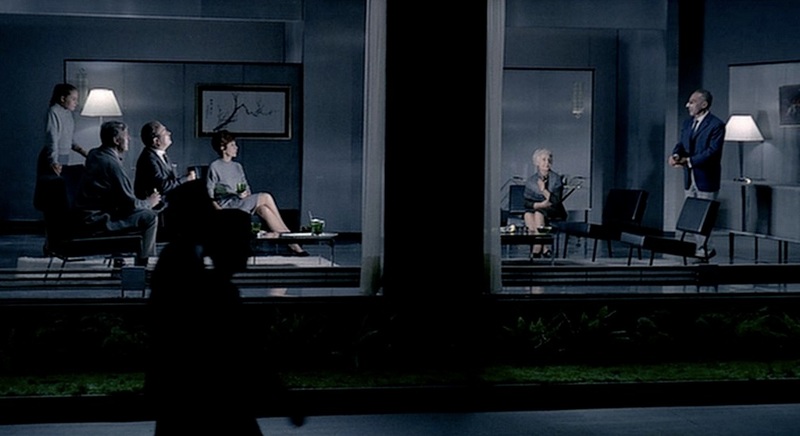 One of the themes of the film was that working in the modern, business world turns people into robots and the world becomes a very dull place. The conformity which could not be found in the tourists, however, is accustomed to the office workers. 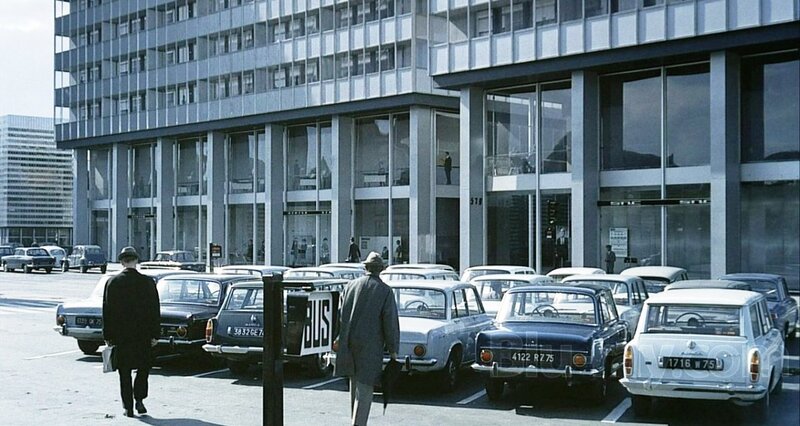 The office workers get to work at the same time, walk to their cars ( 1964 Simca 1300 GL ) , start the engines and drive off with almost an exact gestures and timing. By using muted colors, Tati was successful in avoiding vibrant colors that would have shattered his intentions to show the lifelessness that can come about in a world filled with career-driven, business workers. 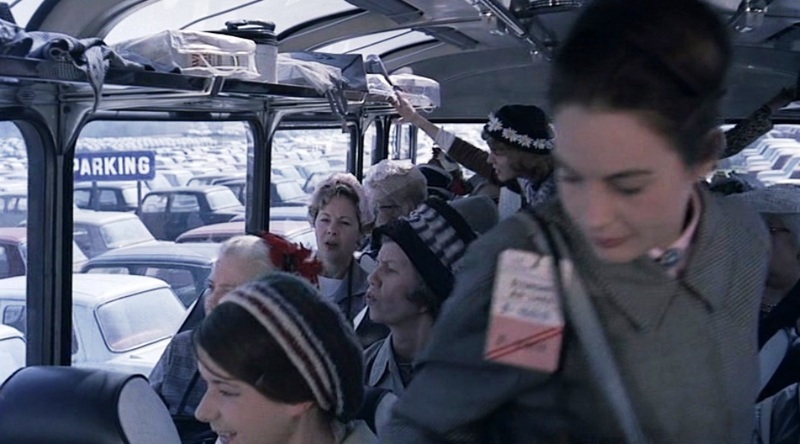 The hundreds of white-collared workers in the film seemed to be on a tight schedule and were always in a rush to get to their destination. Every person drove the same car and everyone even dressed similar with top hats and formal clothes. 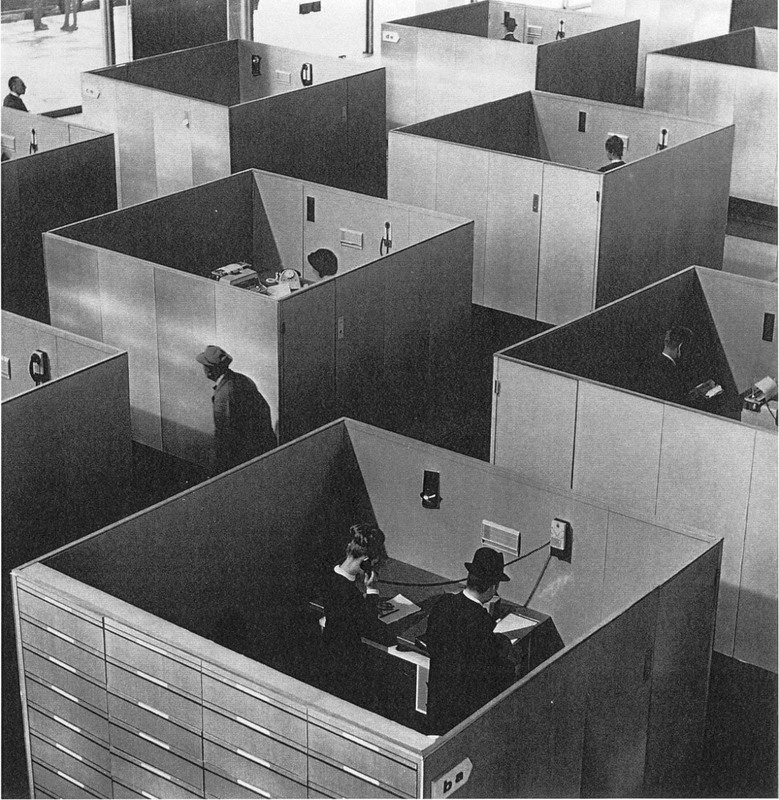 Each person worked and lived in the same cubicle. Each person is focused on his or herself and their ultimate focus is their work. Each person walked in straight lines and turned on sharp right angles. 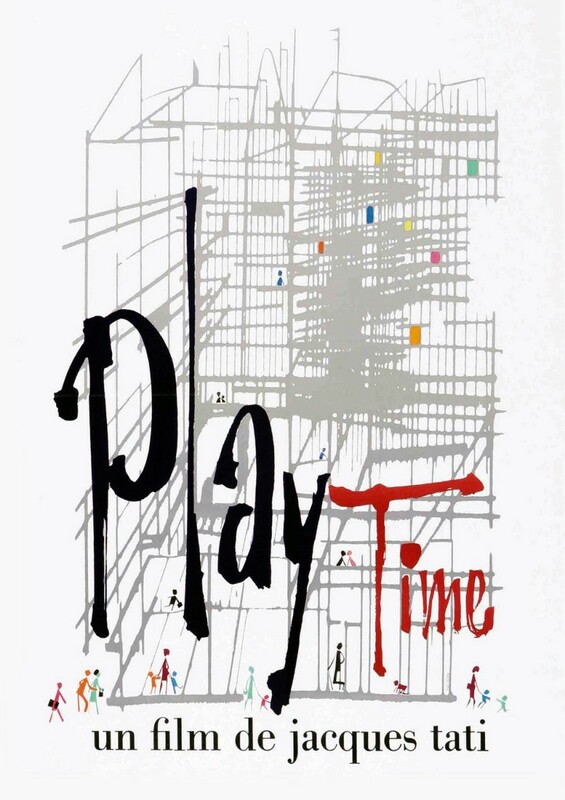 Tati’s “Play Time” is a critique on modernism and its contemporary architectural stylings. 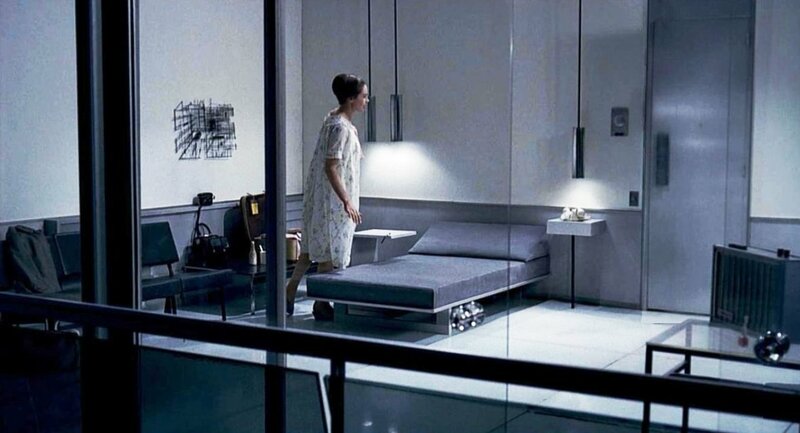 As it is entirely shot on built sets, Tati has incorporated steel, glass, and concrete, the “holy trinity” of modernist architectural materiality, into nearly every shot. 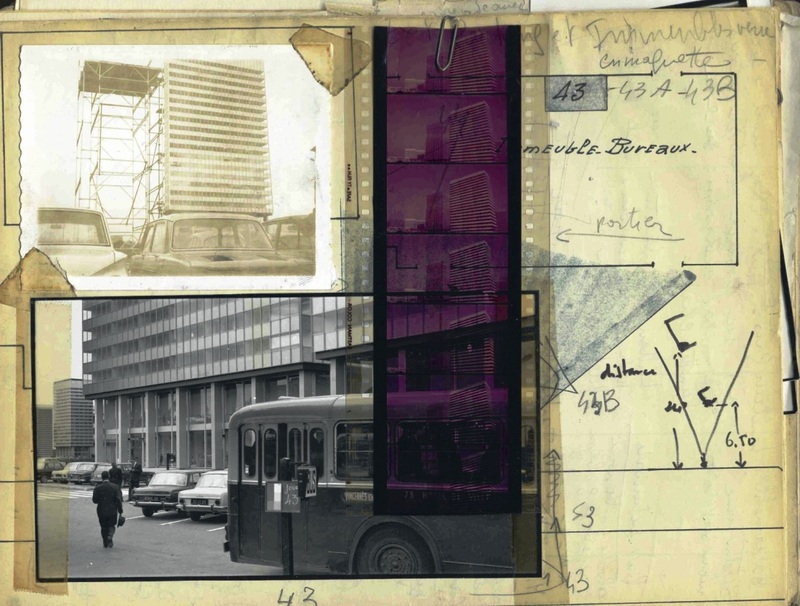 Tati’s focus on the physical makeup of the space we inhabit, experience, and move through and begs us to analyse and pay more attention to the modernist world built around us and how it changes the way we interact with each other in the world. 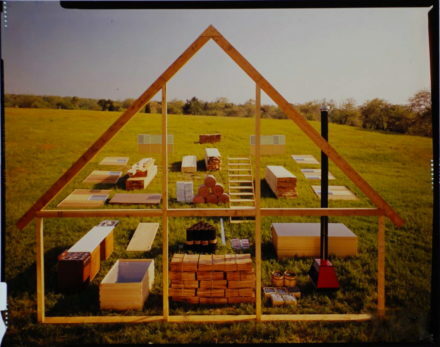 Play Time is not a manifesto against modern architecture or modernity in general. 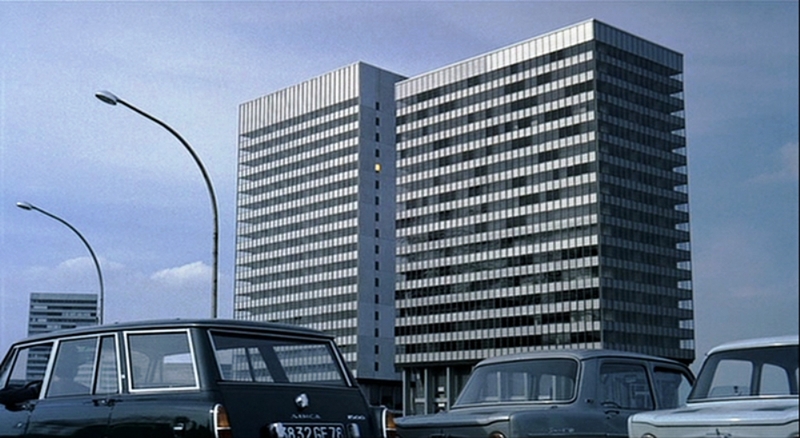 Tati ……….. ” that if he had been against modern architecture, he’d have shown ugly buildings ” .. he did the opposite. 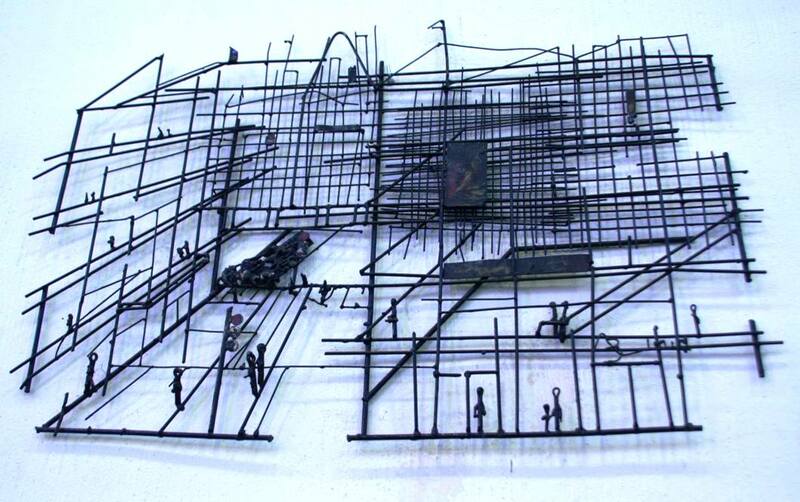 Tativille’s metal and glass landscapes can be bleak, desolate even, but you cannot fail to register their austere beauty, which is not accidental as it was planned down to the minutest detail. 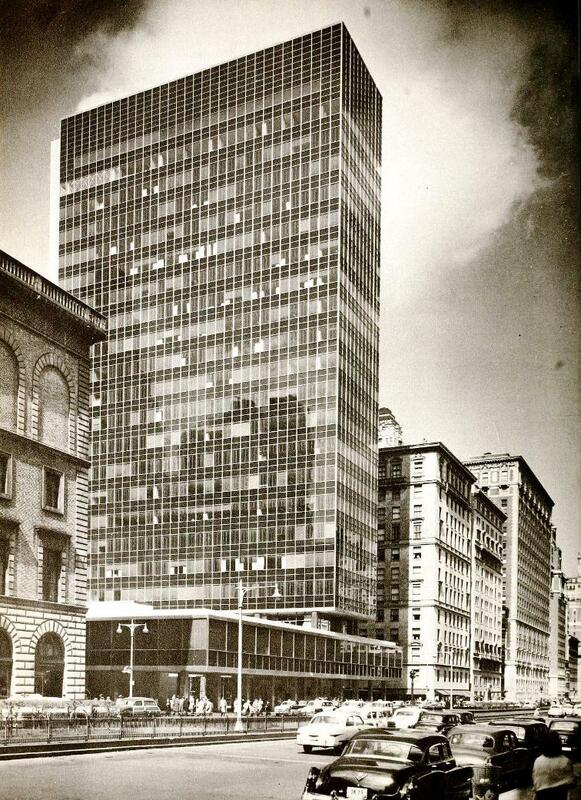 In the 1950s and 60s a number of these hermetically sealed ‘glass boxes’ were built in New York and expressed the city’s commercial and cultural dominance. 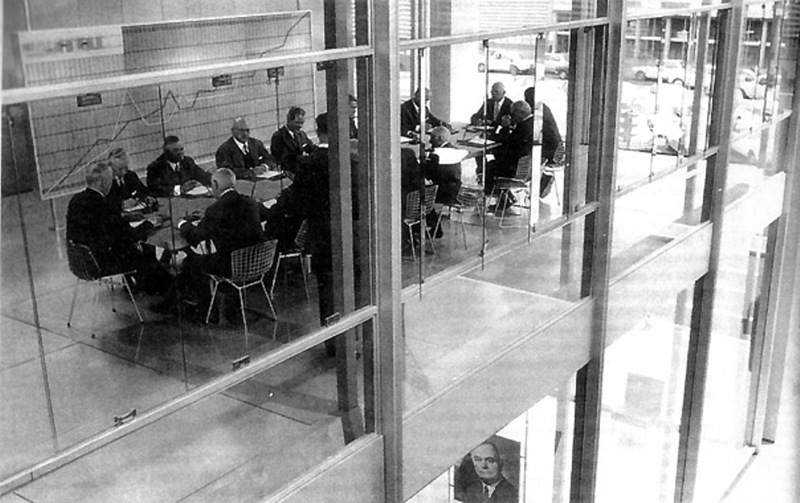 The Lever House (1952) of Skidmore, Owings & Merrill and the Seagram Building (1958) made by Mies van der Rohe were the first project to offer the modernist image of efficiency and standardisation to a corporate client. 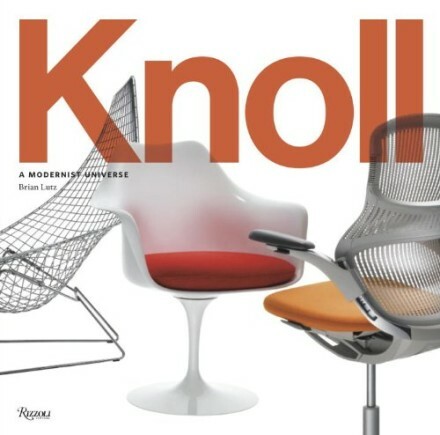 The large sculpture on the plaza and the elegant high modernist interior, epitomised by interior designers such as the Knoll planning unit, became the new international language of business and success. 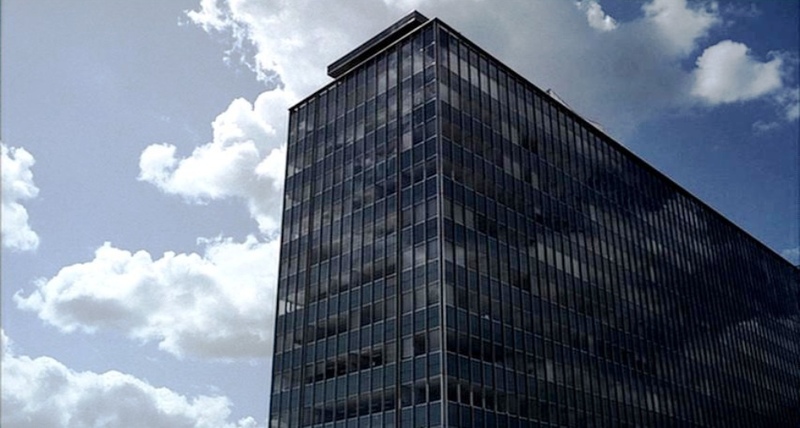 With the widespread use of air-conditioning and fluorescent lighting, these new high-rise buildings could have highly efficient deep and open floors. 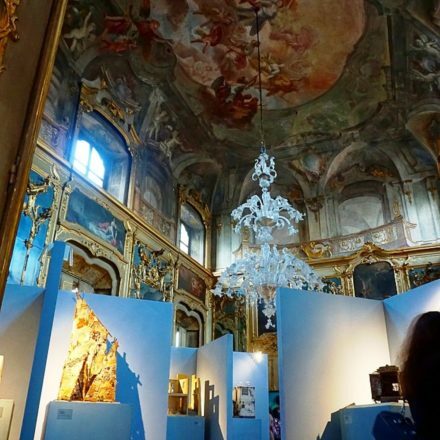 There was now no longer an imperative to have natural lighting, whether from windows or skylights, or to be near an opening window for ventilation. The suspended ceiling took over these functions, containing lighting and air distribution. The office had successfully become fully autonomous from the exterior environment. This formula was influential worldwide. 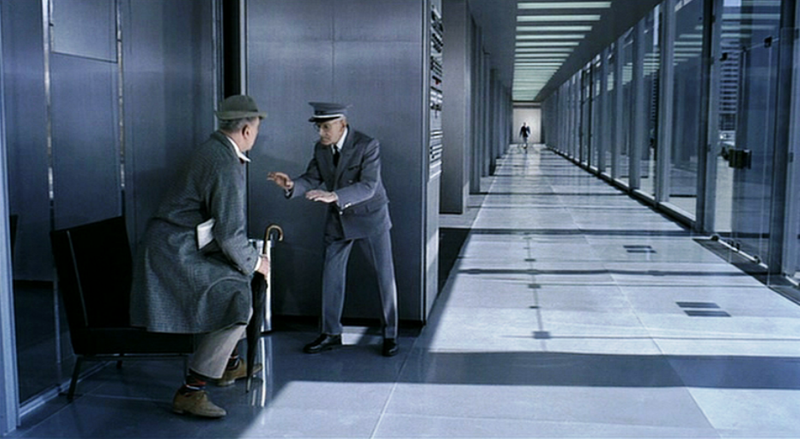 Tati was probably inspired by the American modern architecture that he saw during his visit to the USA, when Mon Oncle got released there. 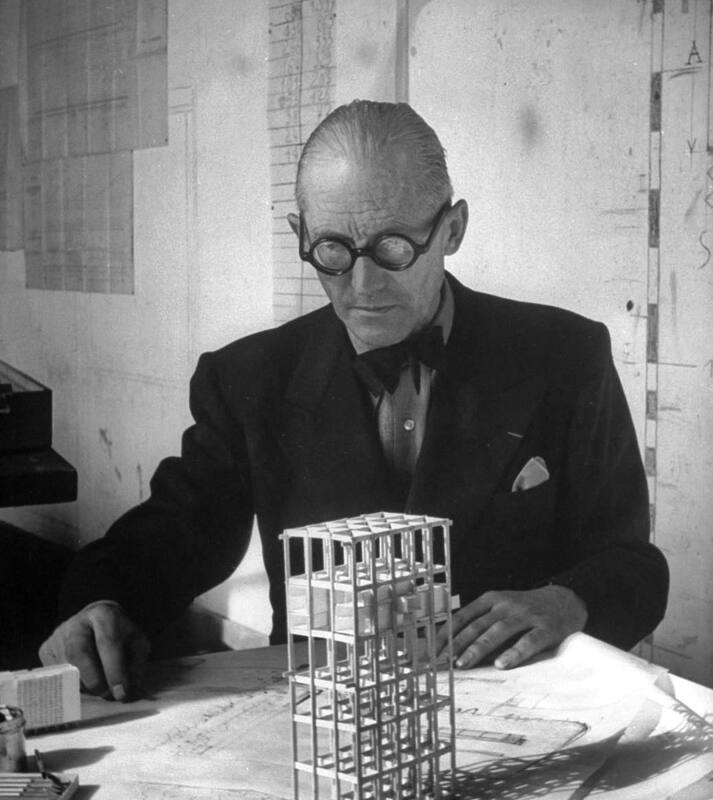 Le Corbusier, father of modern architecture, had a strong argument on how architecture and cities should behave. He mentioned that everything should be in a form of a mass production and a standardization. Everything should be arranged and perform its function efficiently. It should be a system. 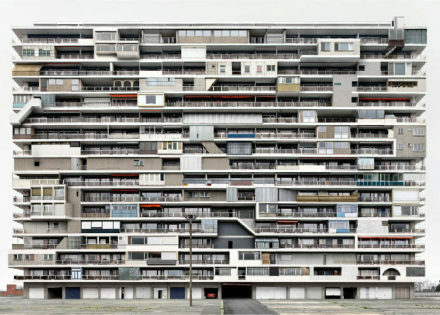 Le Corbusier’s city is homogeneous, identical and uniform. Modernism neutralizes everything. Individuals are the same, they dress the same, and act the same. Foreigners cannot be differentiated unless they speak. Same types of dresses, same car, same unit of houses, make everything seems ordinary. In Play Time Tati is mocking Corbusier’s modern architecture showing a unique and funny side of how modernism can effect and cause problem to a new comer of the city. The big joke of Play Time is that the generic universal space of modernism engenders an ambiguity so profound as to be unsuitable to the specificity of human life. 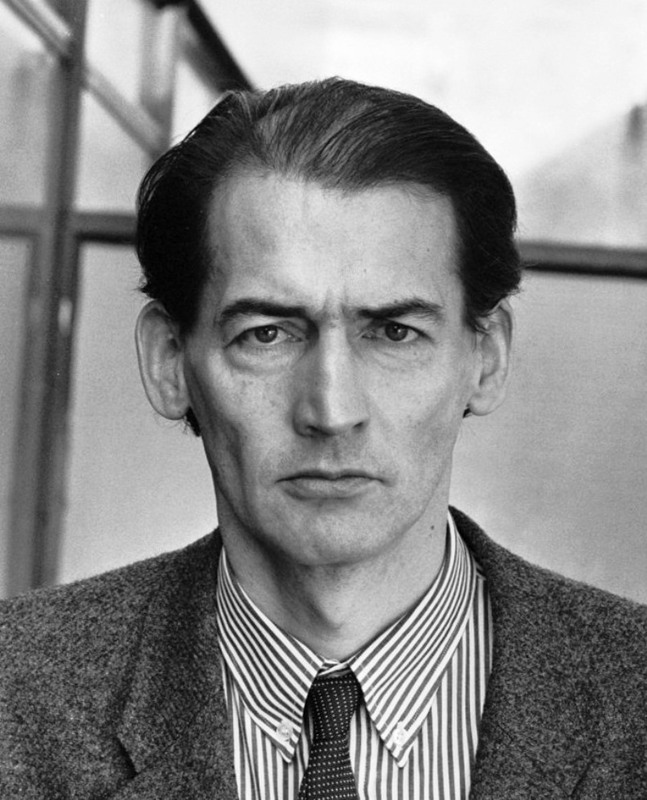 Almost 20 years ago the Dutch architect Rem Koolhaas proclaimed: “The city is no longer” in his essay ‘The Generic City’. A generic city is a city without properties. It is non-specific. Everything looks the same and it looks like any other modern city. And even if the city still contains city specific sights, because of tourism the historical character is reduced to a superficial iconic value. The square office worker cubicles are echoed in the shots of the square cubed apartments and then again in the square, ordered, lined tables of the Royal Garden. 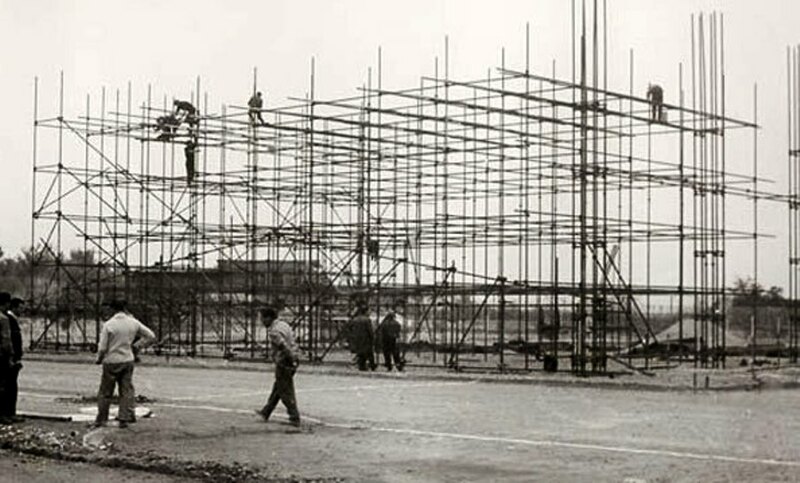 Even though Corbusier wanted to make everything identical and function efficiently, Tati worried about the indiscriminate proliferation of modules everywhere, without concern for suitability, adaptability or the diminishing returns of repetition. 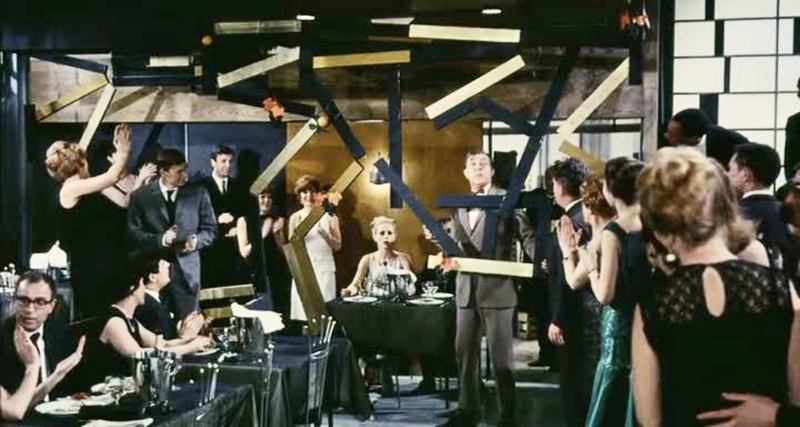 The architecture and the set design creates the space for the parody, as the modern, crisp, structure presents order while the actions of the characters are unordered, creating the humor. The comedy of the film comes from the irony of a world attempting order but filled with disorder. 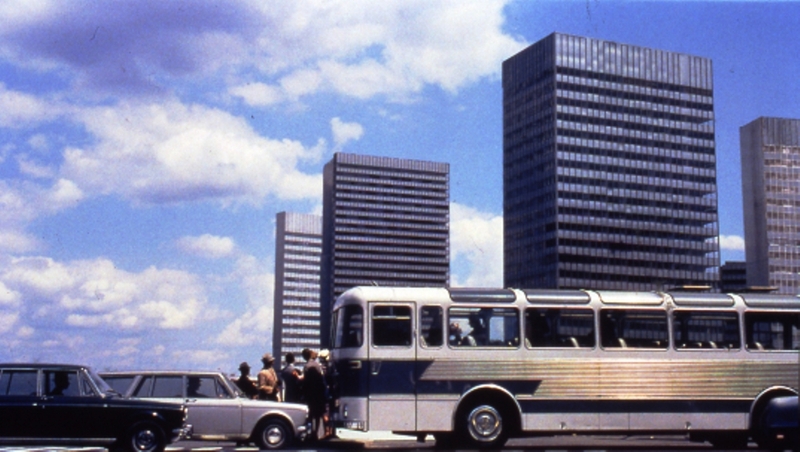 The kind of progress Tati opposed was rigid, unaccommodating, it elbowed out any way of life that did not fit its patterns: no doubt, cities made up of endless rows of identical buildings would require undifferentiated people to inhabit them. 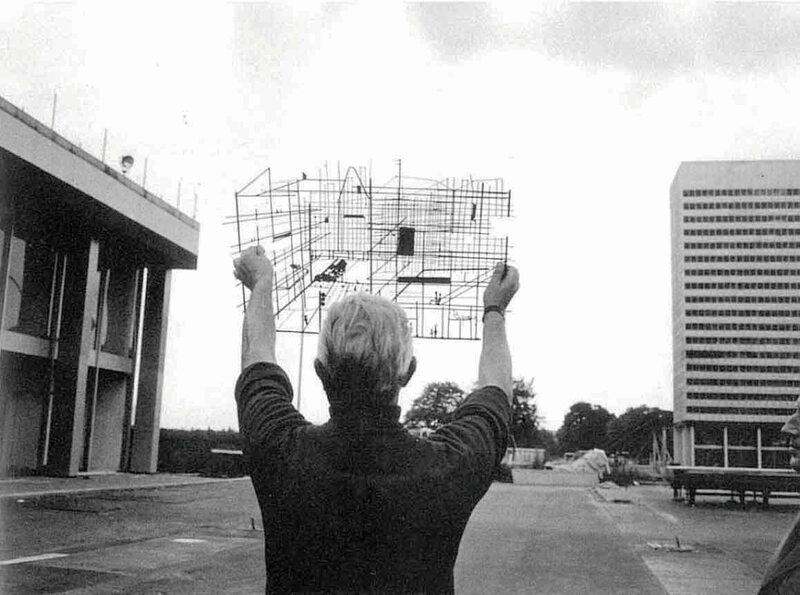 “In the first part of Play Time, I direct the people to follow the architect’s guidelines. 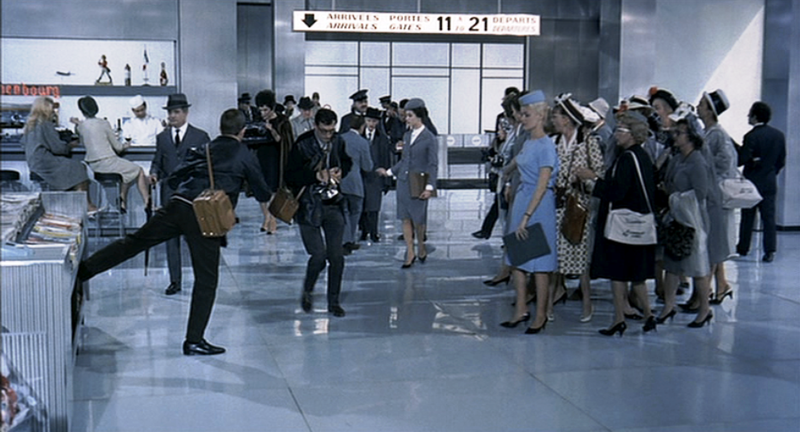 Everybody is filmed as if moving in straight lines and feeling prisoners of their surroundings. Modern architecture would like typists to sit straight, would like everyone to take themselves very seriously. 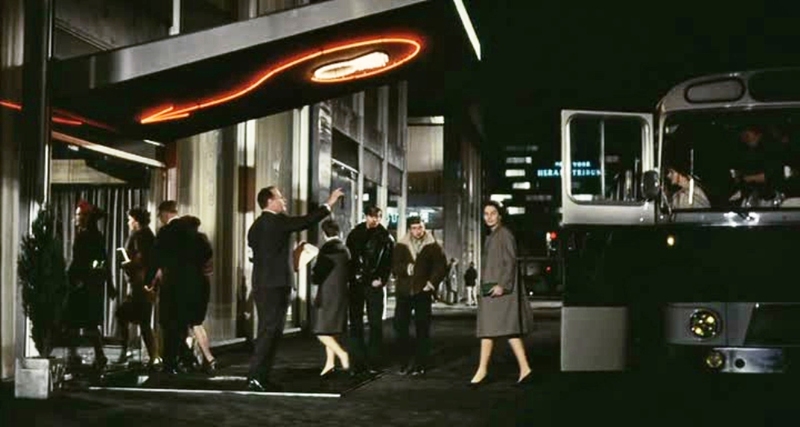 In the first part of the film, the architecture plays a leading role but gradually, warm, contact and friendship as well as the individual I defend, take over this international setting and then neon advertisements make their entrance and the world starts to swirl and it all ends up in a merry-go-round. This progression is carried out in numerous ways. 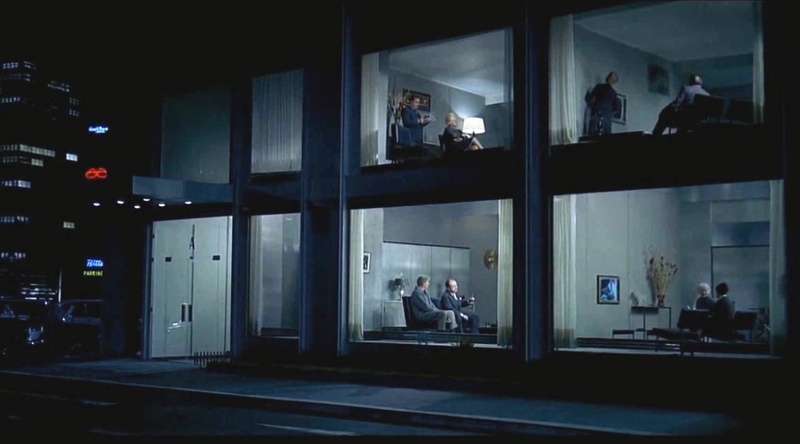 The opening sequences are all about people moving in rigid straight lines; living within the boundaries that modernity has laid out for them. The entire environment is constructed to maximise organisation. 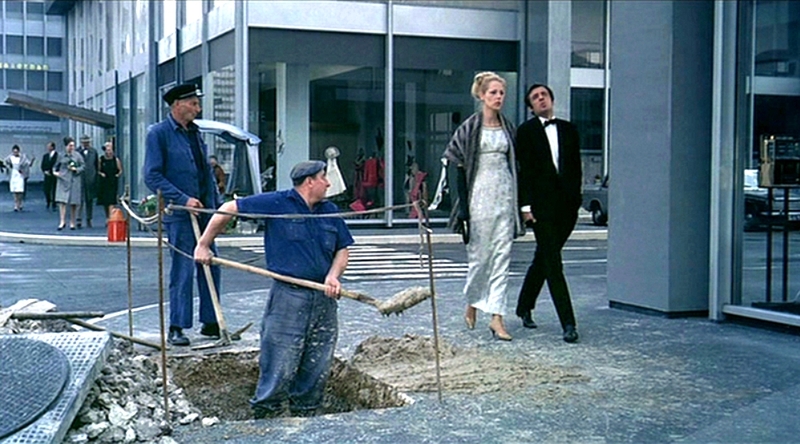 Only working-class construction workers (representing Hulot’s ‘old Paris’, celebrated in Mon Oncle) and two music-loving teenagers move in a curvaceous and naturally human way. The conformity of the people, although being portrayed in the clothes they are wearing or even the behavior, in which they are trying to walk in a group or a line; they couldn’t help but make a scene and chaos. This very much contradicts to the rigid and organized setting of the airport and the officers, showing that people, by nature, could not restraint or limit themselves to the highly strict regulations or style. 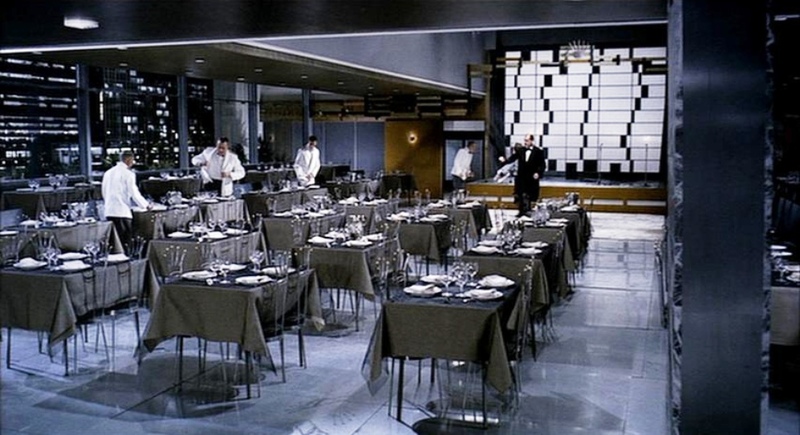 Some of this robot like behavior begins to loosen in the restaurant scene near the end of the film, as the participants set aside their assigned roles and learn to enjoy themselves after a plague of opening-night disasters. 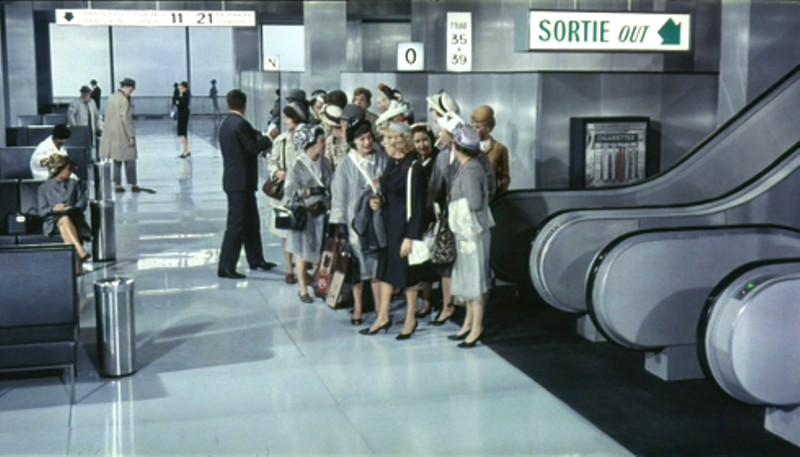 Throughout the film, the American tourists are continually lined up and counted, though Barbara keeps escaping and must be frequently called back to conform with the others. 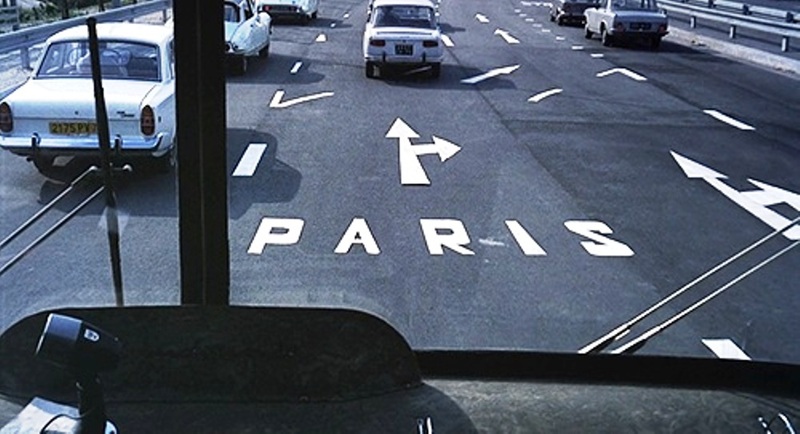 By the end, she has united the curve and the line – Hulot’s gift, a square scarf ( with iconic Parisian sights ), is fitted to her round head; her straight bus ride back to the airport becomes lost in a seemingly endless traffic circle that has the atmosphere of a carnival ride. Happily, however, the drive towards organisation cannot quite keep up, and as it progressively falters, so do the denizens of Tativille unwind. This movement is accompanied by a gradual increase in vibrant colours. One of the sight-seeing destinations for the group of American tourists, is a travel agency covered in near-identical posters representing travel destinations all over the world. 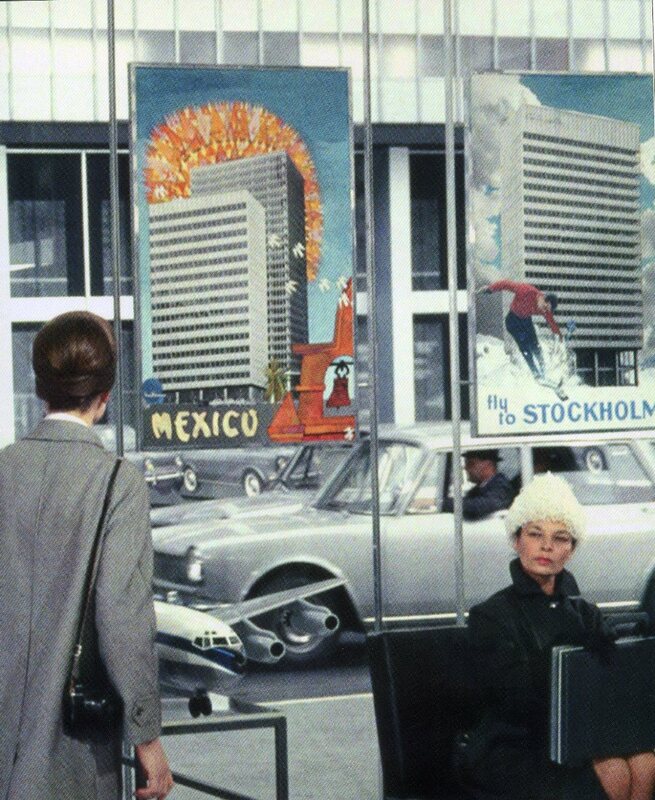 The Posters show the same juxtaposing building and are not at all different – one could hardly tell where the scene is actually located. The idea of the clean lined approach to buildings and furniture is seen to be a negative and comical extravagance as the buildings are hard to navigate and the furniture functions poorly. Everything seems fairly standard until he presses on the upholstery, air is then squeezed out of the seams, creating a vacuum within. The comical aspect is the air’s amusing popping noise as the fabric expands to let air in again. 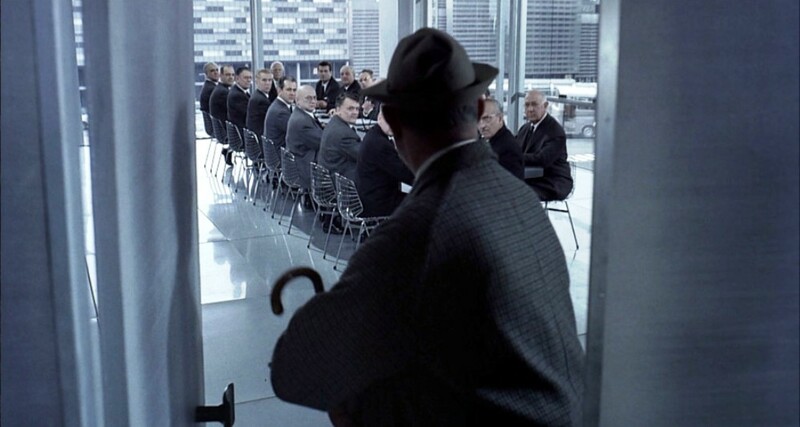 Multiple other times during the film the same designed chair makes this noise, becoming increasingly hilarious the more times it happens. The design of the 3 legged bar stool is modern in its fabrication, boasting steel construction that appears very stable as the legs do taper to a wider stance at the bottom, however in reality the stool itself is fairly easy for a drunk person to tip it. Multiple times the stool is toppled by an intoxicated bar patron, creating comic visuals., as the person is quickly ejected out of the club as soon as he becomes to drunk to sit on the stool. Another poorly designed furniture item are the restaurant chairs used by the patrons to sit on at the dining tables. Glass is the key element of Play time. 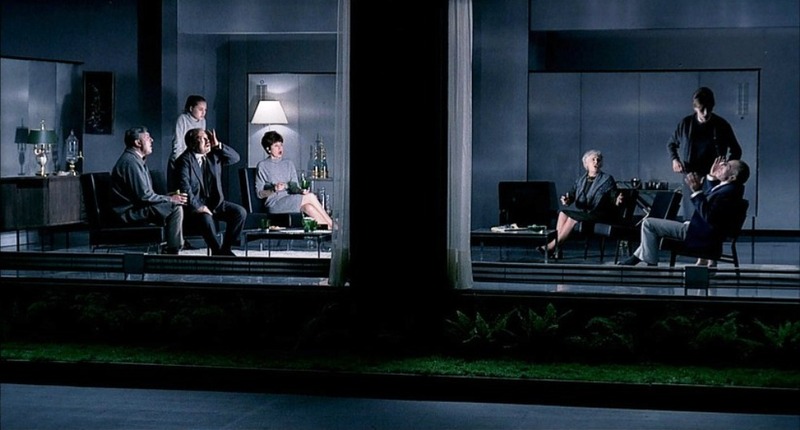 The presence of this transparent, invisible material that is normality in the modernist society is suddenly brought to the visual forefront in the film. Tati believes that the invisible barrier of glass adds to this atmosphere. With glass, Tati focuses on not only their division of rooms in space, but their visual effect, their brittleness, seemingly smooth and perfect surfaces, and their tactility. Glazing is unique in architecture as the material that allows sight across its bounds, but not movement. None of the patrons notice, or even seem to care, except for the people in charge of maintaining the place. The relentless transparency repels occupation – people seem as trapped inside as a deer in headlights – and provides a visual sense of unity that is ultimately a frustrating illusion. 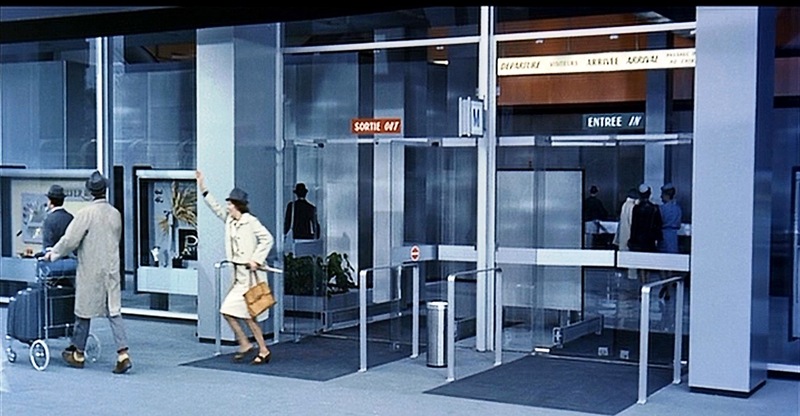 We encounter this theme very early in the film, when a man with a cigarette leans in towards a security guard to get a light, only to be waved brusquely away. 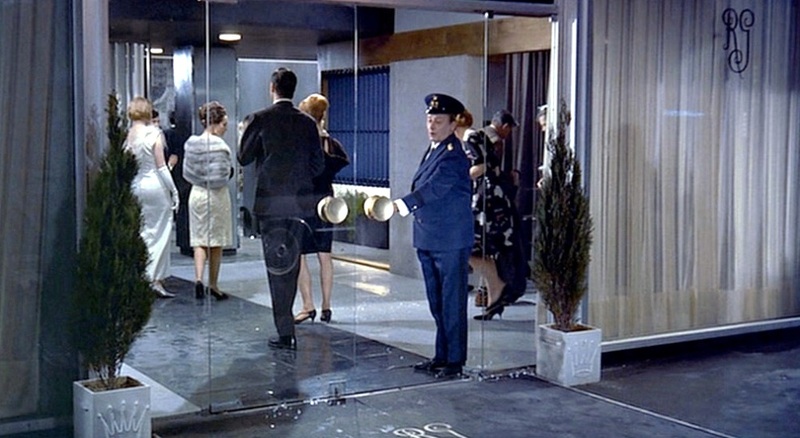 For a split-second, we think the guard is simply being rude, until we realize that he’s waving the man with the cigarette away because they are on opposite sides of a huge pane of glass. Glass would seem to let us make connections, but here it only adds to the confusion with reflections that create the illusion of connection: the glass panels and doors of the office block; the windows of the tourists’ bus; the “real” Paris reflected in glass. 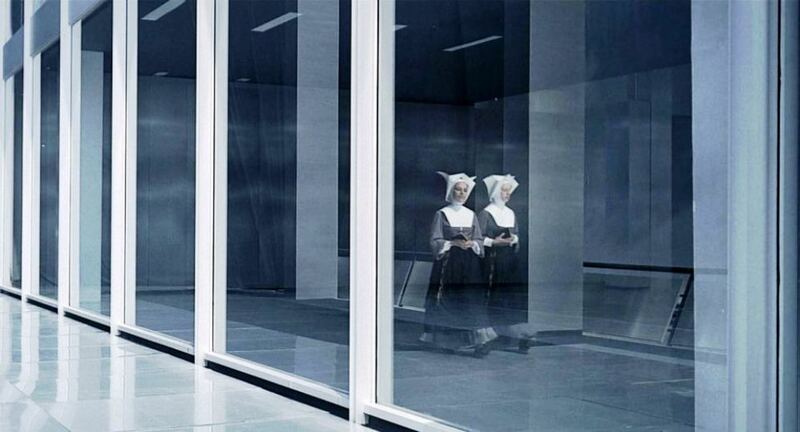 Interestingly for a film that derives so much from glass, no use is made of mirrors. In fact, mirrors may be absent altogether. 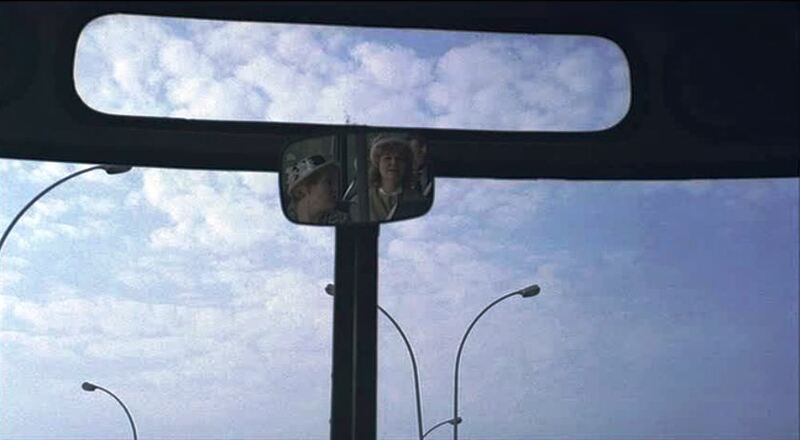 But even without mirrors, Hulot multiplies; and, as nearly everything about this film, this multiplicity admits of almost opposed readings. 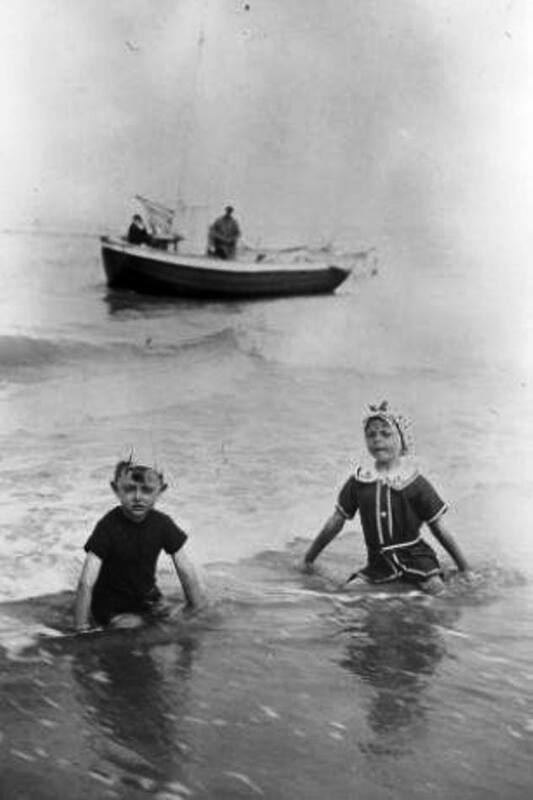 In large part Play Time is about our human need to make connections with other humans as tourists, as business people, customers, and so on. 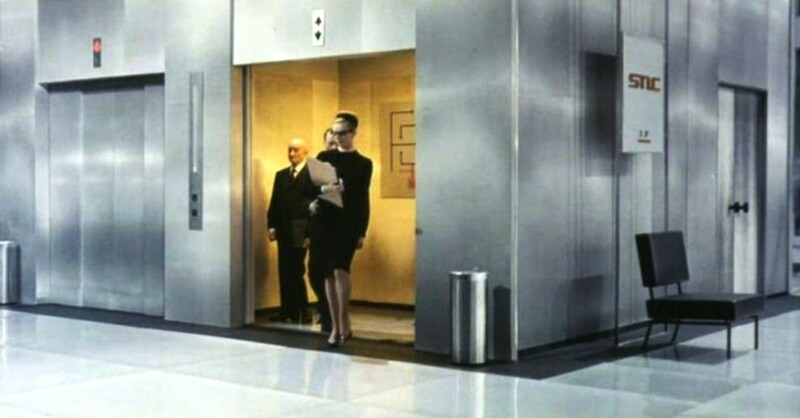 Doors allow connections, and Tati plays constantly with doors in this film. There are all the confusing glass doors in the office block, the non-door to the night club, and a silent door that makes no noise when you knock on it, plus any number of doors that make noises when openend. 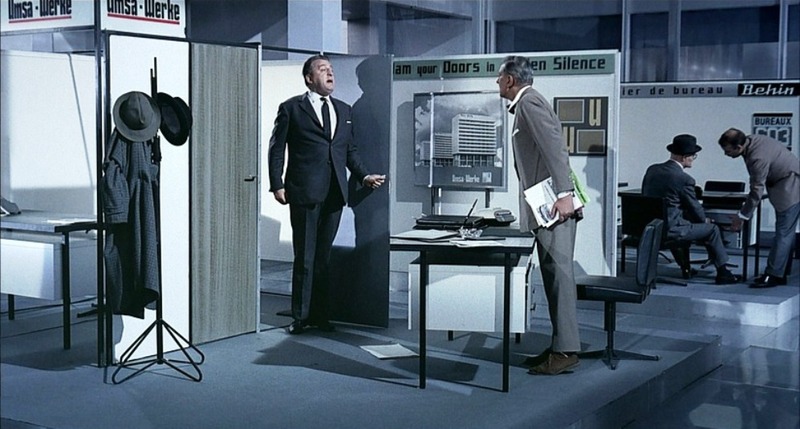 There is even a character derived from doors eg M. Giffard (Georges Montant) is a functionary in French government and business buildings who opens and closes doors and runs other errands. 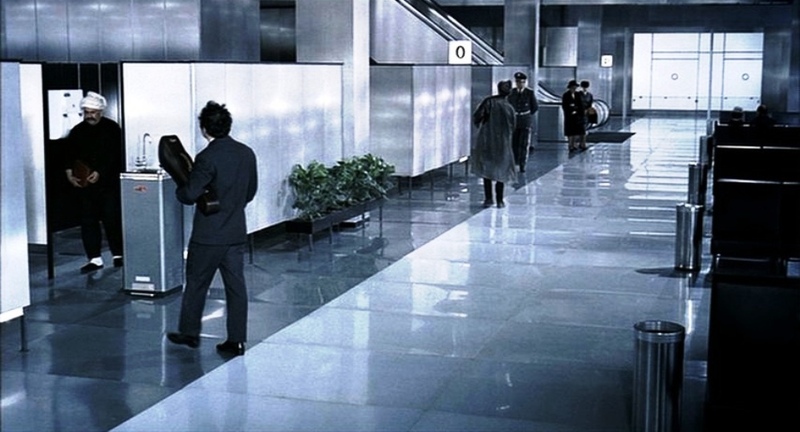 He is supposed to lead Hulot to his appointment with some American somewhere in the depths of the huge office block, but of course he never does. Instead he bangs his nose on, what else ? 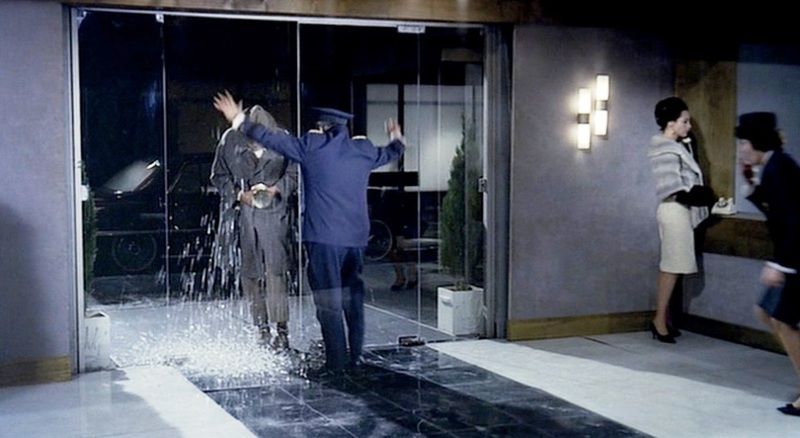 ….. but a glass door. ! Elsewhere throughout the movie Electronic devices, telephones, loudspeakers, and television sets–they too seem to connect people, but don’t, really. 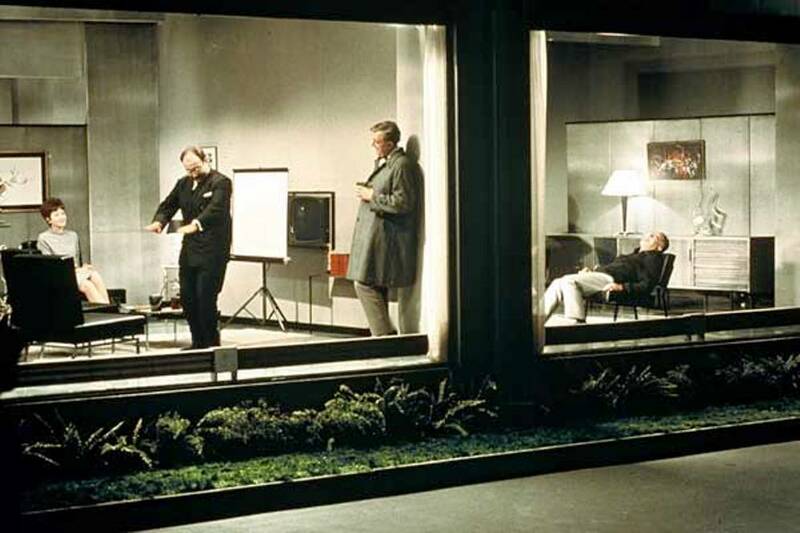 Tati uses clever framing and lighting to take advantage of reflections in windows and off the floor to enhance his commentary on the banality of modernity. 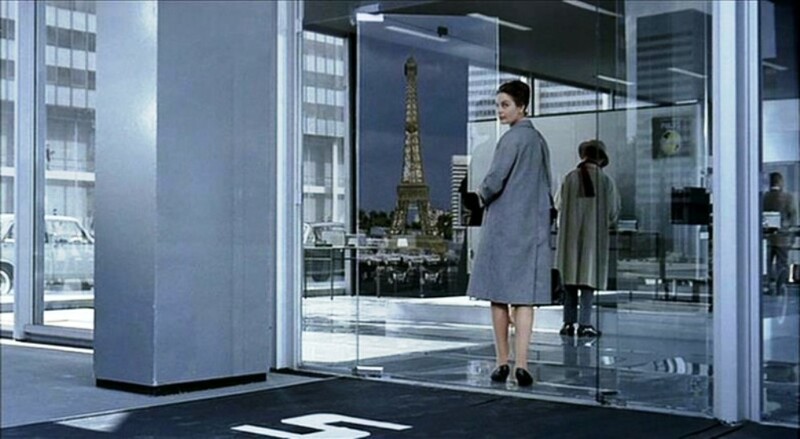 There is but a handful of sights of a recognisable Paris in the entire film, all of which will appear only as reflections on glass doors. In Play Time we are surrounded by modern architecture, but glass doors reflect the Eiffel Tower, the Church of the Sacred Heart in Montmartre and the deep blue sky. The gag works by accumulation: the sadness of the idea dissipates a little each time, until the final iteration is purely amusing, and to an extent even slightly defiant. 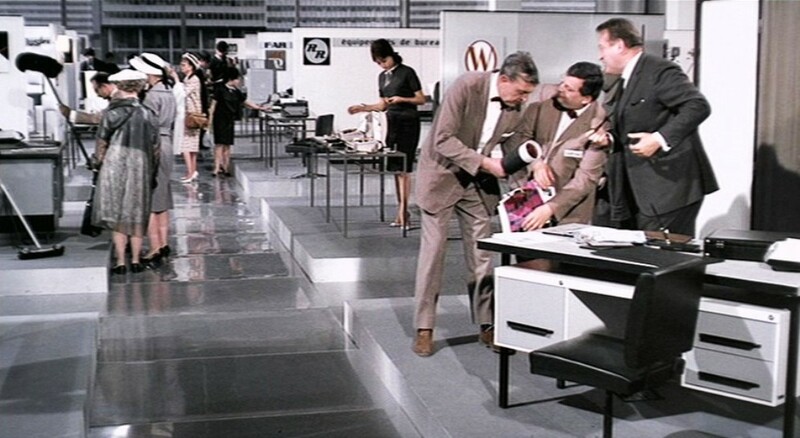 Whilst most movies in the 1960’s were in the throes of full on technicolor rainbow assaults, Tati meticulously removed almost all color from the Play Time movie. 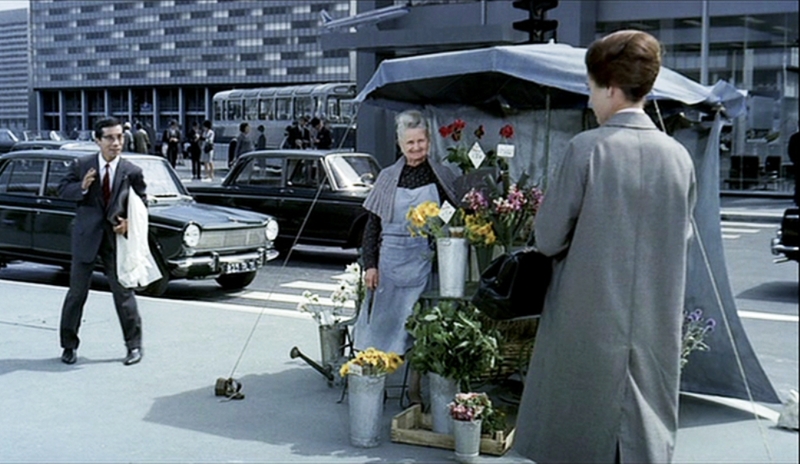 Tati wanted the film to be in color but look like it was filmed in black and white – an effect he had previously employed to some extent in Mon Oncle. 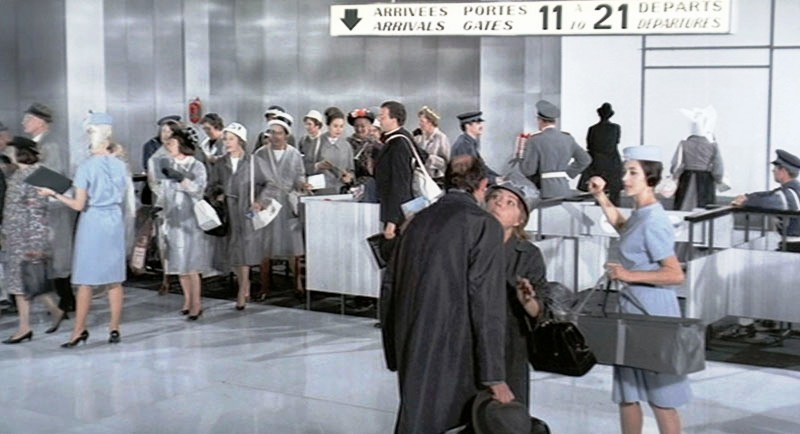 The movie starts with a highly sterile and futuristic scene of the Orly airport with a group of chaotic American tourists, who are all groomed in white, grayish or blue attire. Tati connects things with his color scheme. 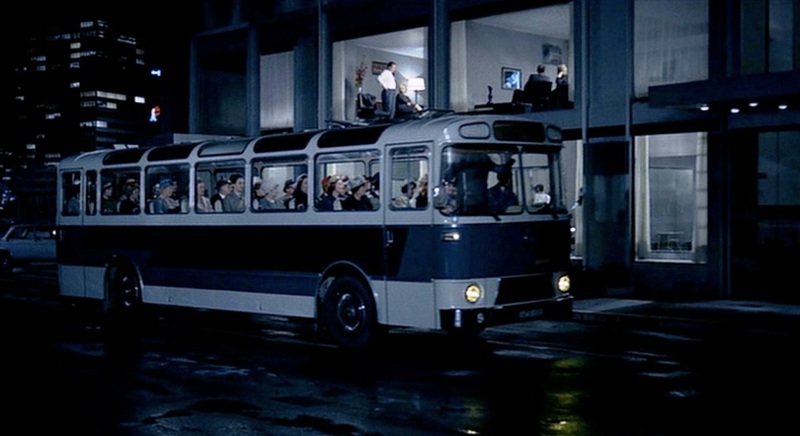 The primary theme and message that Tati conveyed was to show a progression from the dull beginning of the movie to a more natural way of living at the climax of the film. 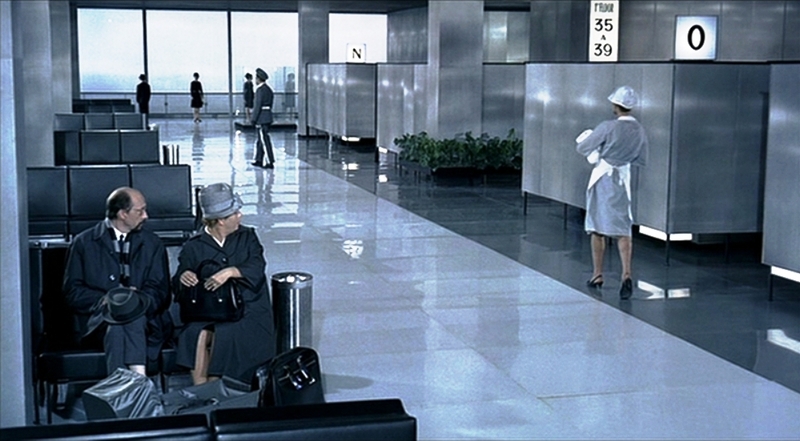 He used a strict color scheme for the first half, steely blue, beige, gray, white, black — office colors. Tati was reflecting on the modern world losing its soul to the homogenized sterility of mechanization is pretty basic and once photographed by Tati, a master of framing, rendered essentially meaningless. Green and red are used as occasional accent colors: for example, the greenish hue of patrons lit by a neon sign in a sterile and modern lunch counter, or the flashing red light on an office intercom. Tati tried to have one red object in every image. Red was added to accentuate the shots and in order to make the story seem livable. 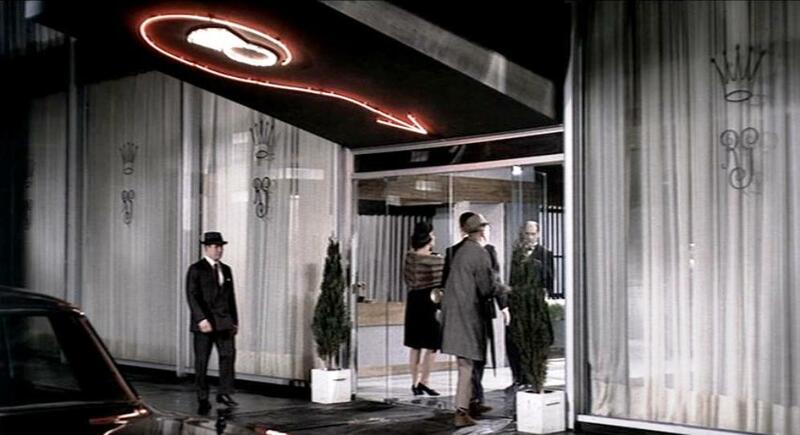 Whenever you see something red in this film, it is special and important eg the red light in the dreadful panel for announcing visitors; the red rosettes of the Legion of Honor worn by the executives in the big photos in the waiting room; the red dessert in Le Drugstore (part of Tati’s food theme). 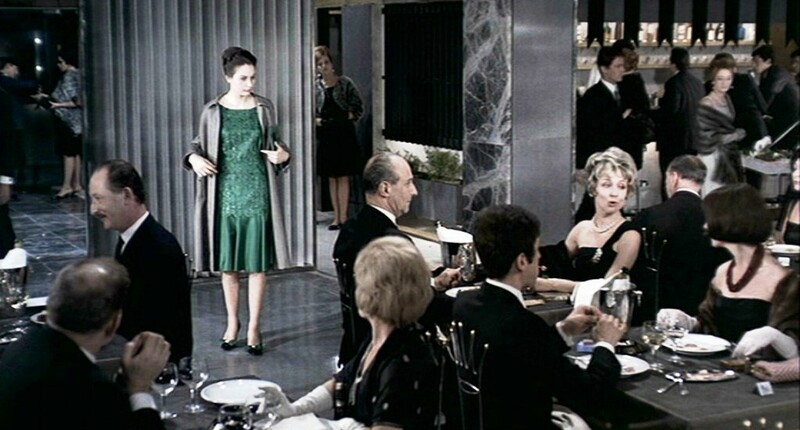 The way in which the green hue creates a divide between the dining and the preparation spaces serves to create a kind of social division between production and consumption. 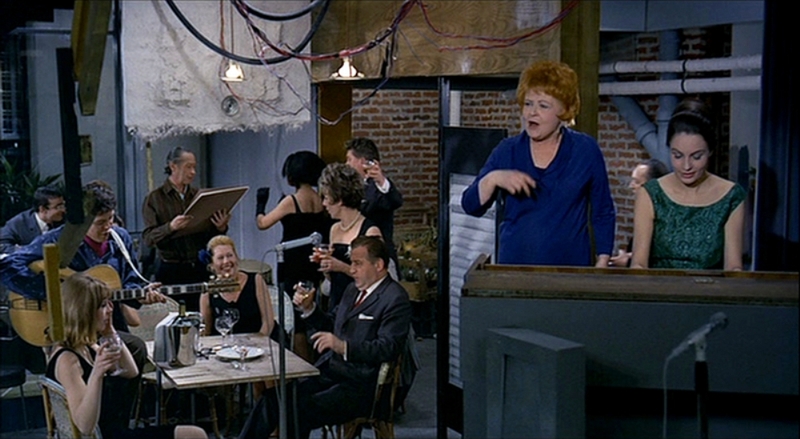 As the characters in the restaurant scene begin to lose their normal social inhibitions and revel in the unraveling of their surroundings, Tati intensifies both color and lighting accordingly: late arrivals to the restaurant are less conservative, arriving in vibrant, often patterned clothing. In the material and dynamic issues involved in framing, camera movement, focal plains, set design and spatial organization, Tati highlights how sound is involved at every possible level. In other words, Tati rigorously allows the sound track to co-inhabit the visual plane. 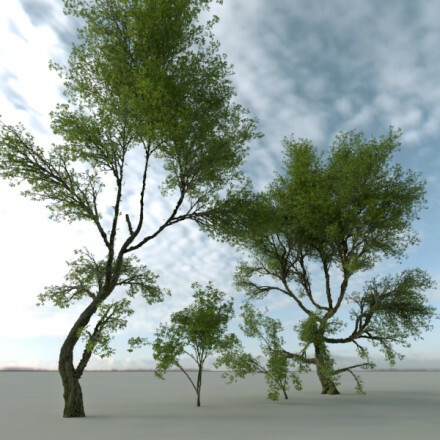 4. if the character can see into any other space or hear any other space – we are given a dynamic audio-visual interaction between the character’s dislocated experience between two spaces (eg. hearing one space while hearing another, and vice versa). 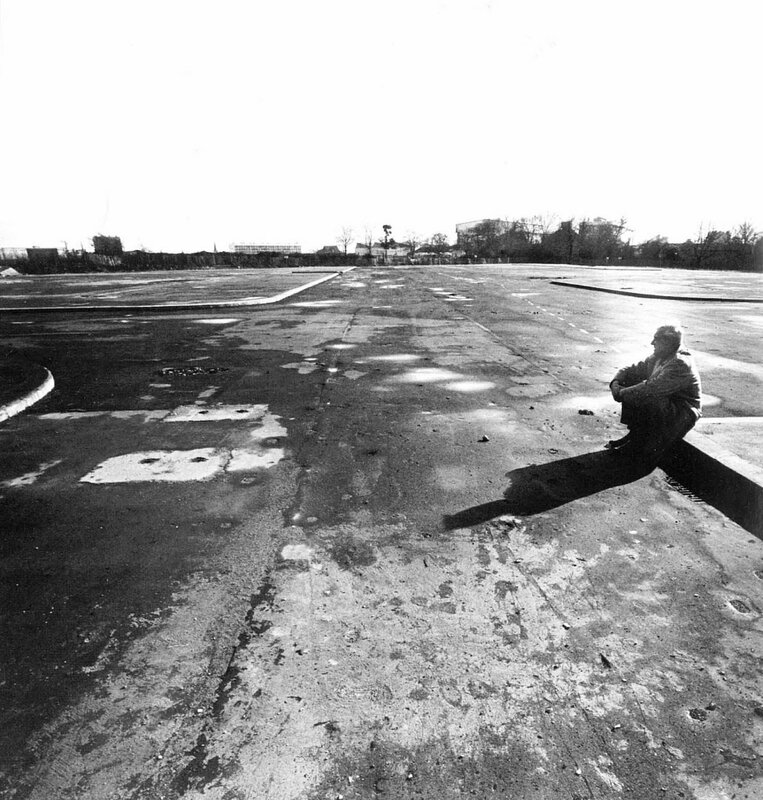 As well as the visual impact created by the sets, Tati also relied extensively on soundscapes to create and portray the adequate atmospheres required by the scenes, blending the sounds of the city such as traffic, construction workers and street vendors with the dialogues of the characters, sometimes even losing them mid-conversation in order to allow a feeling of chaos and noise to take over the scenes. 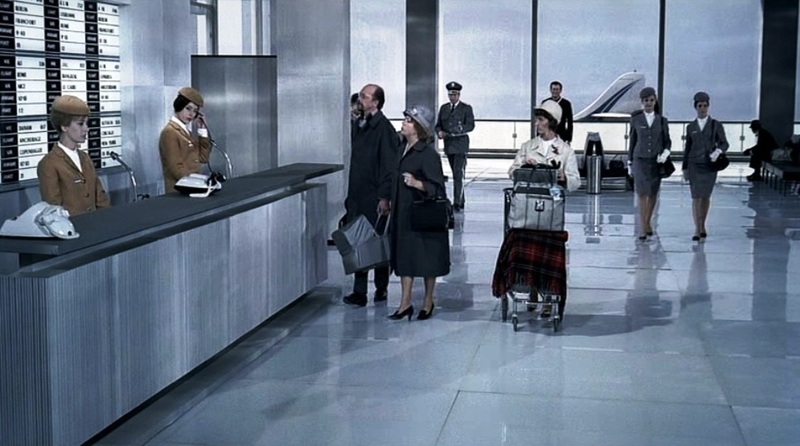 As with most Tati films, sound effects were utilized to intensify comedic effect e.g his use of sound in the foyer lobby intercom scene emphasizes the concierge’s error, it also enhances the concierge’s frustration with the machine as it bleeps angrily at him. 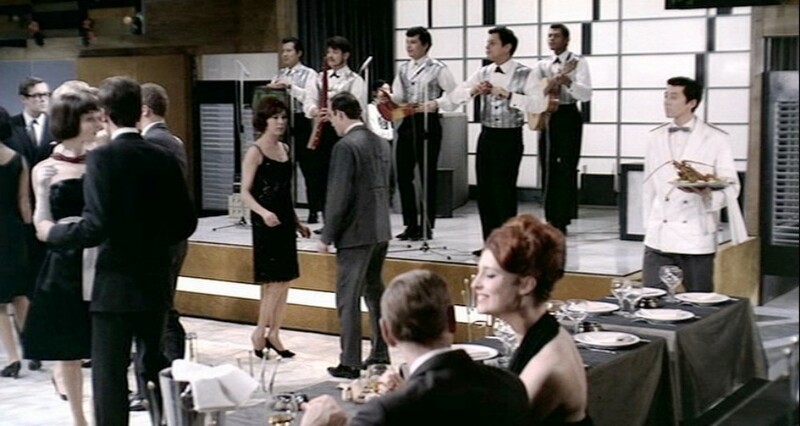 He used sound rather than visual cues to direct the audience’s attention; with the large image size, sound could be both high and low in the image as well as left and right. But more importantly, the localized sound possible with Stereophony allows Tati to focus attention within the wide frame (he considered the close up an inelegant practice). The creator of the soundless door opines that his firm are ‘the first to study silence,’ > Tati himself is just such a student. It is this visual democracy that makes Play Time such a humane and hilarious delight. The boundary of the interior and exterior is only differentiated through sounds which are noisy with cars and vehicles once a glass door is opened, and silence once being closed. 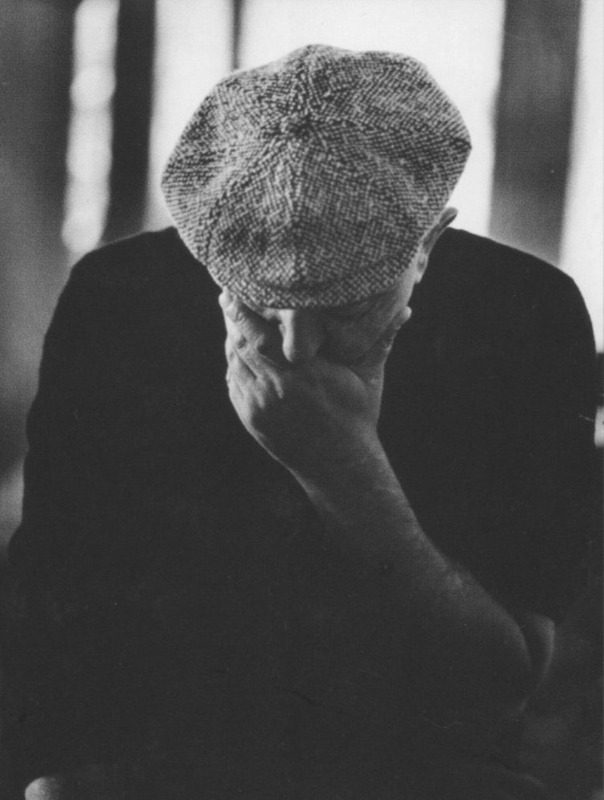 Dialogue wasn’t too important to his films, not because he was taking especial care to create purely visual cinema – there was nothing “pure” about his project – but because his ideal spectators should be more than that, and rather than sit in respectful silence, they should be able to comment on the action between themselves: look there, did you see that ? Certainly, one of Tati’s major themes in this movie as in his others is movement. People in this film are always in motion, always looking for something. People walk, run, drive, ride busses, or take elevators and escalators. 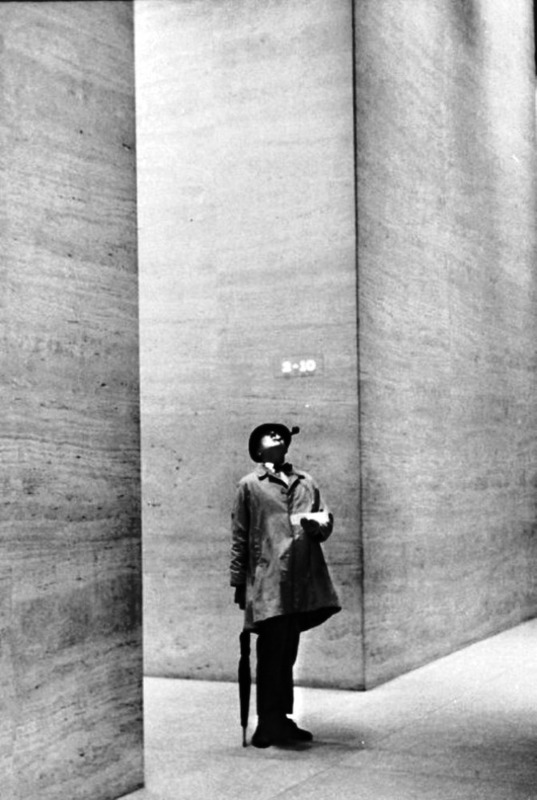 M. Hulot spends the whole day going here, there, and everywhere trying to find the American with whom he has an appointment. 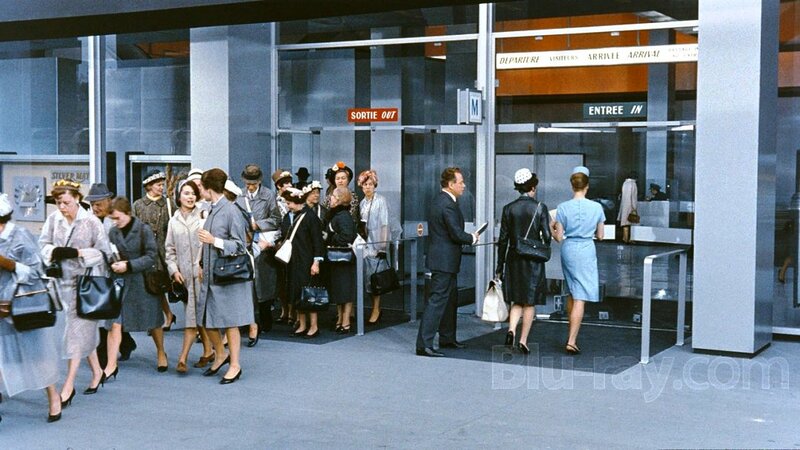 Here the camera shows the reverse side of the airplane ticket salesperson’s counter, and we see his balletic movements on the wheeled office chair syncing with his rhythmic tapping and vocal interjections. 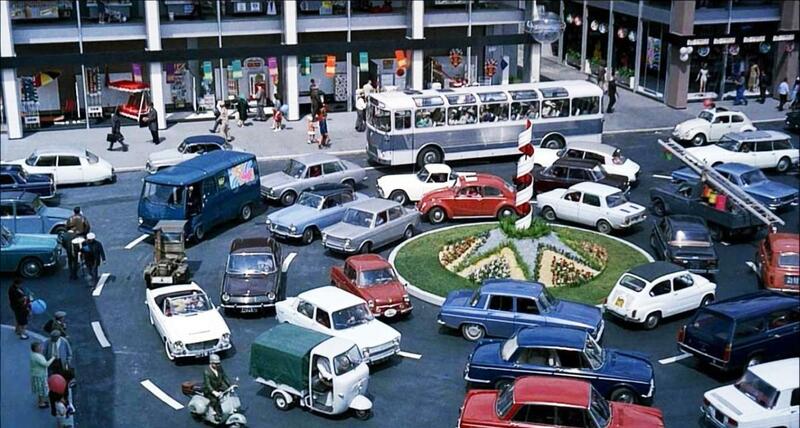 At key points in the film we see cars trying to make their way through Paris’ traffic. 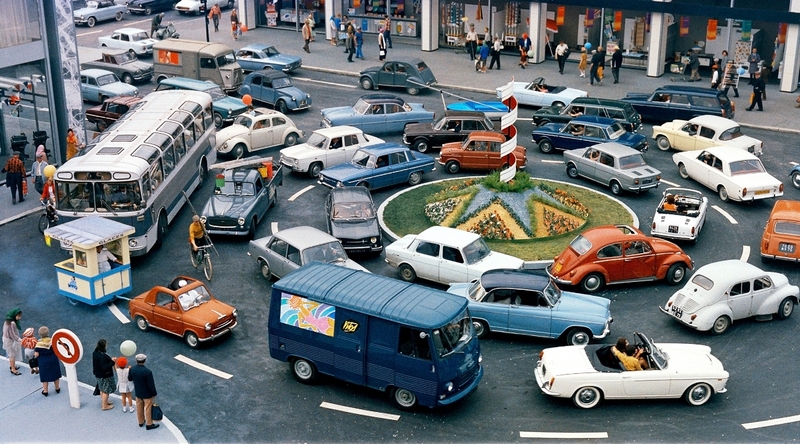 Certainly we get to a notable traffic circle in the ending and then the film finishes with cars’ taillights going into the night and the lights of Paris. 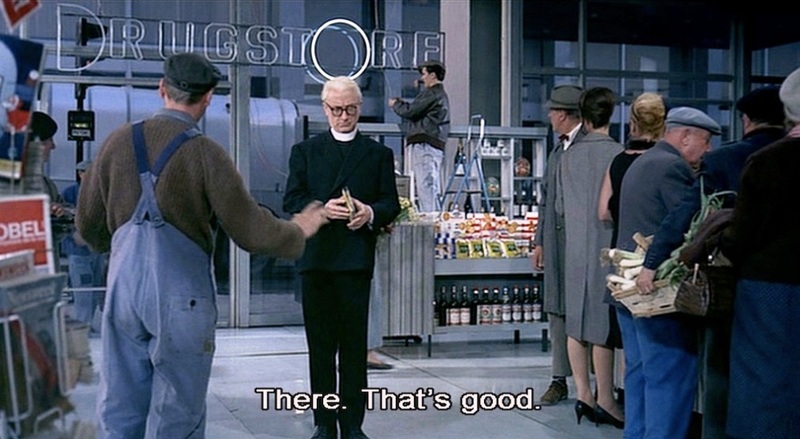 He believed that the modern world would become a consumerist society dominated by advertising, and so he arranged for product placement, the first in French films. 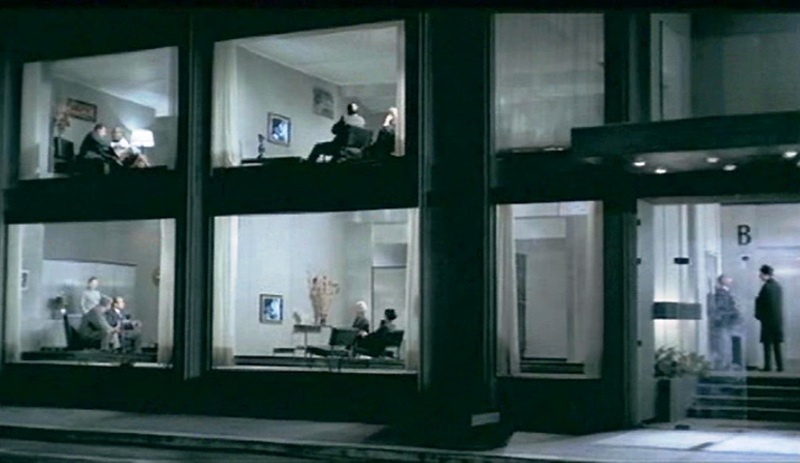 The density of commercial images in Play Time is much less than in the modern world, was partially a failure of imagination by Tati and partly because Mr Terry ( his product placement advisor ) ability to convince advertisers that their products would be seen to their commercial advantage in Tati’s film. 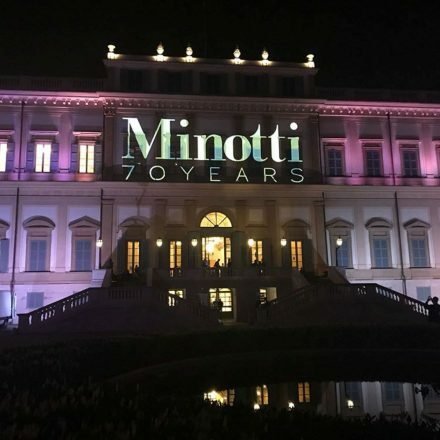 However they were able to garner commercial support from a number of key sponsors through contribution in kind e.g dozens of Simca 1500 cars, hundreds of pairs of Vitos stockings, Prisunic supermarket counters, Inno metal carts, Moet and Chandon champagne in addition to construction of service stations and other exhibition stands. 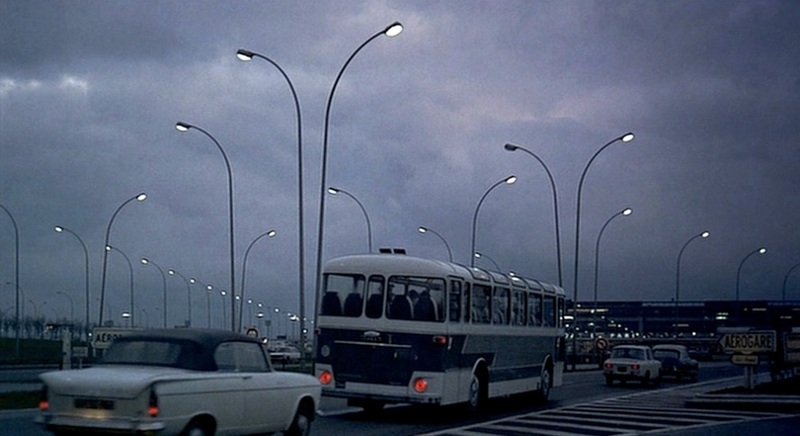 Just as the people inhabiting his ultra-modern approximation of Paris gradually learn to circumvent the right-angled jungle of contemporary urban architecture, Tati’s film weans willing viewers from their fixations with linear, structured movie storytelling. Play Time doesn’t really have much of a narrative structure to speak of. Tati’s script may have been small, but there’s such depth of content in each setup. The film is a series of giddy encounters between people and things, the wonders of “modern life” relinquishing their functionality in favor of an unaccountably rapturous beauty. As the characters tear apart an already fragile interior, Play Time lifts off. Play Time begins with some shrill jazz contrasted to fleecy, slightly moving clouds over which the opening credits play. Primitive rhythms frenetically played with jazz intonation. 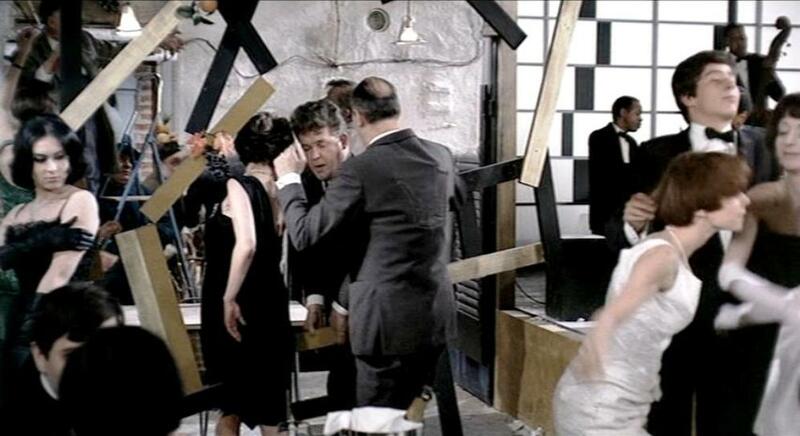 This musical theme recurs when chaos enters into a scene when all social ordering breaks down. 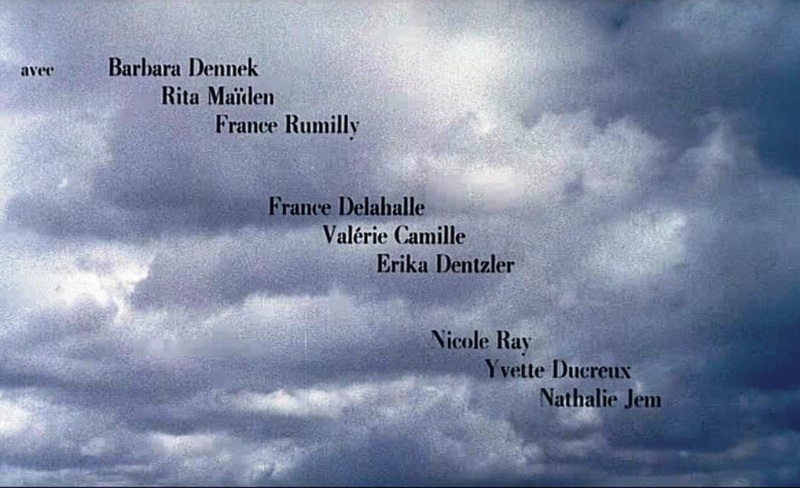 This opening theme – set against a brilliant sky – idealizes the natural state of rhythms which throughout the film are intercepted, reorganized and effectively ‘tamed’ by a variety of social design discourses. After the title cards clear away from the clouds the shot pans right through the clouds before jump cutting to a carefully composed shot of the top of a large modern office building. It is something that interferes with movement, which is one of Tati’s favorite themes, running all through this film – movement. Play Time is told over a series of 12 episodes according to the linear progression of time with out having any flashback, fast-forward, ellipsis, or parallel actions. 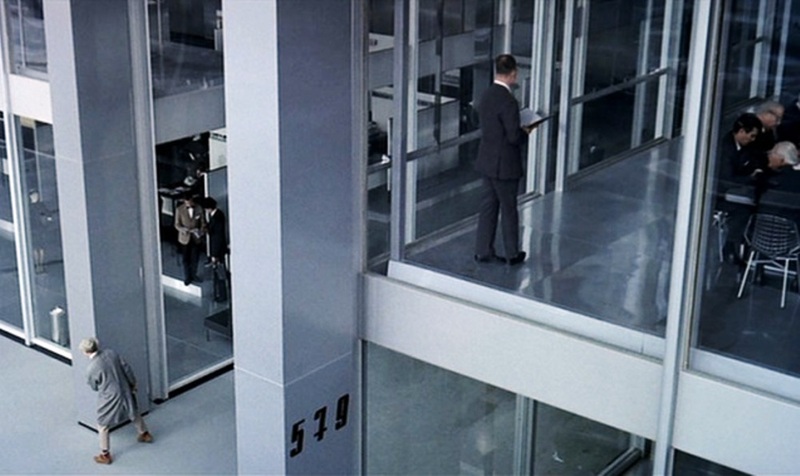 Play Time begins in a vast sterile, boxed modernist styled building concourse, where all who inhabit it travel in strict straight thrusts of movement and change directions at exact 90-degree angles. People flow in and out, like an assembly line, always confined in their movements to the architecture’s design. This is the domain of the straight line, the very world that had only begun with the rise of minimalist modernization. The very intent of such a design was meant to make contemporary life “easier” and uniform, but man has been reduced to a beeline… moving not because he wills it, but because he is forced to. Following the guidelines of the architects, people operate at right angles to the decor, and feel trapped by it. Increased industrialisation was translated into increased levels of unemployment and an ever increasing pressure to increase productivity on those still in work. Tati’s cleaner is a very subtle reference to this reality. The janitor is a traditional worker whose job is now under threat. The threat comes from a new form of industrialised, aesthetically minimalist architecture that discourages building users to litter or clutter and seemingly keeps itself clean. 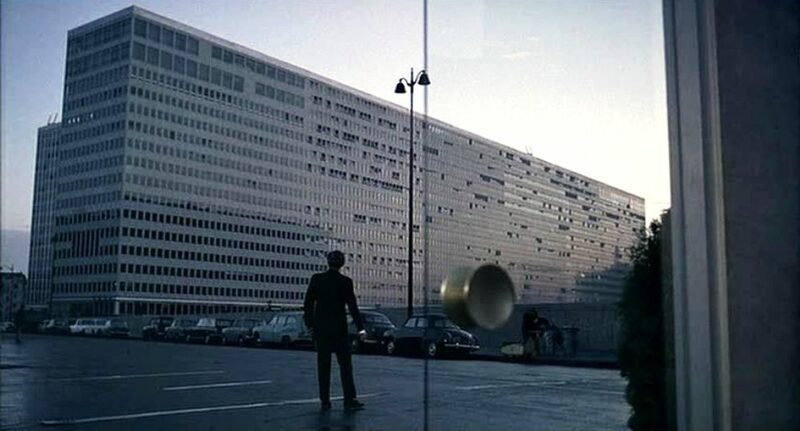 In numerous ways then, the buildings of Tativille are seen to alienate, confuse and disorientate their users. Then a group of tourists invades and the tail fin of a jetliner glides past a window and we know we’re in an airport. 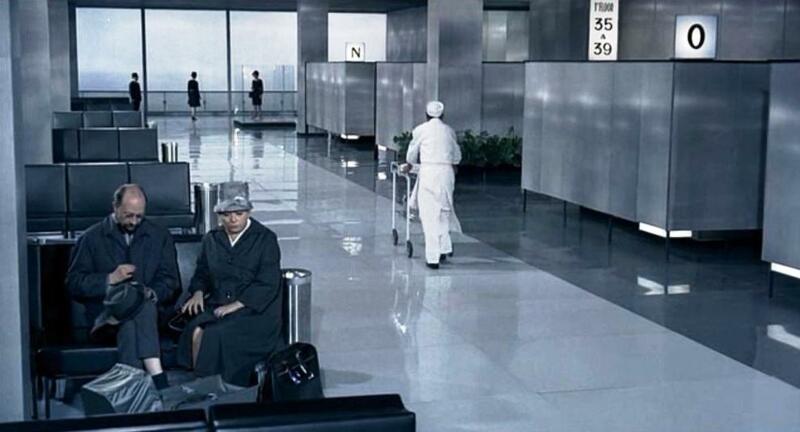 The opening hospital-airport confusion sets the tone for the film’s first movement, a purgatorial comedy of frustration in which the people of ” Play Time” are beset by problems brought about by the un-ergonomic design of the city and the universe’s tendency to put on false faces to confuse and deceive. Impenetrable announcements boom from the sound system. The sterile airport environment is on the one hand designed to silence people in order for smooth traffic flow, but on the other hand ends up amplifying their presence. 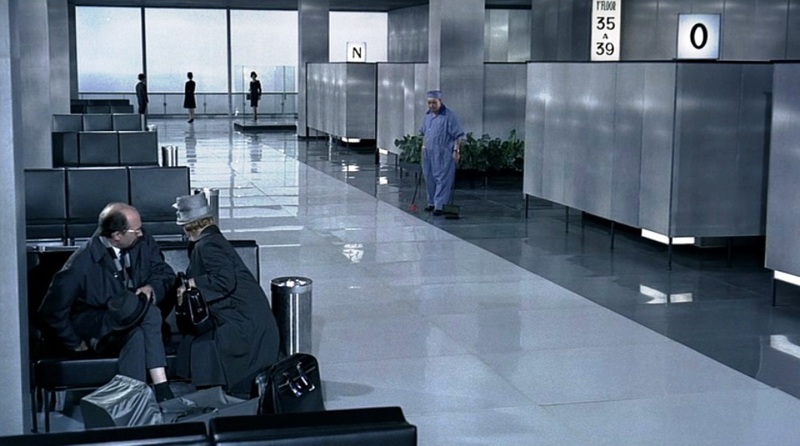 The airport scene shows people totally unaware of how their sound collapses the pristine silence of the sterile environment. 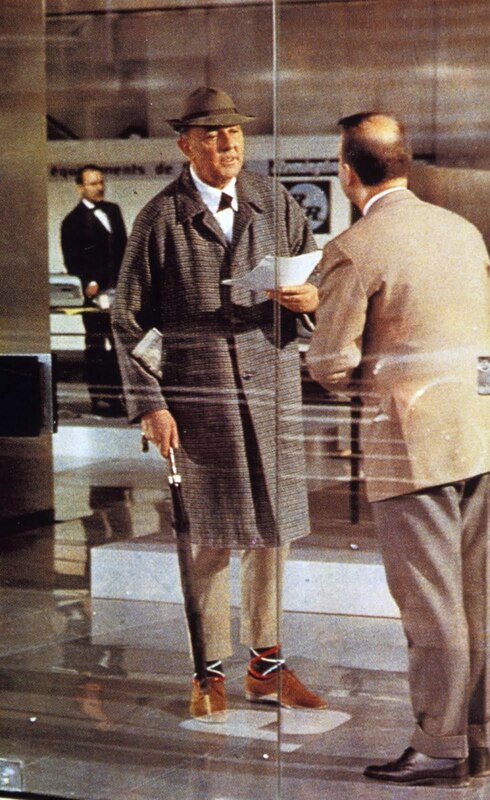 Note also how each character is conveyed by their footwear and the way that walk, and how M. Hulot marks his entrance by dropping his umbrella causing everyone else to momentarily be silent. 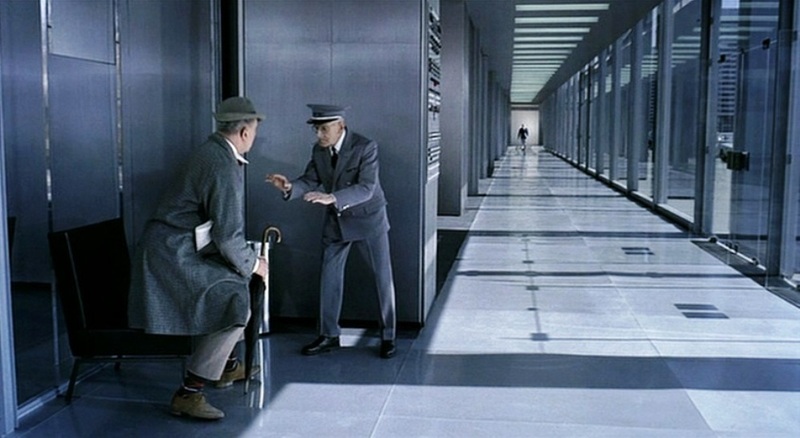 A false Mr. Hulot’s entrance is easy to miss; while babbling tourists fill the foreground, he walks into an empty space in the middle distance, drops his umbrella, picks it up and walks off again. 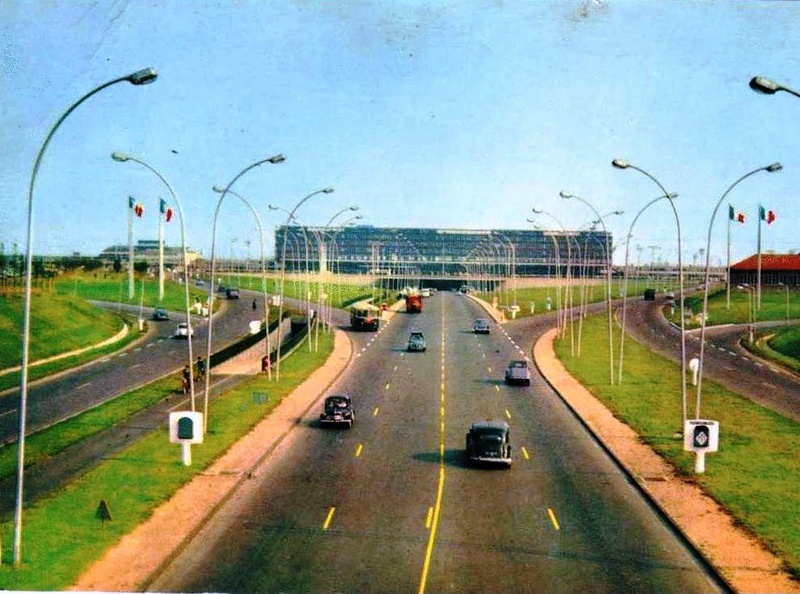 Because everything had been planned and decided on by developers and the architects of the complex so that the umbrella should not be dropped in Orly. 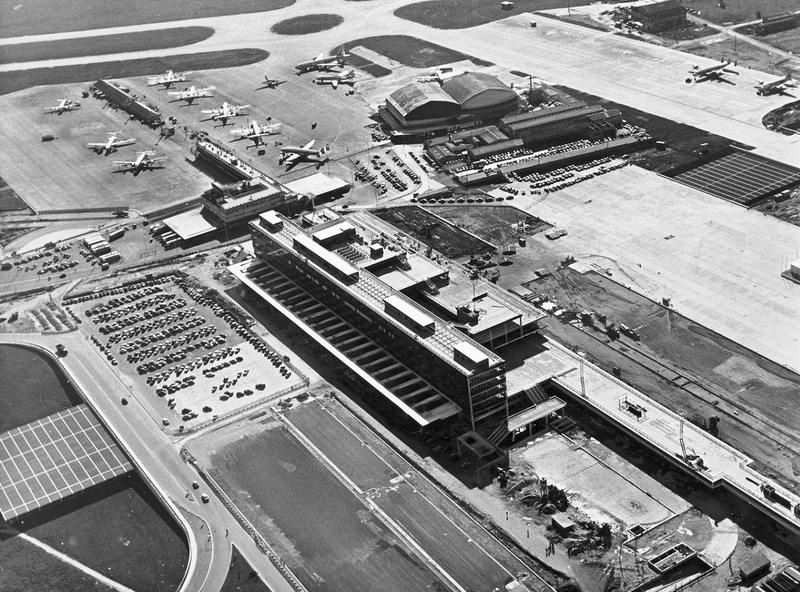 The South Terminal of Paris Orly Airport would become one of the major inspirations for Play time. Well, Tati made no bones about calling it sterile, odourless, inhuman, uninspiring. Tati never commented on aesthetics or design – all he was concerned with was what he perceived as the barrenness of the place. The tourists are efficiently shuttled off to buses for their whirlwind Paris visit, but this isn’t the Paris of ancient brick buildings and romantic bridges and historical monuments, but of skyscrapers of steel and walls of glass looking out onto paved streets packed with commuters and buses and pedestrians in a hurry. 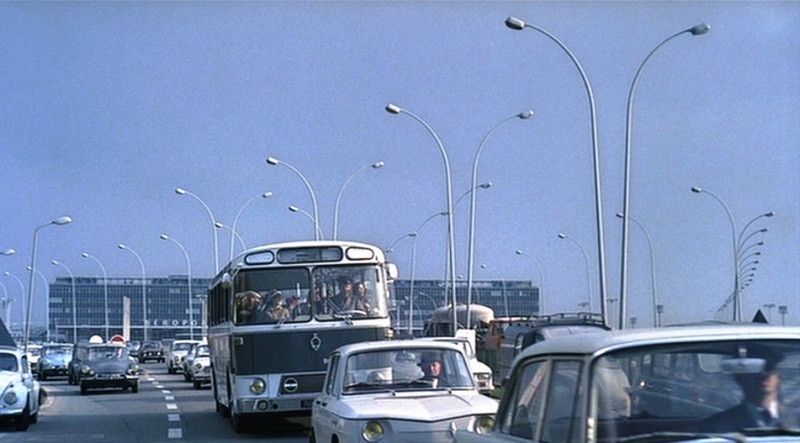 Once we see the buses driving away from the airport, we are treated to a lovely shot of what is a post-modern world that could really be anywhere, even though we see French-language signs. Throughout his work, Tati uses ‘arrows’ as symbols to suggest the confusion of modernity. The endless array of arrows that guide drivers to their respective destinations are, of course, exaggerated to convey this sense of spatial confusion. But they are also visual signs of the giving over of our responsibility and freedom to technology. It seems reasonable to argue that the more arrows, the more confused the characters become. However, we must also say that the beauty of this disorientation is that everyone eventually finds their way. 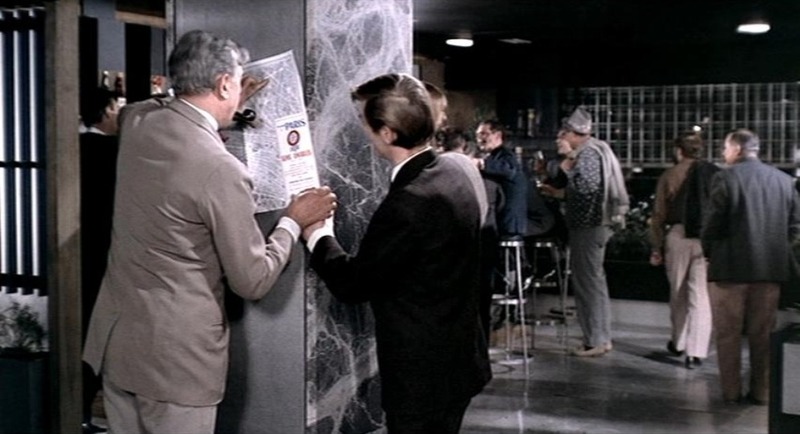 For instance, in Traffic the arrows are strewn throughout the entirety of the film, and are often directly responsible for creating havoc. In Play Time, we now enter the office world of plate glass and steel, endless corridors, work stations, elevators, air conditioning. 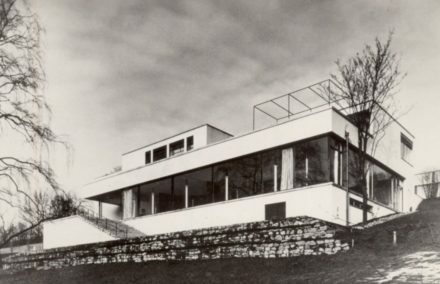 Tati emphasizes the banality of “sleek modernity” and modernity’s elimination of a few fundamental aspects of architecture. 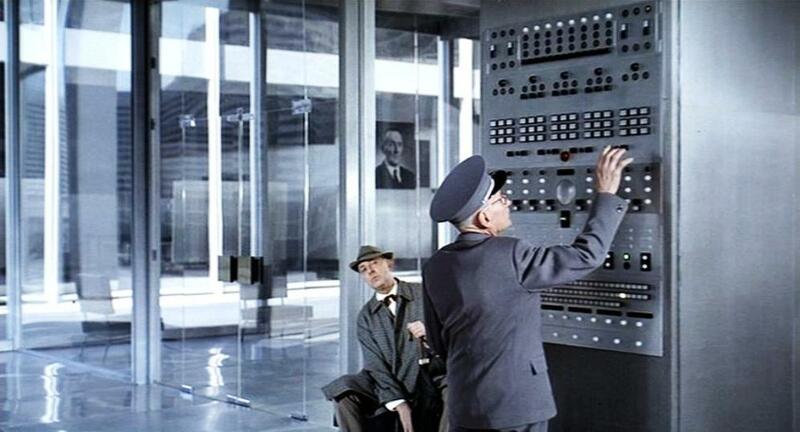 Undermining every design feature of the intercom: the guard can’t read and talk simultaneously ; he doesn’t punch in the right code and sets the alarms off; the speaker is nearly incomprehensible; etc. Tati doesn’t just allude to the way the inhuman scale of these buildings grinds the human soul to dust, he makes the audience experience it, too. 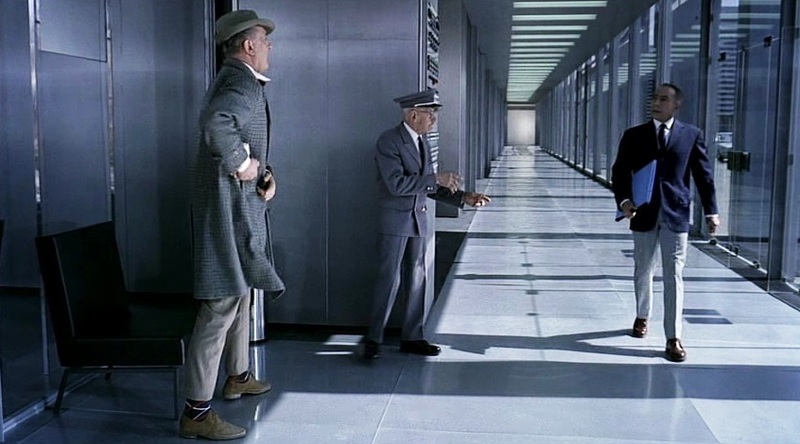 Witness the excruciatingly long take of Hulot’s business contact coming down the hallway to meet him where the shot is one minute and fifteen seconds long, of which forty long seconds are spent waiting, with Hulot, for the man to walk down the entire length of the hallway. 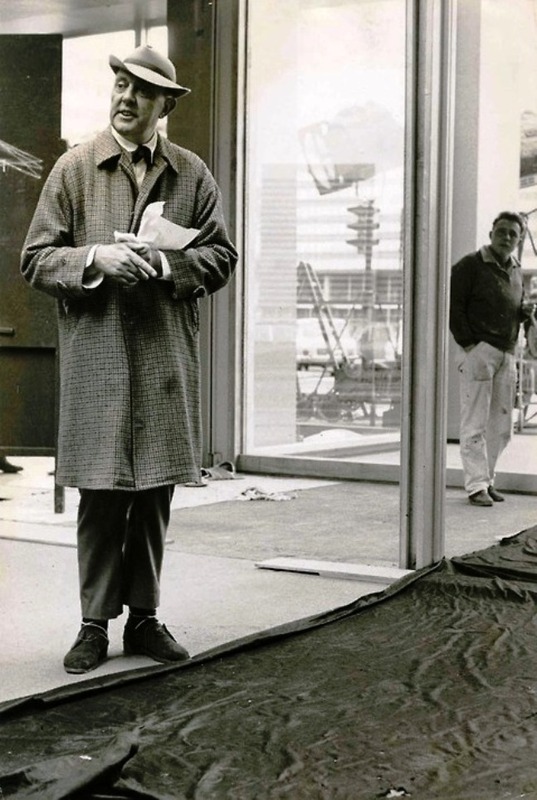 Hulot thinking the man is near, while the guard and the audience can see how far away he is.Another example of how the acoustic effect of a designed space often contradicts the visual formalism of that space. 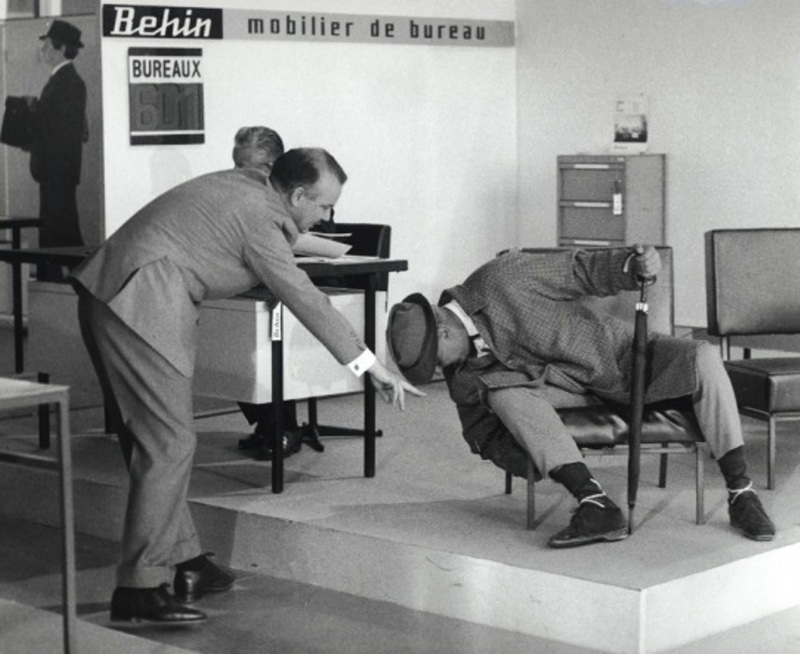 Hulot is put on display in a glass waiting room, where he becomes distracted by the rude whooshing sounds the chair cushions make and then keeps missing his contact. When the new other man enters, he marks his own presence in the space not by touching anything in it, but by making himself as a self-contained efficient unit. 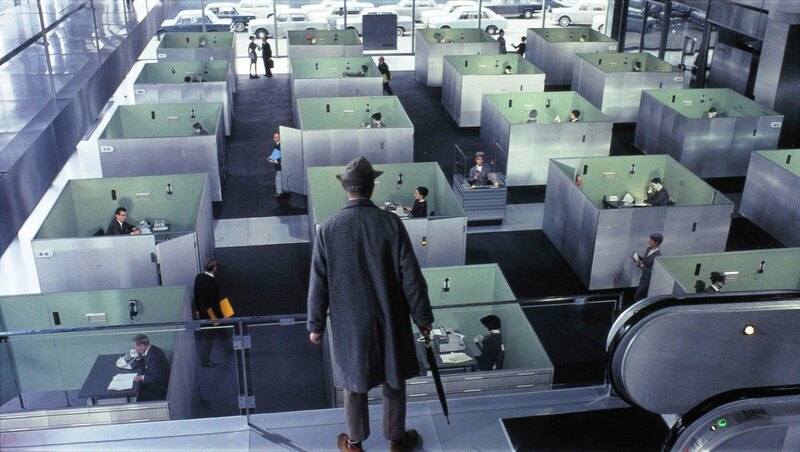 The common and funny problem Hulot encounters in the office building is his misunderstanding of location. 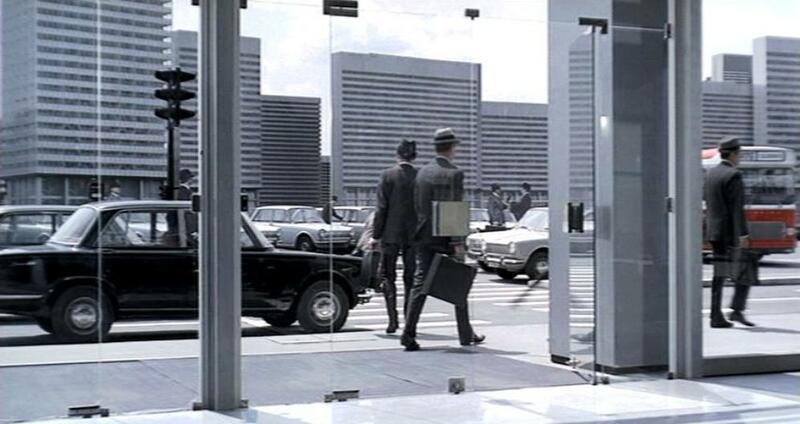 Since all the buildings were covered with clear glass windows, and reflection is everywhere, Hulot continuously misunderstands the location of the man he was expected to meet. 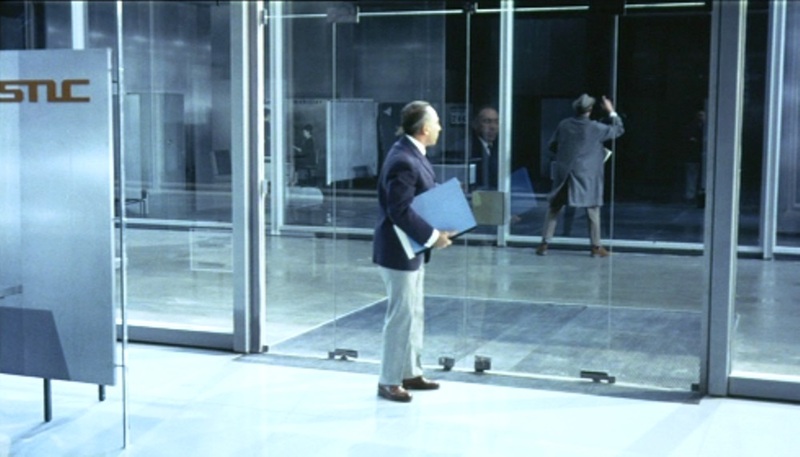 Hulot looks through to what he thinks is the man in the opposite glass-paneled building only to reveal to us that he was looking at the man’s reflection. The man was actually in the same building. Visuals throughout the film often lie; sound gives us (or would give us if we could hear it) the truth of a spatial situation. The lack of walls and the transparency of the curtain walls blurs the indoor and outdoor spaces, causing many characters to confuse them with when the walls were taken out, causing them to bump into them. He takes an elevator trip by accident. 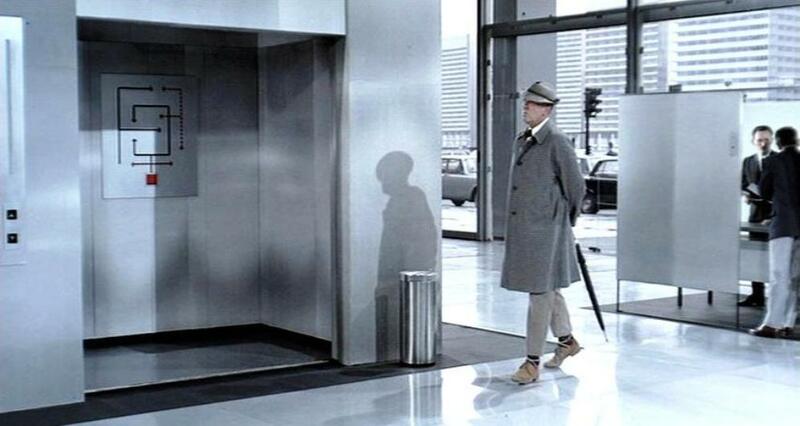 As Hulot steps into the elevator to read the sign, the doors close and he misses Giffard again. 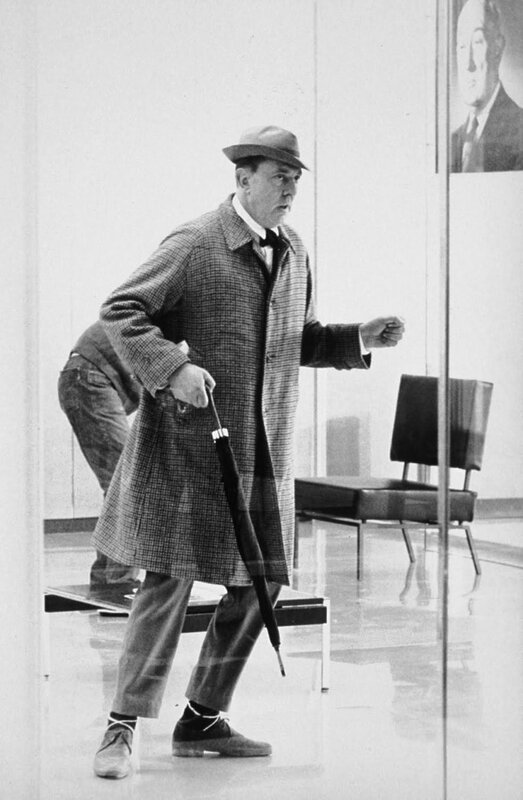 Hulot’s confusion also stems from the lack of defining architectonic elements that dictated the small room as an elevator. Tati deploys various techniques and elements to portray the ridiculous monotony of working scene of modern Paris. The most obvious is the architectural plan of uniform box offices and the workers of their ants-like movements as Hulot sees from above. From the airy vacuum-quality silence of a glass-sealed room, to the unmistakable sound of a hinged glass door swinging open and closing with a swish of air and a throaty metallic clunk, Tati captures in a way any documentarian would envy the full visceral experience of what it is like to occupy these spaces. 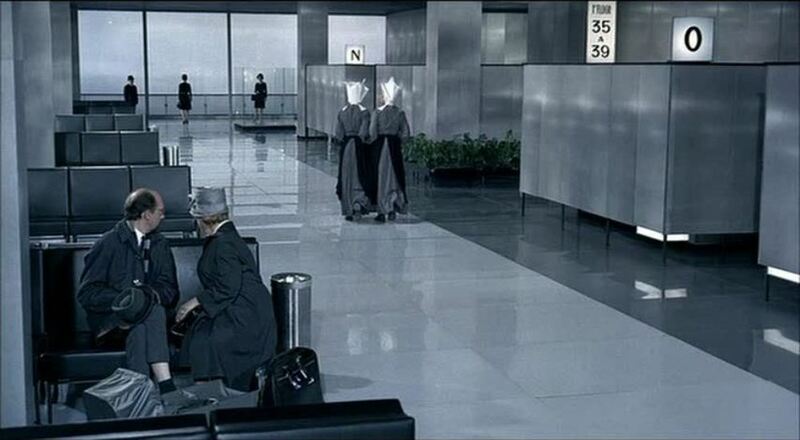 Tati makes it extra clear to the audience by this extravagant emphasis of such a rigid setting of working conditions. 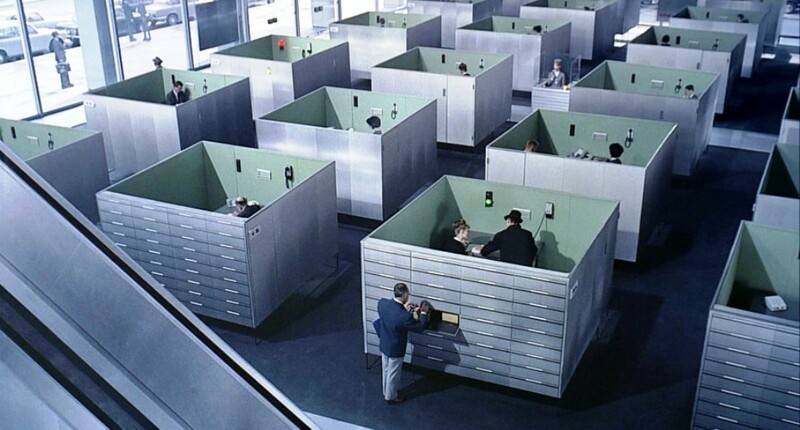 Attempting to meet a business associate, Hulot becomes lost in the labyrinth of office cubicles, in which the sole landmark is a centrally located telephone receptionist who further perplexes him by swivelling through 360 degrees, so that each time he sees her, his internal map is altered. 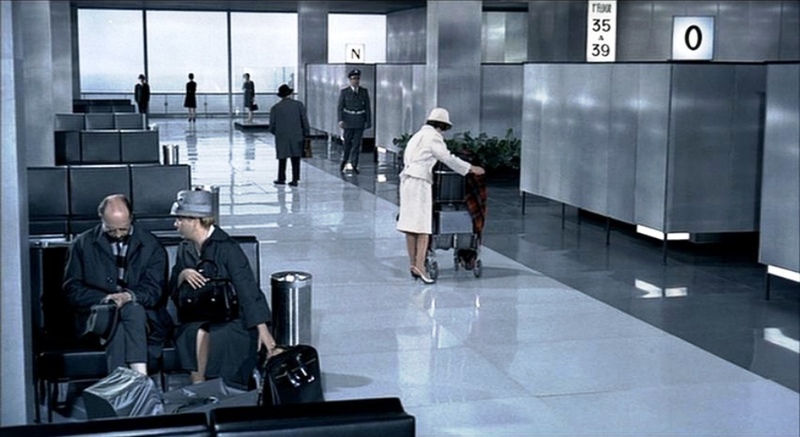 Not only is the setting baffling for Hulot; the other characters, who should be adapt to the conditions, are also equally confused eg the attendants are also seemingly lost while hurriedly trying to execute business in and out of the boxes. 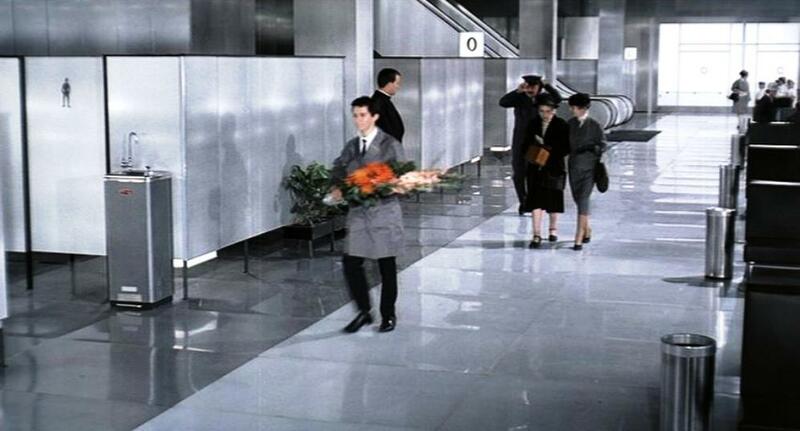 And there is that euphoric, soft and gentle but endlessly consistent muzak that plays as Hulot roams the maze. The entire jumbling murmur and its cohesive assimilation with the constant phone rings and the sound of shuffling paper, and brainwashing office muzak become alienating. 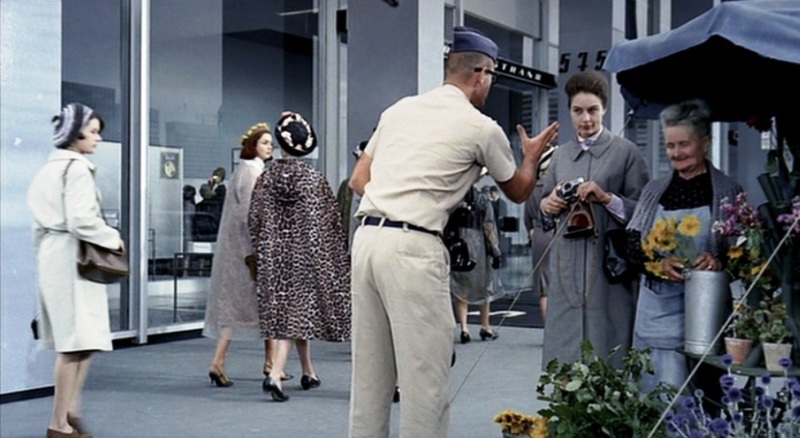 D. Monsieur Hulot wanders through the International Home Fair and crosses paths with the American tourists. A woman demonstrates a pair of dark, thick-framed glasses whose lenses flip up separately, so that its wearer can apply makeup, one eye at a time. Shortly after that, we’re introduced to the owner of a firm that makes silent doors, whose dark, thick-framed glasses later break in the middle, repeating the visual of the one-up, one-down lenses on the first pair of glasses. It is no accident that an accident creates the same effect that some company has mass-produced and offered for sale. One of the more incisive illustrations of this comes in the Ideal Home section, when Tati shows us precisely what place he fears classical culture is likely to occupy in modern homes. Here an Ancient Greek inspired pedal bin atttempts to highlight classic beauty combined with modern convenience ! The expo is a kind of mini-Babel, with French, English and German spoken, accompanied by bland muzak. 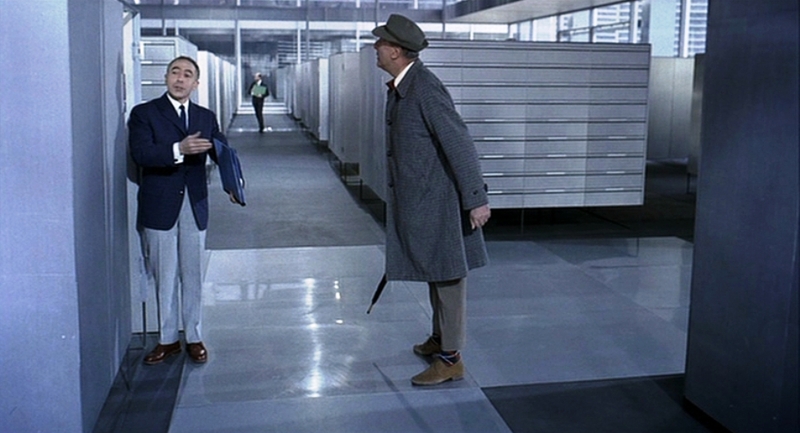 Hulot is mistaken for another man and is berated by a German businessman. A perverse play on silencing a human energy manifestation: the angered door slam. People bang doors to mark their exit acoustically so as to rupture the silence of a space – yet here is an invention which circumvents that very usage. 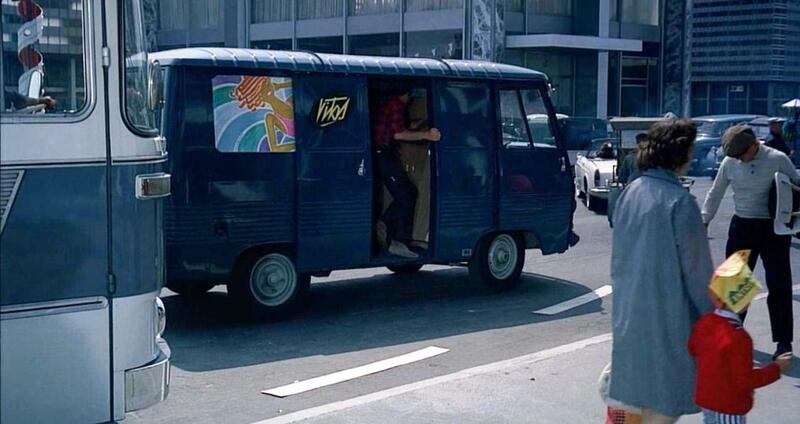 Note the ad line: “Slam your door in golden silence”. 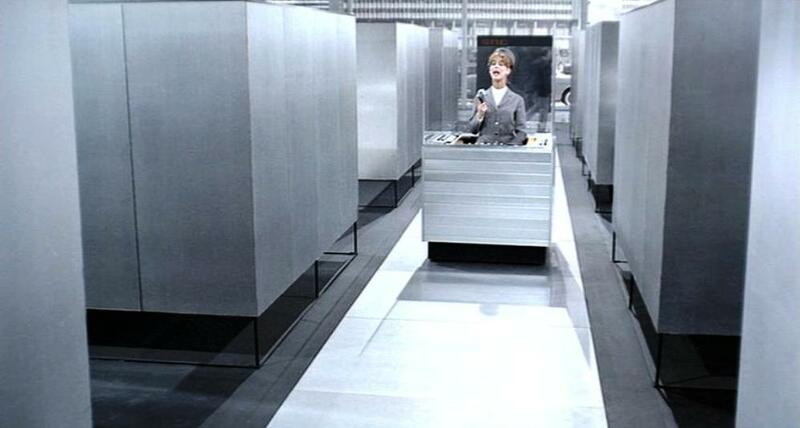 A faux Hulot mistakes the silent door exhibit for an extension of an adjacent exhibitor selling office desks. 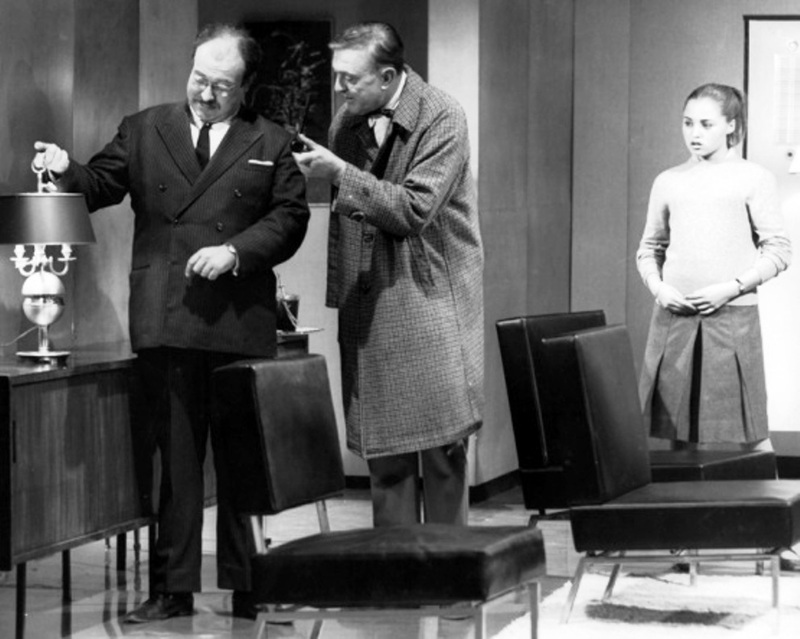 While the door salesman is demonstrating the silence to a potential customer, the faux Hulot rifles through the desk, empties his pipe in the ashtray, and generally helps himself in a way most offensive to the salesman—who can’t do anything because he’s distracted by a sales prospect. 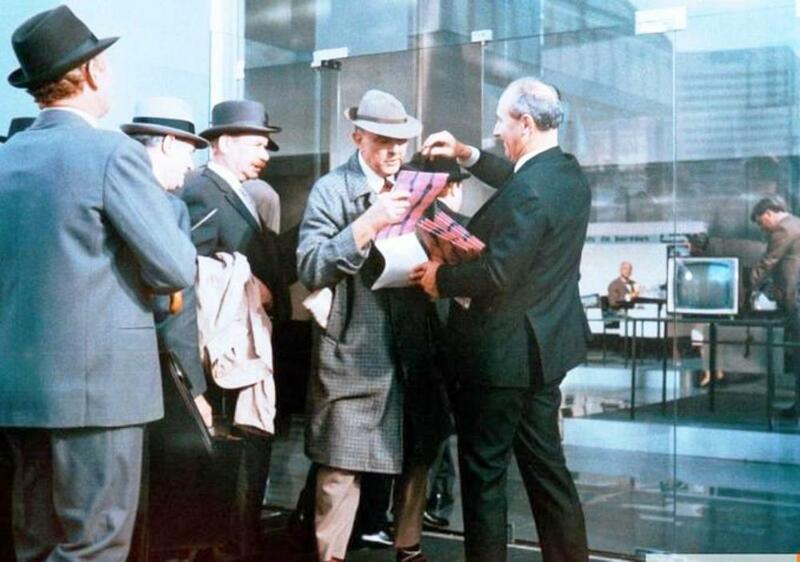 The owner of the silent door company turns up a few moments later, and his salesman complains about the man in a hat and raincoat carrying a pipe. The salesman walks off and Hulot appears. 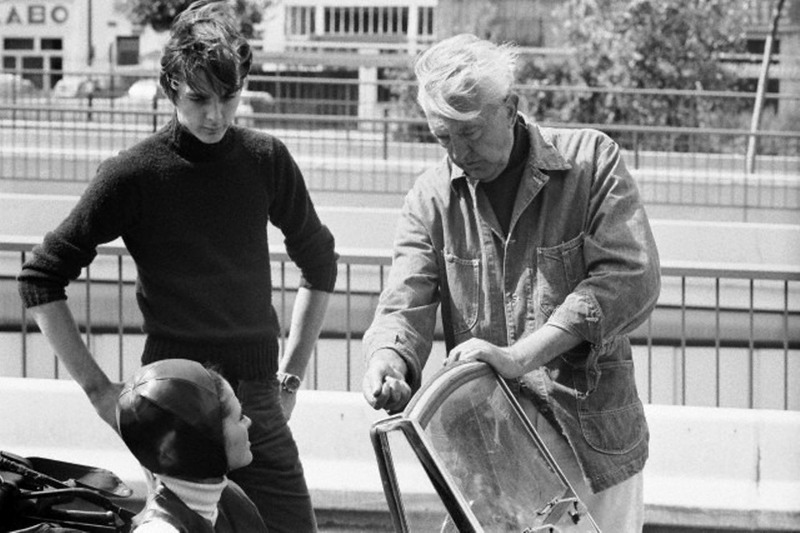 The owner mistakes him for the impolite not-Hulot and berates the oblivious Hulot. 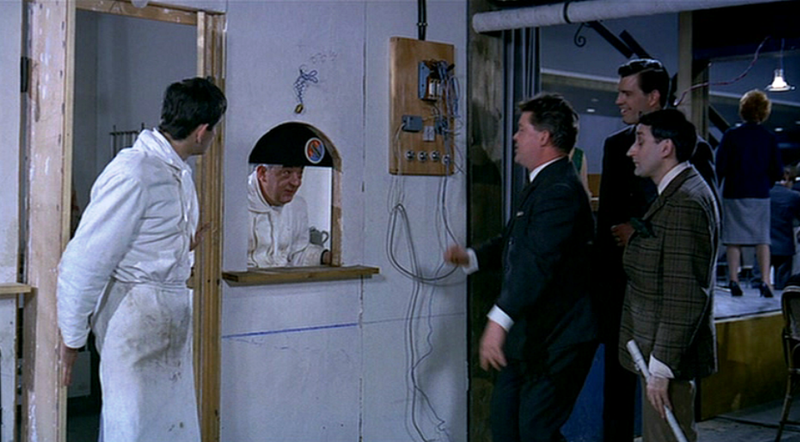 The mistaken-identity gag could also represent Tati’s impatience with the popularity of the Hulot character. 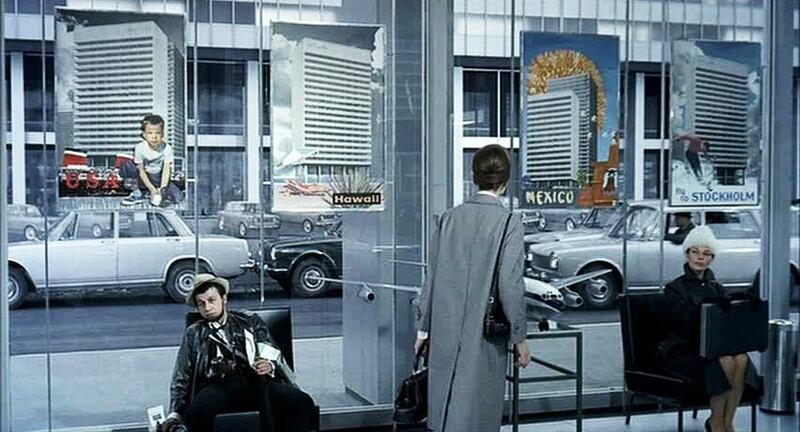 The characters seem distracted by endless gadgets, sleek metallic furniture and glossy surfaces. Objects have been invented or introduced in the modern world which should make our lives easier, simply complicate our lives. 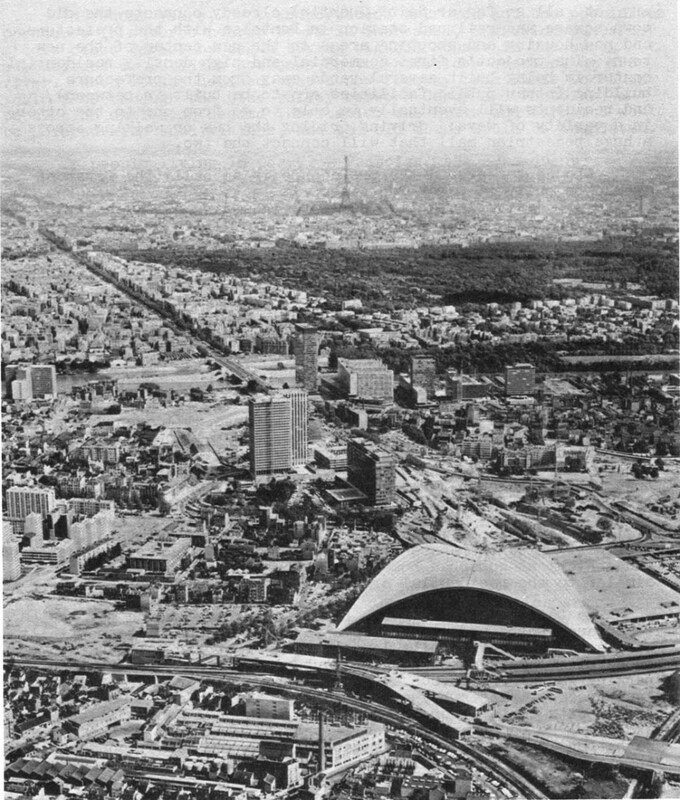 Apparently Tati’s visit to the 1958 World Exhibition in Brussels influenced him to show modern life as an exhibited way of life. Life as a showroom – Tati uses these material items in his film to tie into our everyday life. While Tati’s attitude may seem nostalgic or old-fashioned, the question of what is sacrificed in the name of progressive and commerce is as potent and necessary as ever. E. Monsieur Hulot enters the Travel agency and crosses paths again with the American tourists. Again this becomes an interesting nod to modernism taking over the world. 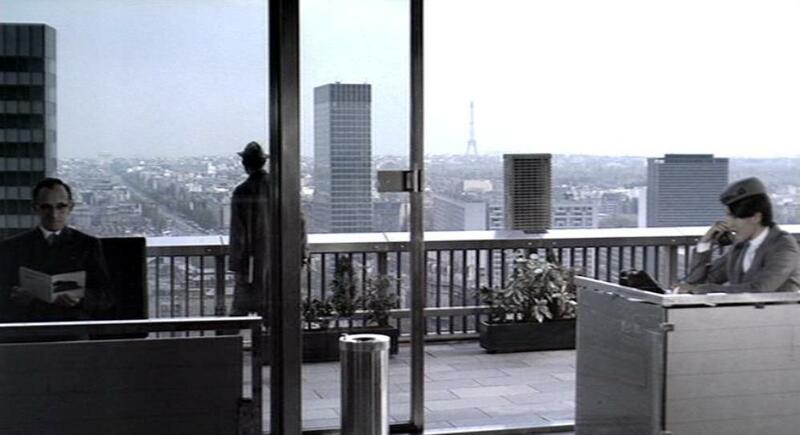 F. Monsieur Hulot visits a friend in the Apartment complex. 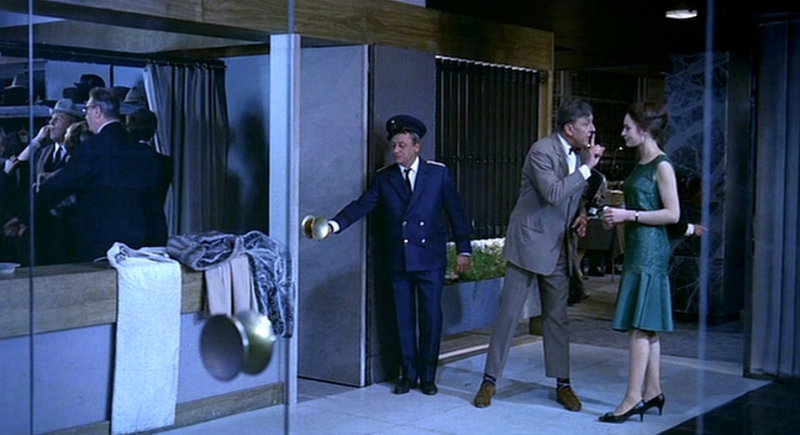 As Hulot leaves the Home expo, an old army buddy invites him around to his sparsely furnished, ultra-modern and glass-fronted, department store like apartment. Tativille’s blocks of apartments are beautiful, radiant, spacious, harmoniously proportioned. The apartment building has walls of plate-glass windows, and the residents live in full view of the street. 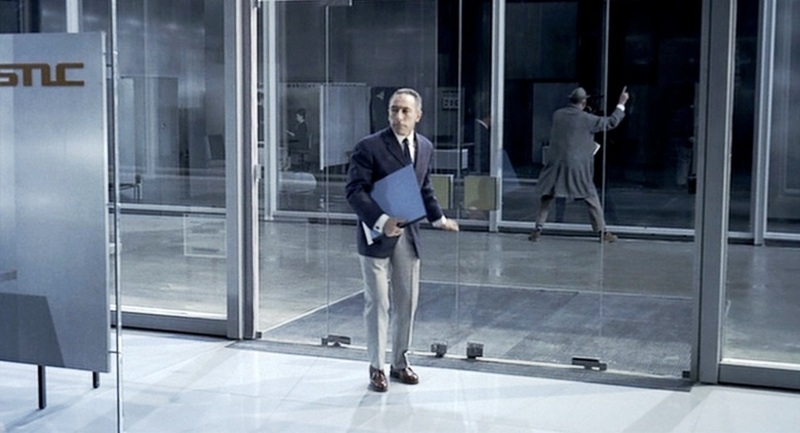 This sequence is filmed entirely from the street, observing Hulot and other building residents through uncurtained floor-to-ceiling picture windows. A series of synchronous gags then develop between the two adjoining rooms as we are led to read that there is an invisible wall between the two rooms – when in fact there is an actual wall. The sense of unthinking conformism that is conjured up is actually a scathing comment on the modern setting and the people who live there. The apartments feature the modern rectilinear chairs that don’t quite squish like normal seats and couches, but pop in and snap back out. 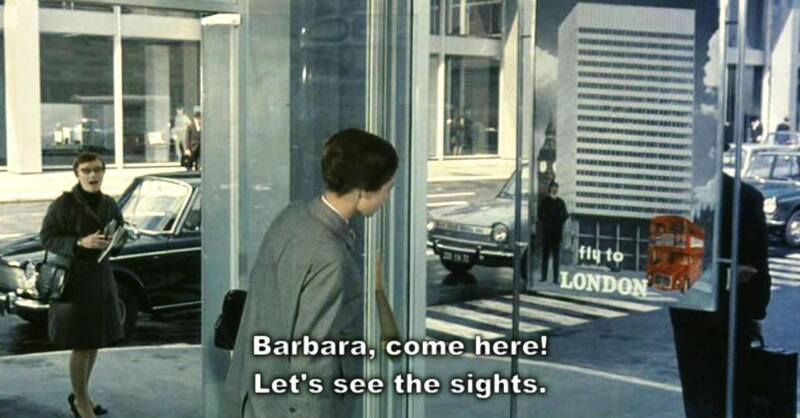 Barbara is shown in her hotel room, with a similar looking window to the other modernist buildings, facing the street. The hotel room looks uncomfortably small and features a rectilinear bed that looks equally as uncomfortable as the chairs. Tati explores the otion that just because people can create large, wall-sized windows, or rigid chairs that retain their shape through stiffness, does not mean that they should. G. At the Royal Garden Restaurant opens its doors its guests. 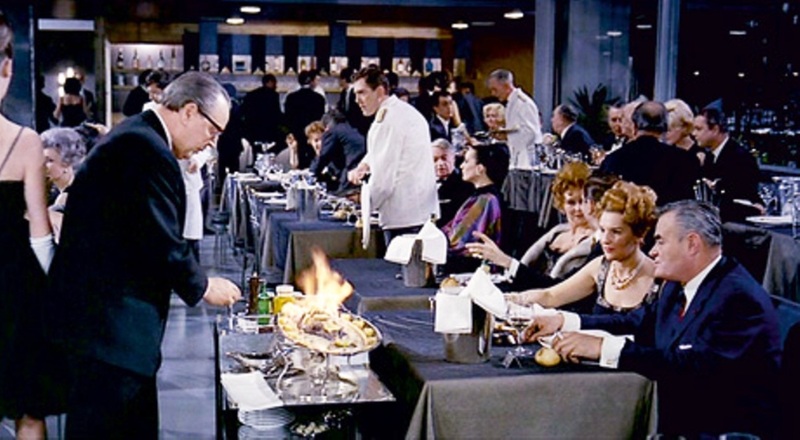 The last long sequence in the film involves the opening night of a restaurant at which everything goes wrong, and the more it goes wrong, the more the customers are able to relax and enjoy themselves. A little more than halfway through Play Time, Tati slowly reverses the pattern of perplexity, allowing the characters to become aware of the world’s capacity for transformation and letting them take control of it. 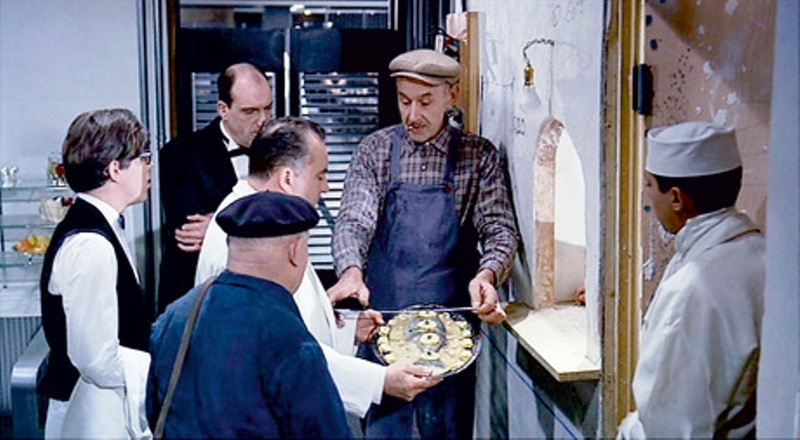 The restaurant employees and the carpenter analyze the basic problem with the food pickup window from the kitchen being too small as the platters food are served are fairly awkward and hard to work with. 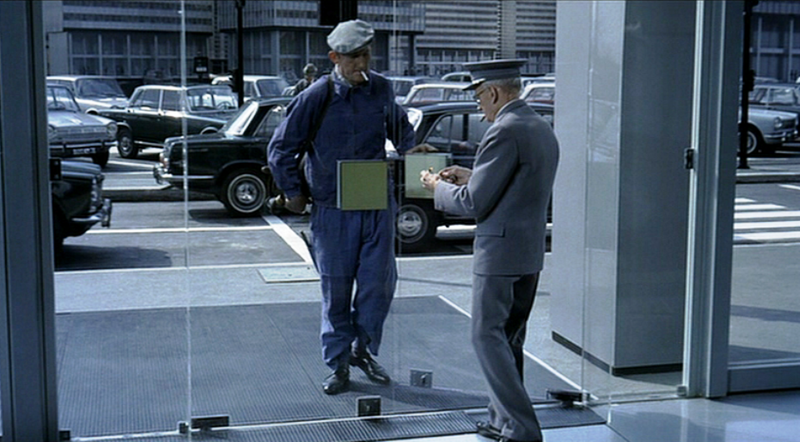 The conversing characters, all contemplating an elementary problem and finally the concierge simply implying that it is unnecessary to modify the window size, but to simply use the door. The waiter moves towards the door only to almost be hit with it swinging out. The stereo sound technique combined with the dubbed dialogue offer a layered story to be communicated in one simple scene. From the moment when we arrive to the Royal Garden, inefficiency takes over for good. 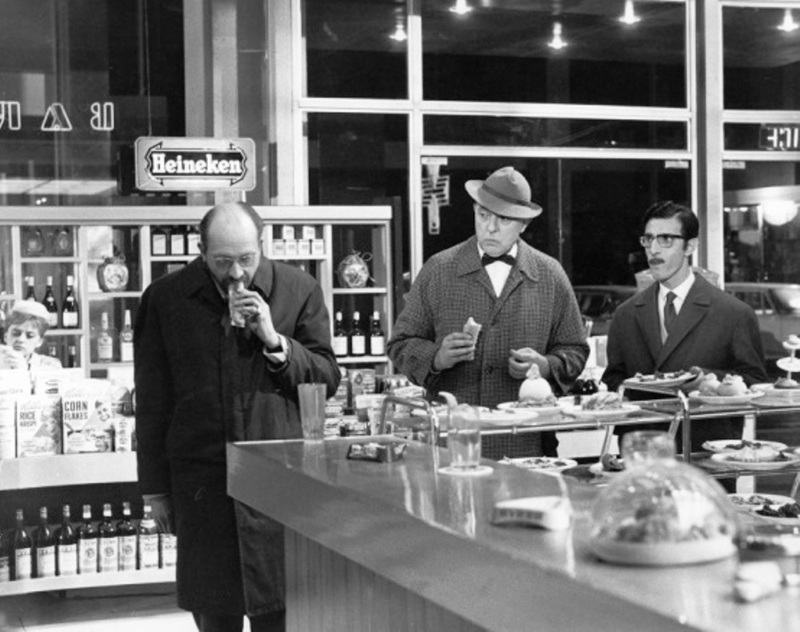 H. Monsieur Hulot eats a sandwich at the Drugstore and is found by a friend who works as a door man in the Royal Garden. 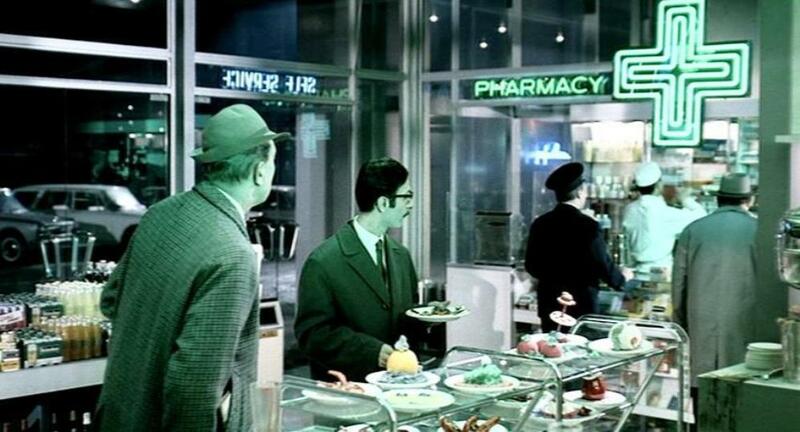 One such hybrid space is created at the ” drugstore ” described as “part pharmacy, part café-bar, where even the food acquires a greenish tint more suited to clinical spaces than to a snack-bar”. 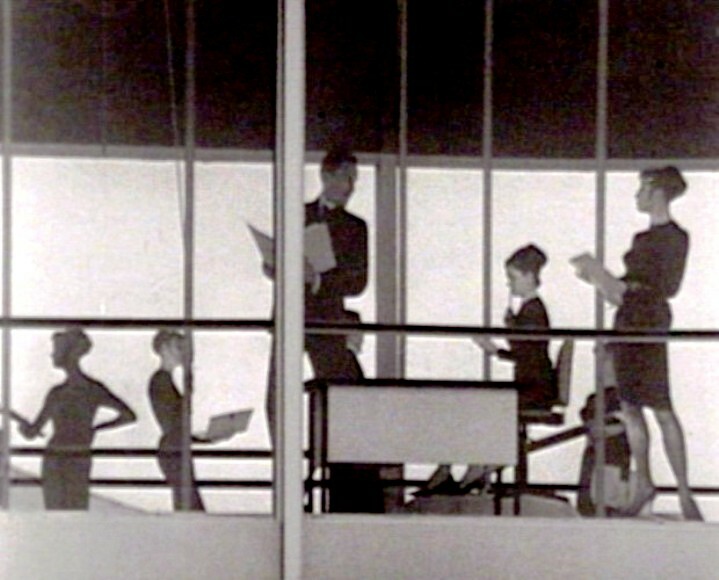 Many of the shots of the modernist interiors of Playtime are accompanied by a droning mechanical hum or (in counterpoint) an absolute silence, both of which are the product of a non-human or, rather, unnatural mediation of the sonic environment. 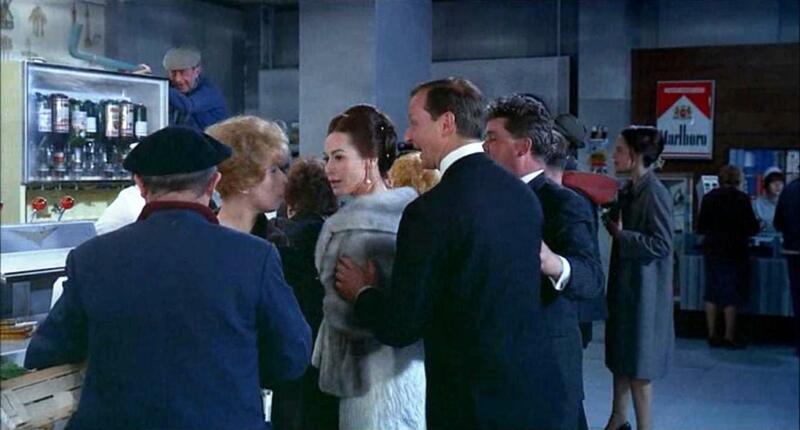 I. Monsieur Hulot goes to the Royal Garden opening party and meets Barbara while the whole restaurant falls apart. 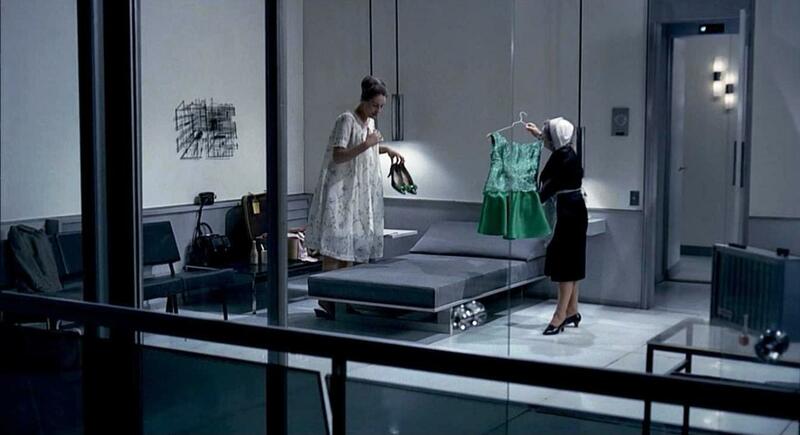 Tati’s ability to express his discontent with modern conventions of living are made obvious during this scene. 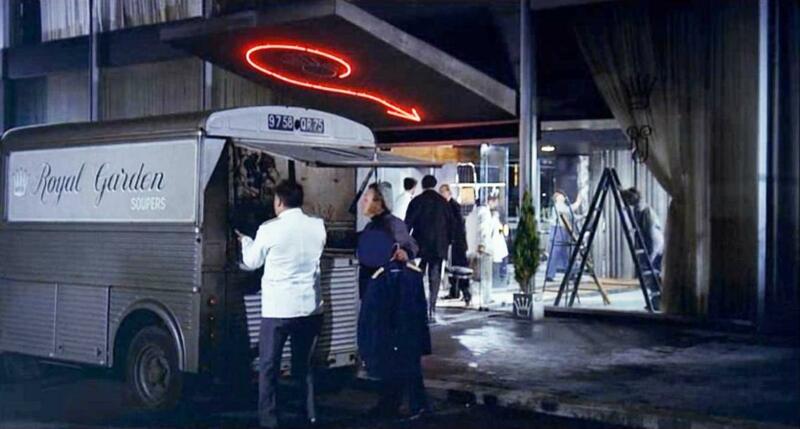 The restaurant is opening before it is finished, and absolutely everything that can go wrong, does. There’s such depth of content in each setup. 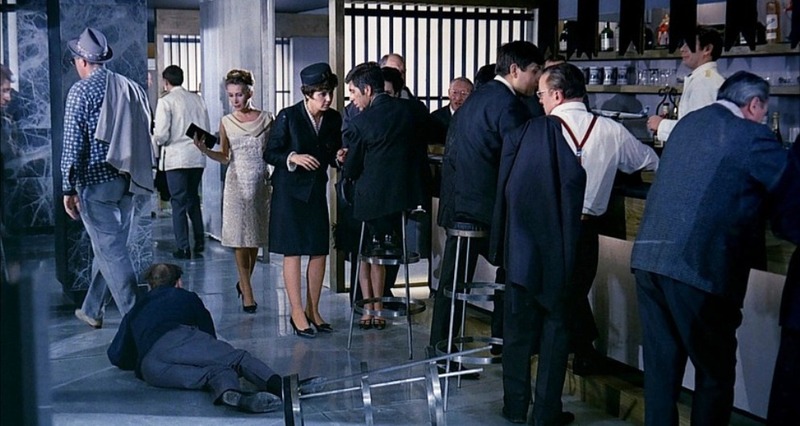 While the nightclub staff are frantic to create that alienating environment for the characters of the first part, they hadn’t counted on M. Hulot, who innocently brings the whole thing down. Thanks to him, the construction workers are drinking with the oil millionaires and the drunks off the street are drinking with the white collar drunks. 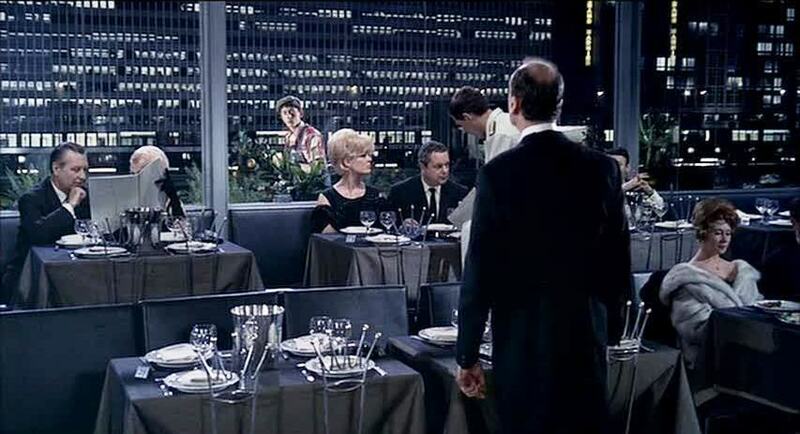 At the restaurant, Hulot reunites with several characters he has periodically encountered during the day. The doorman who had to deal with the glass door shattering had been pretending it was still there and holding on the brass door fixture floating in the place. 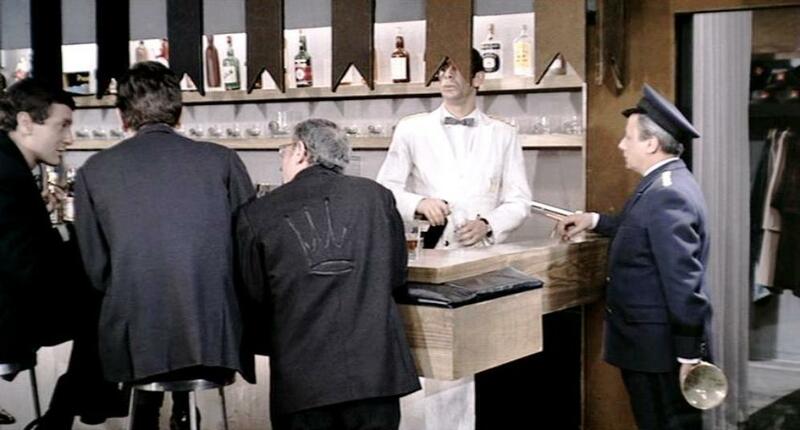 He continues to provide this service and create the illusion that everything is going well but he is stressing out – so he turns to the barman ( still with the brass door handle in hand) and gets a drink to calm his nerves. Then there are the calm, assertive locals who seem to casually carry on with all their daily tasks in the background of scenes. A stylish Parisian woman gets her heel stuck in a crack in the floor as she struts across the restaurant. Rather than acknowledge that her heel is stuck by showing some sign of surprise or embarrassment, she attempts to discretely and gracefully wiggle her shoe out of the crack before continuing to sashay across the floor. It’s as though admitting to any kind of altercation with this modernized world, would disrupt the conformity and be uncivilized. 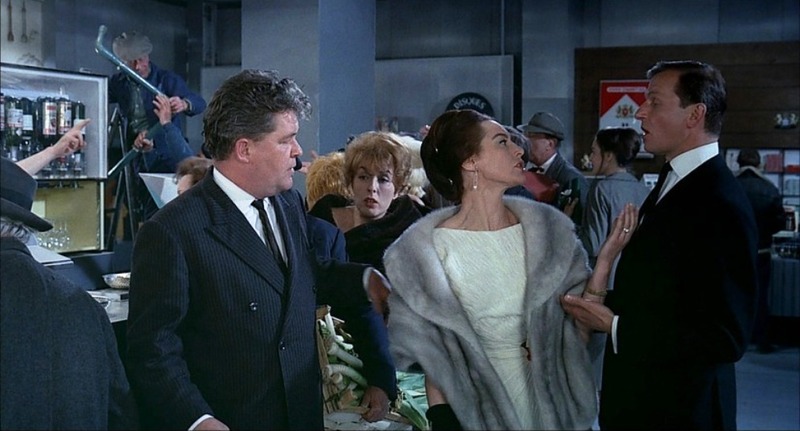 One of the main characteristics of this movie is the differentiating contrast between the two main groups of people the tourists and the “modernized” Parisians. The tourists are a bunch of clumsy, seemingly naive people attempting to experience the Parisian modernity. While the tourists seem to accept the inhumane quality of the architecture as part of the foreign world that they are exploring, the locals embrace it without question as part of modern life. 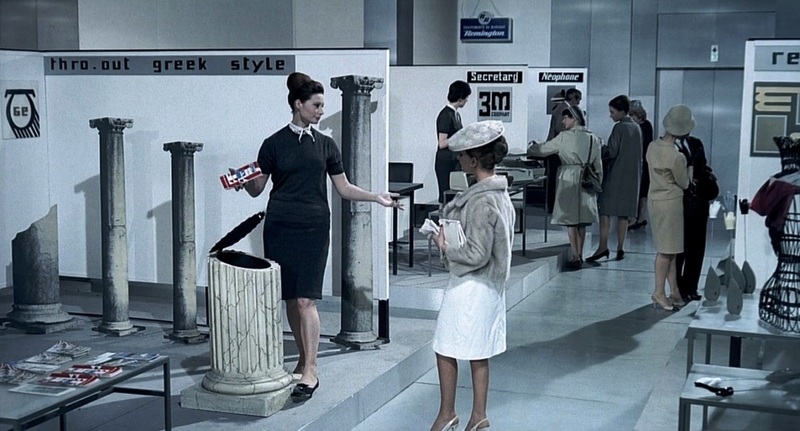 Both cases result in absurdity and an extremely amusing commentary on modernity in the 1960s. 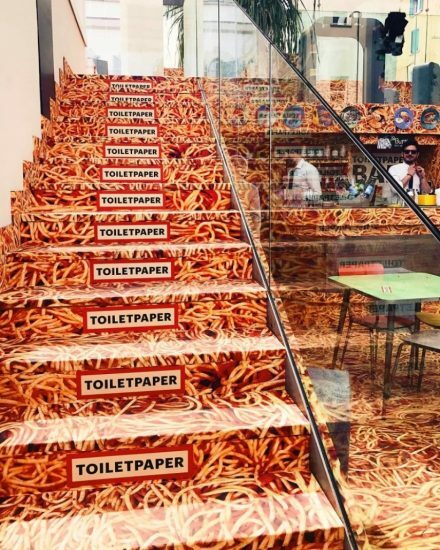 Several ongoing jokes continue to unravel : the fact that everything is coming together quite horribly allows humor to rise to the front – the restaurant is slowly filling up and issues continue to arise. 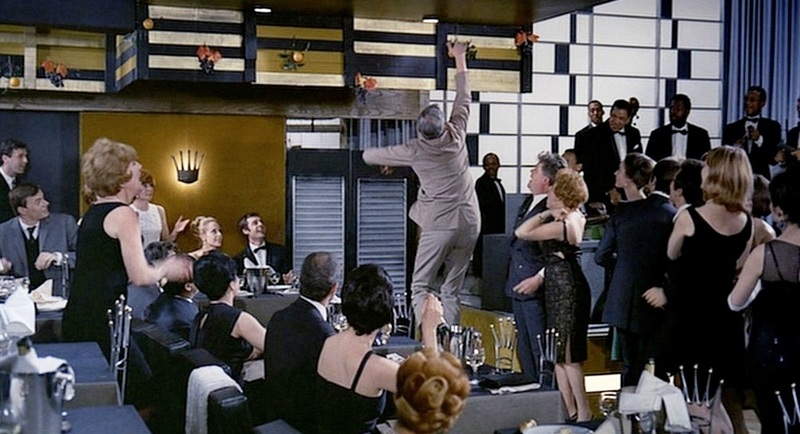 The chaos of the dinner sequence is highlighted by the lack of expertise of the restaurant’s staff. The Restaurant Royale, the pinnacle of upper-class modernity, scarcely manages to serve any food. 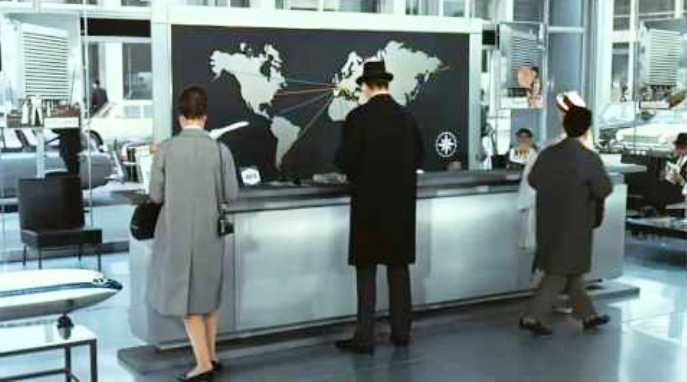 Above we see M. Hulot is giving directions to a stranger using a grey scale map of the city. The image below shows the stranger getting so lost in deciphering the map that he mistakes the patterns of the grey marble wall as the map. 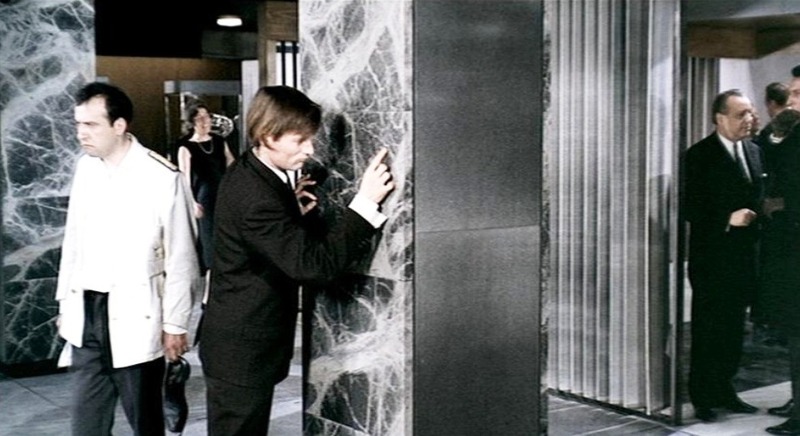 With these two scenes, the director makes a direct comparison between Modern Paris and the marble. 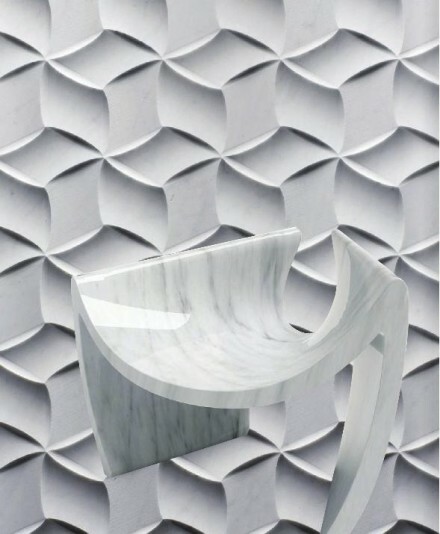 Tati implies that Modern Paris is like marble in that it has become grey, solid, flat, shiny, and cold. 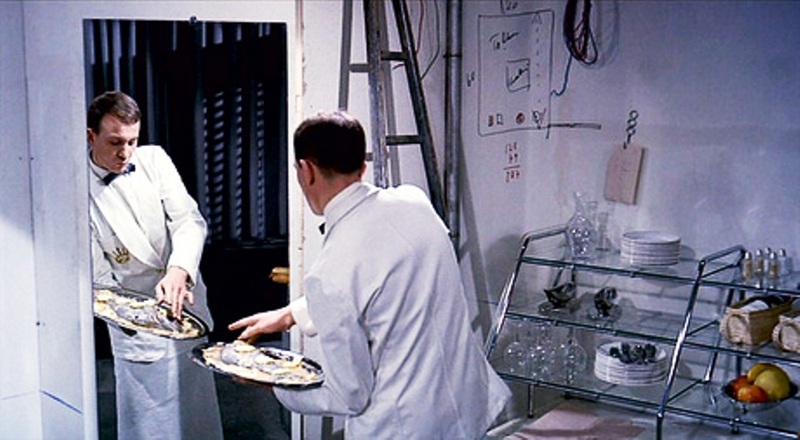 A waiter who ripped his uniform plays maybe the most important or standout role as the scene comes back to him every few minutes to continue the joke. He tears his trousers on one of the spikes from the crowns that decorate the backs of the restaurant’s chairs. These are the same crowns that get imprinted on patrons’ backs. 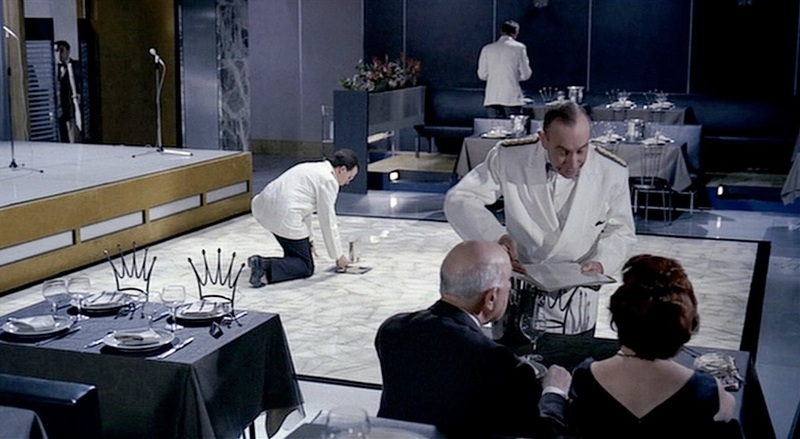 As he hides behind a column in embarrassment of his uniform, he communicates with another waiter to help him out and in turn as other waiters uniforms malfunction they all go to him to leave him with the defected outfit parts and take his undamaged ones. The stereo sound continues to offer more story than meets the eye as conversations and music mix together. Once the jazz musicians start playing it is evident that customers slowly start to become more real and less robotic. The use of the continuous jazz music track, that meanders through instrument solos, lets the scene float around and give the impression of a more relaxed atmosphere. The diners escape the constricted space of their individual booths, where the waiters pushed the tables back into position to lock them in like a vise. 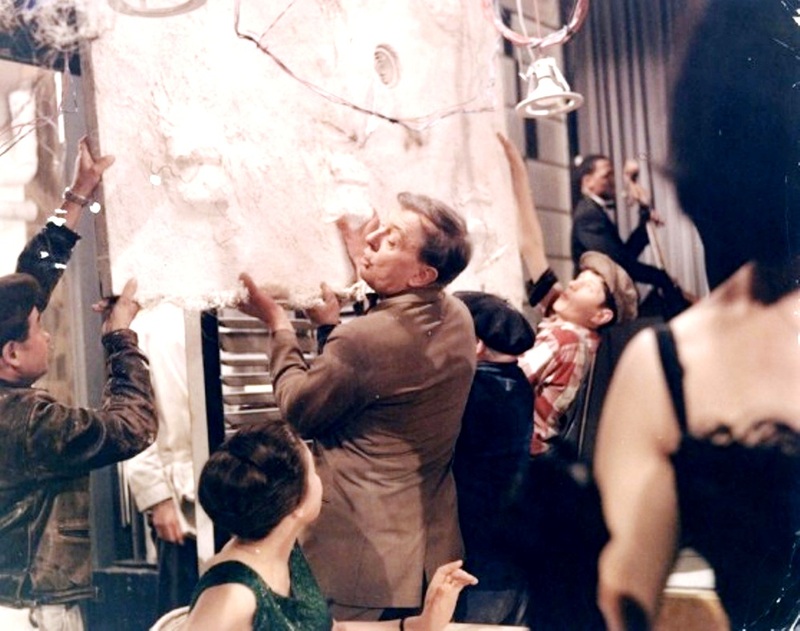 Hulot himself triggers the worst of the disasters, accidentally pulling down a large section of the ceiling, which has the effect of sectioning off one area of the restaurant into an ad hoc VIP section with a boorish American tourist playing bouncer. 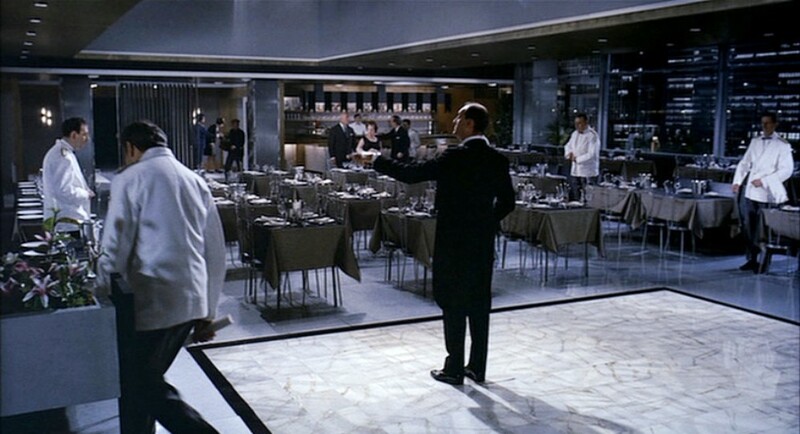 A collapsing ceiling cordons off part of the room, and he uses the imprints left on the diners’ backs by the poorly designed chairs to determine who will be allowed entrance to his private establishment. 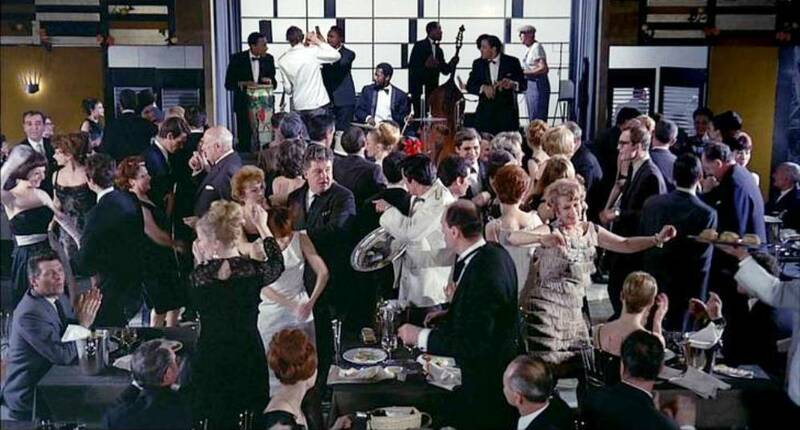 The more the restaurant falls apart, the more the people there seem to enjoy themselves, and the staid, ordinary dinner transforms into a wild, frenetic party with a packed dance floor and little pockets of merry-making scattered around the room. Barbara now steps up on a stage that had been abandoned by the band when the ceiling caved in, and begins to play the piano. 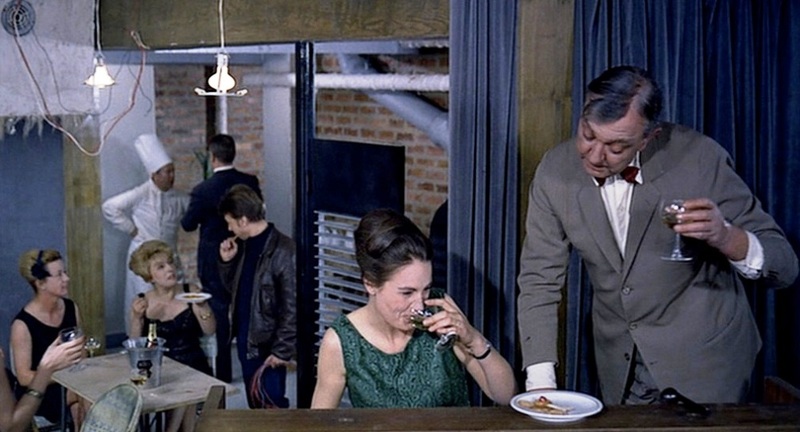 M. Hulot brings her a drink, and some food. A social fervour rebuilds and gains momentum as the French woman gets everyone to sing a 3/4 patriotic-sounding ballad. Soon he has his own music playing, and everybody is having a whale of a time. 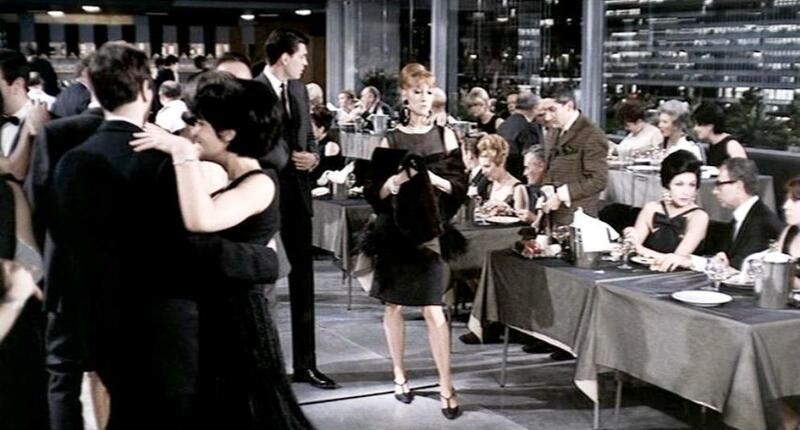 As their elegant surroundings crumble around them, and they become increasingly drunk, staff and guests lose their haughty aloofness, with its implicit boundaries of class, and the restaurant is transformed from a ritual of affluence to a giant, rowdy playground. In Play Time, the destruction not only liberates, it finds a place of grace. 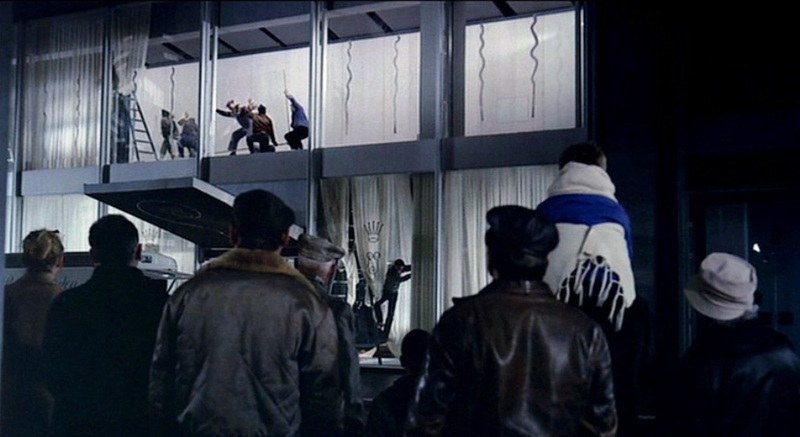 The theme of adapting to the built environment, rather than the built environment accommodating the occupants, is consistent throughout the film. 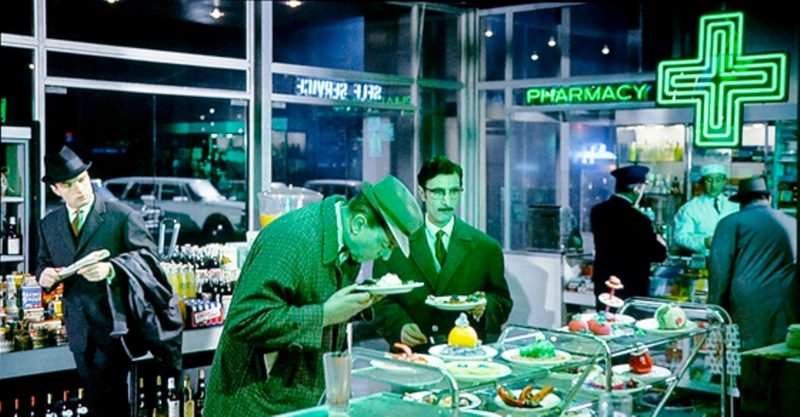 J. Monsieur Hulot and Barbara have breakfast at the Drugstore. This third phase of Tati’s film comments on the other two. 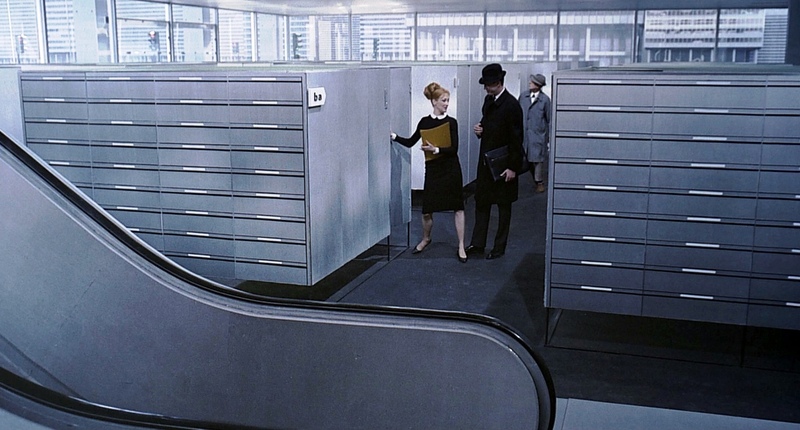 In the first, modernity, its architecture and machines and communication, controls and constrains the humans in it. In the second phase, the crazy restaurant, the humans break down the architecture in their “Play Time” after working hours. But in the third phase, they come to terms with their biological animal nature. They eat and drink and enjoy the company of others. When they finally emerge from the restaurant the next morning, the world is transformed around them. As they come out of the Royal Garden, one of our first sights is a dug up portion of the pavement. As if to signal a turn toward biological reality, a totally improbable rooster crows. 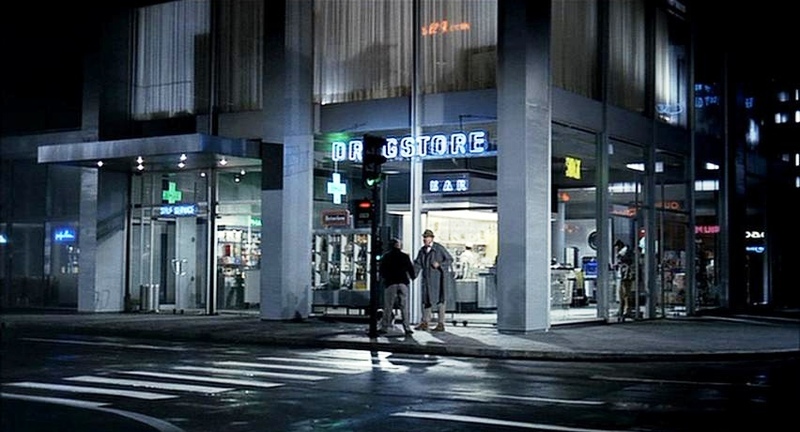 The characters amble into Le Drugstore, looking for food. Following the all night riotous party at the Royale Restaurant , now the local workmen, american tourists and french society types mingle, all driven by the common human, biological imperative: the need to eat. 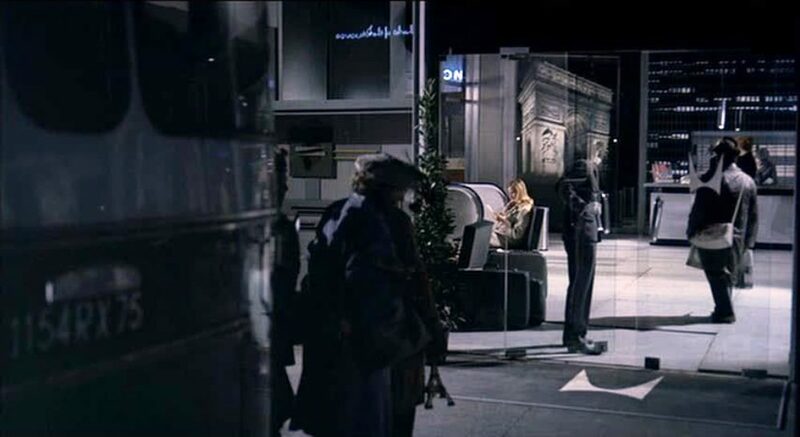 To underscore the transformation, Tati gives us the final reflected image of Paris, on the drugstore doors. It happens to be the Sacré-Cœur / Montmartre, which means a benevolent presence, a blessing. 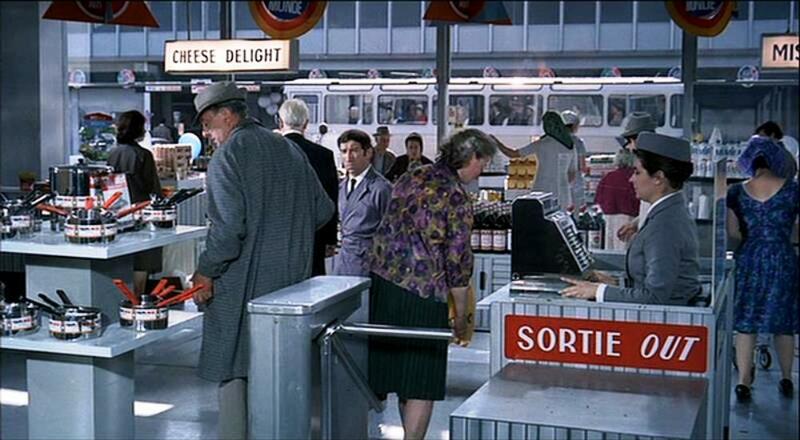 K. Barbara and Monsieur Hulot walk together through the streets and enter a supermarket. The real France is only ever hinted at in reflections or off in the distance behind “more important modern things. 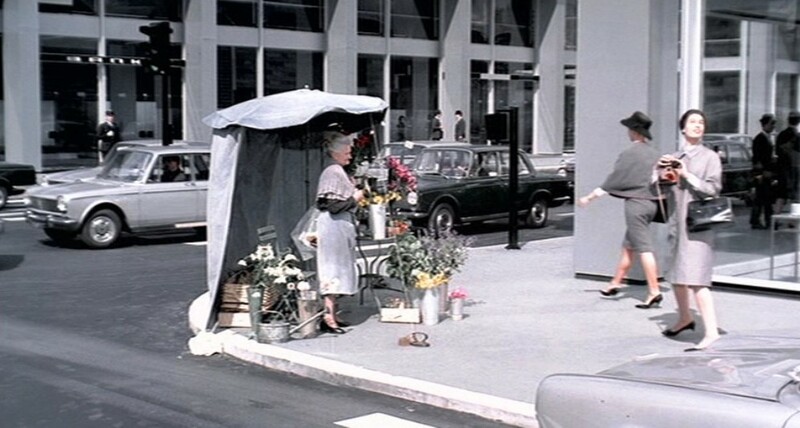 ” All of Tati’s/Hulot’s beloved old France has been relegated to a single street corner, in the form of a woman selling flowers under an umbrella. 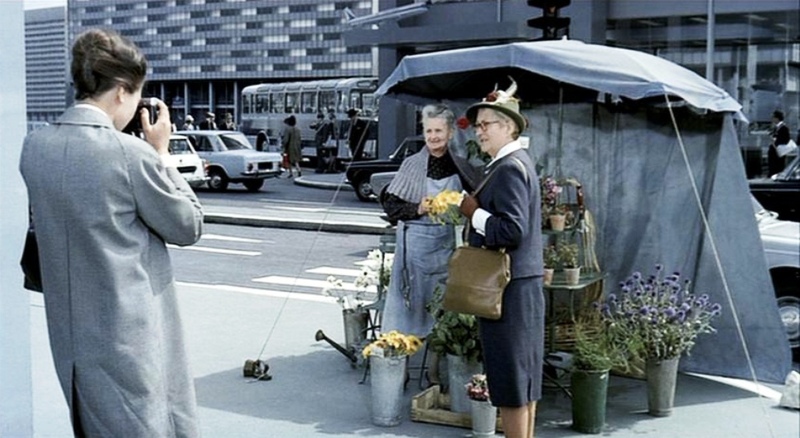 Barbara doesn’t respond to the flower seller as a person – all she sees is a tourist image – “ this is the real Paris ! ” she says and any potential customers are shooed away, so as not to disturb the ideal photograph. 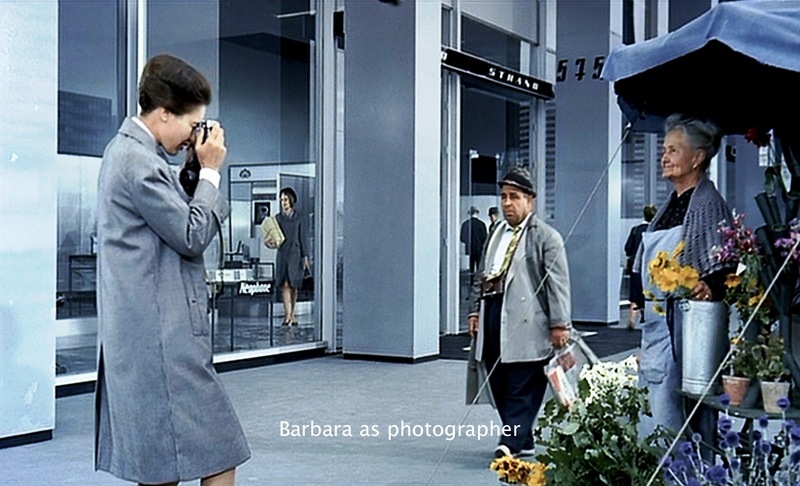 M. Hulot helps Barbara to finally get her photo. 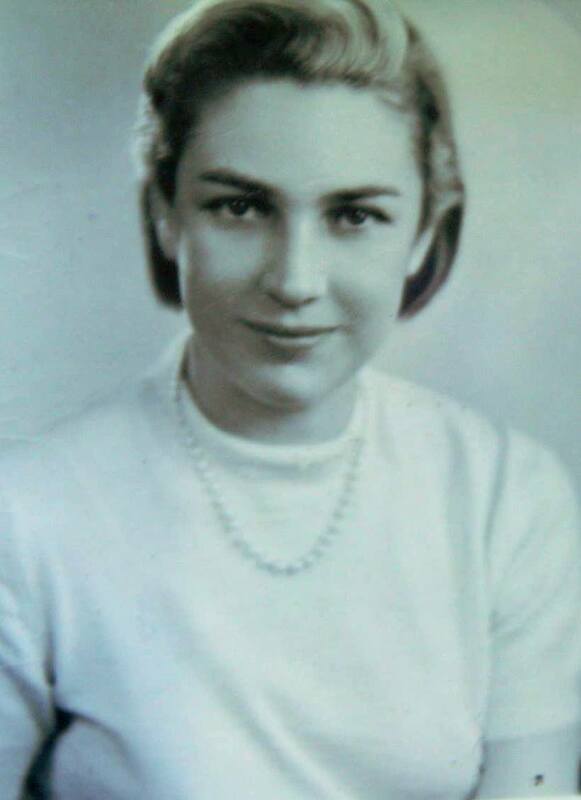 Once she has got the photo she wanted Barbara happily goes away, without a thought of buying any flowers. In any case, a positive transformation has indeed occurred. 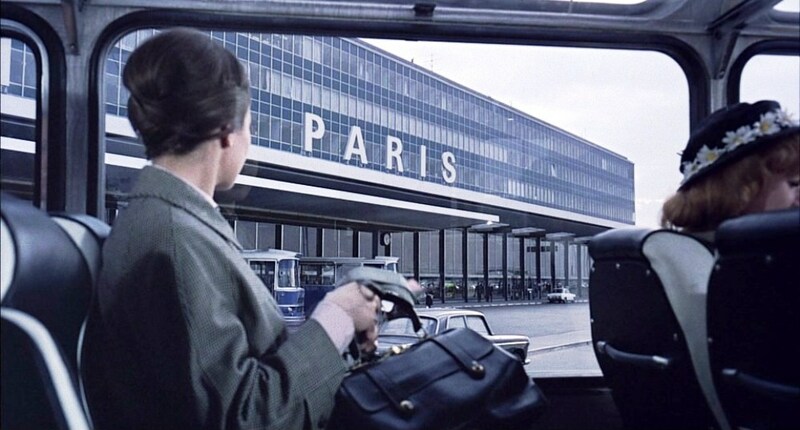 Near the end, M. Hulot buys a going-away gift for Barbara (Barbara Dennek) as she is about to leave Paris with her tour group. 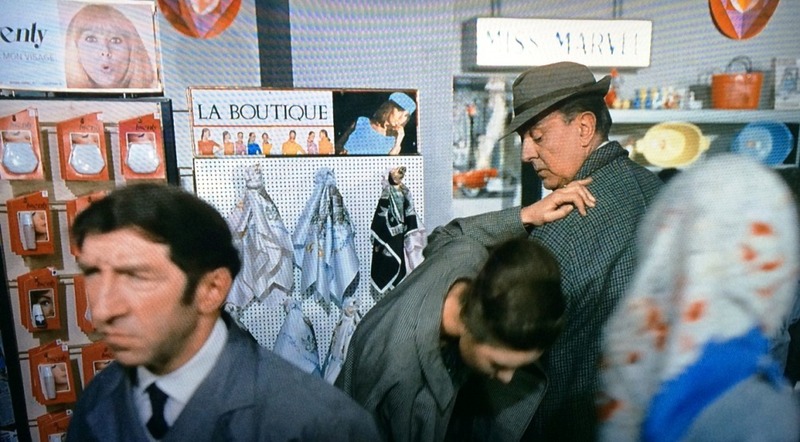 Hulot is attempting to leave a small and crowded magasin with a souvenier gift scarf for Barbara. He manoeuvres around a set of pot handles sticking into the aisle, only to be told he must go back and exit through a turnstile which now looks remarkably like…a bunch of pot handles sticking out. 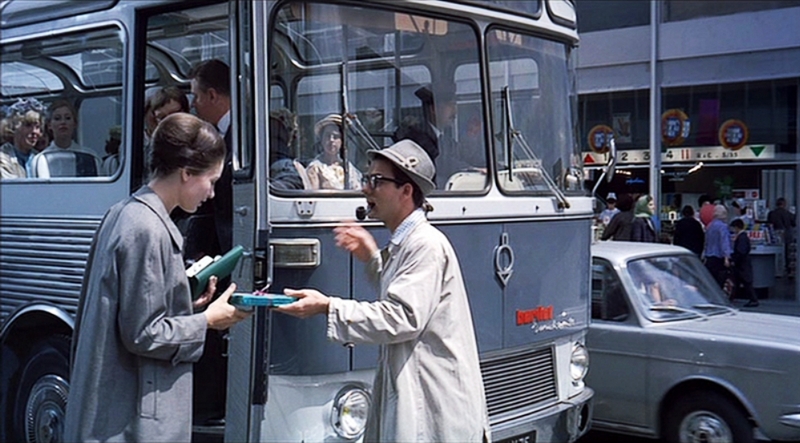 Hulot can’t reach her in time, but the encounter is saved by an intermediary faux hulot, who passes the souvenir on to Barbara as she boards the bus for the airport. 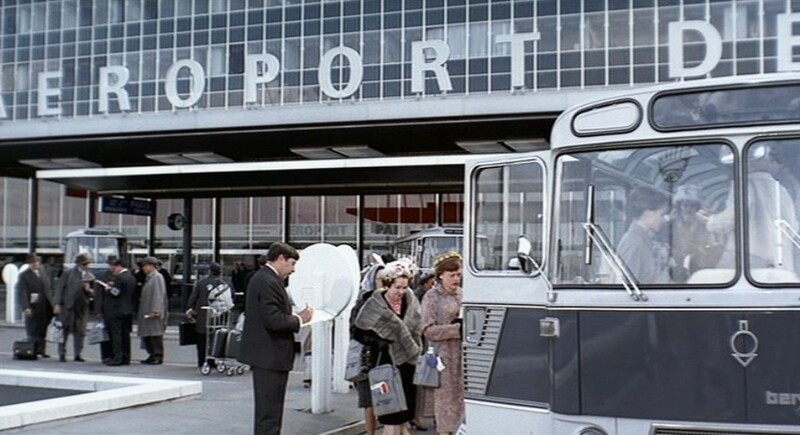 L. The tourist bus picks up Barbara and takes her, along with the other American tourist to the airport. By the end of Play Time, the once controlled atmosphere of the architect has turned into a circus. People are looser and happier, and colour has fully invaded the grey streets. 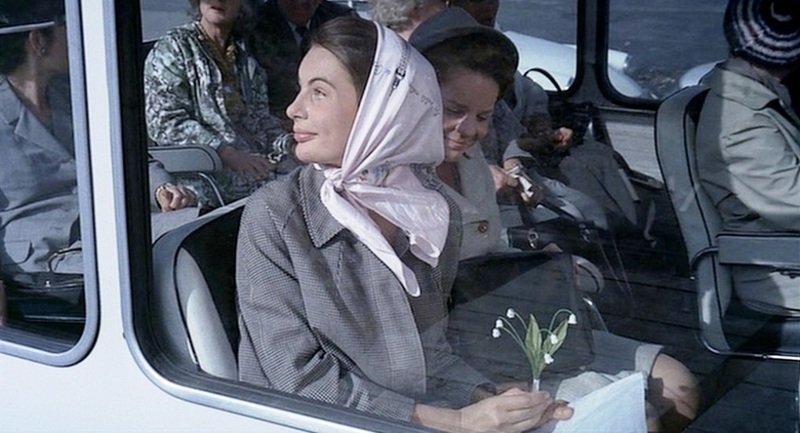 Tati leaves us with, a traffic jam that generates joy instead of numbness, a problem that solves itself by turning into a party, continuing the revolution begun at the Royal Garden and bringing about the triumph of what Tati called the indomitable French spirit. Nothing is moving in a straight line… everything is moving around a roundabout, which one could either consider celebratory (the reassertion of smiles and enjoyment) or ironically pessimistic (everyone is in motion, but no one is going anywhere). The final musical theme ironically comments on the choreographed movements of the tourists, the traffic flow, and the whole urban crowd control design principles which attempt to order and constrain social dynamics. In effect, this music functions as simile: the people move like marionettes on a rotating fairground display. 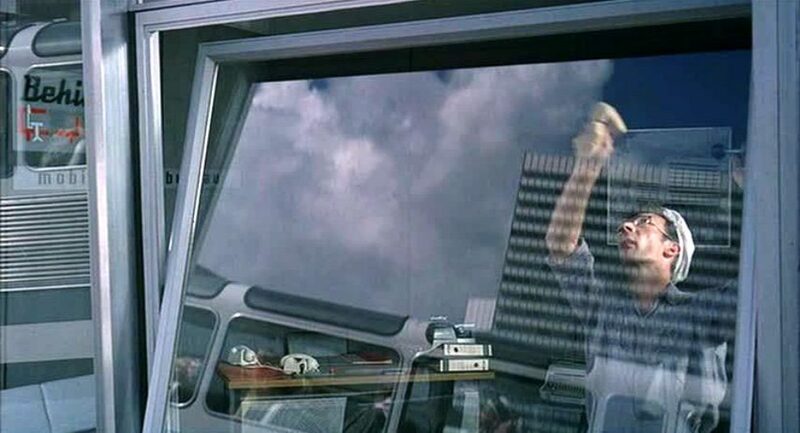 Now the bus seems to rise and fall as a workman reflects it in a glass he is cleaning. 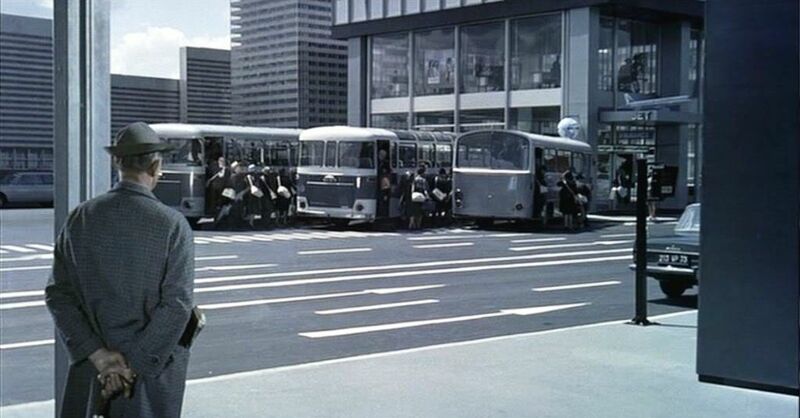 In the second, the tourists look out from their bus at what appears to be either a mechanic or fuel station at cars being inspected and going up and down on hydrolic platforms. Now a technician in working clothes on a mechanical lift shouting to his colleague on the ground, trying to communicate with him, amidst a sea of cars below and around. And all of this is being seen by the tourists through their bus windows. 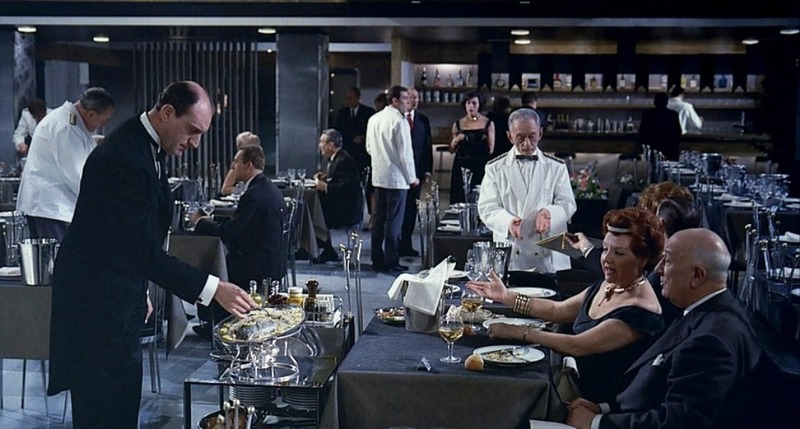 These scenes are all in stark contrast to the first half of the film, creating two great counterpoints essentially hinged by the dinner scene between them. On a basic level, the arc of the film in this way transitions from the sterile line to the fluid curve. 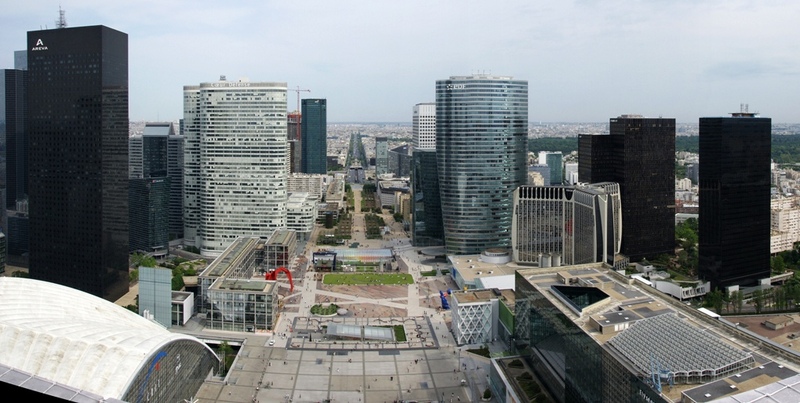 This is not a modern Paris in which everything is controlled, designed, calculated, and trimmed of excess like the earlier scenes of the protagonist man lost in the modern buildings and their modern furniture exhibition centers. This is instead a Paris where things are happening slightly in a more “natural,” unplanned manner. 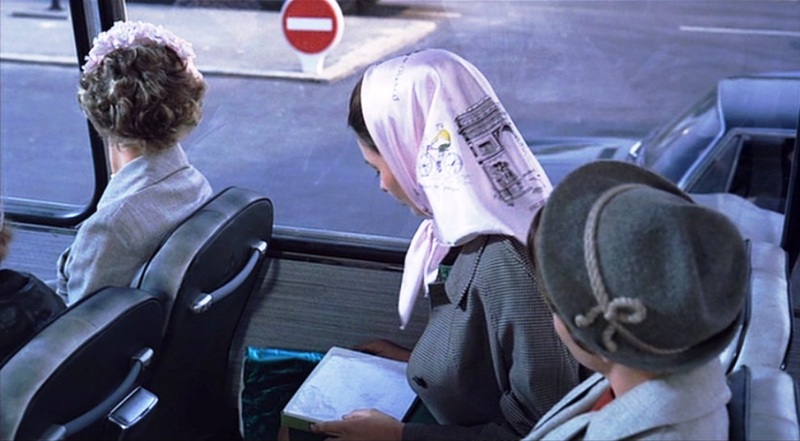 Barbara opens her gift box from Hulot and covers her head with the scarf – like the nuns at the beginning of the movie. 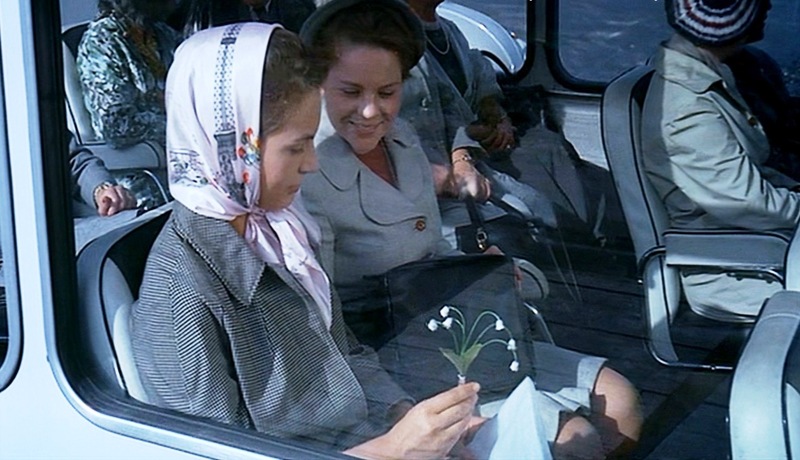 She then gets a sprig of the ” lily-of-the-valley ” flower which was under the scarf. 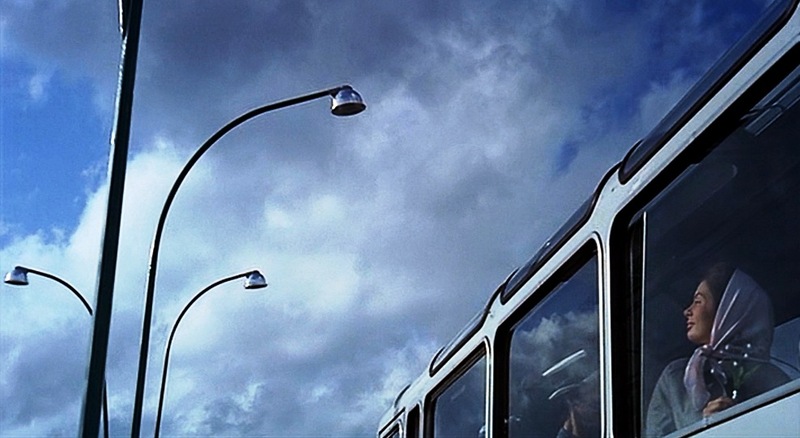 Tati cuts from the lily of the valley to the street lights that the bus is driving under. 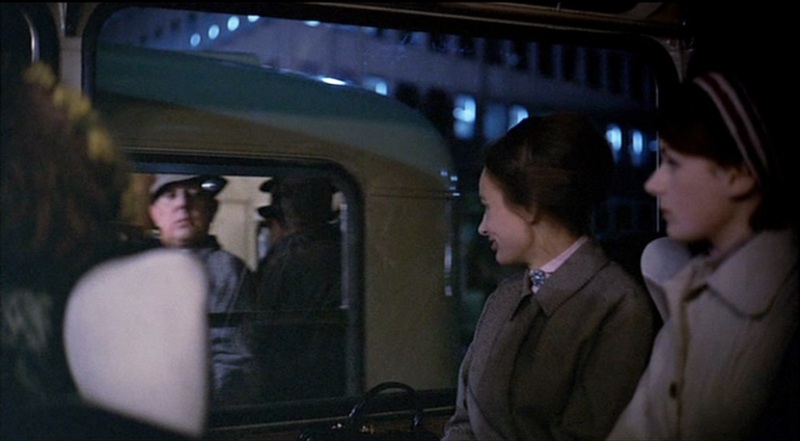 That the streetlights should offer so rich and emotional an ending shows how carefully Tati arranged and filmed every little bit of this movie. The film finishes with a stream of cars, their taillights disappearing into the night. 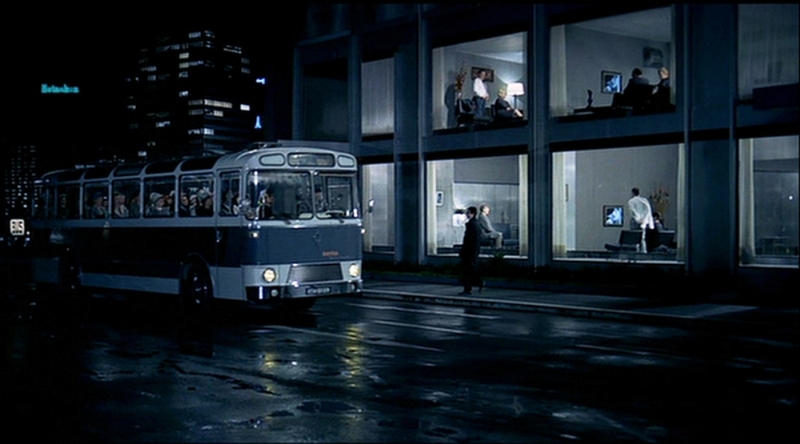 The finishing scenes of the movie continues the idea of transport and movement. It’s a perfect close to the entire narrative on modernity. 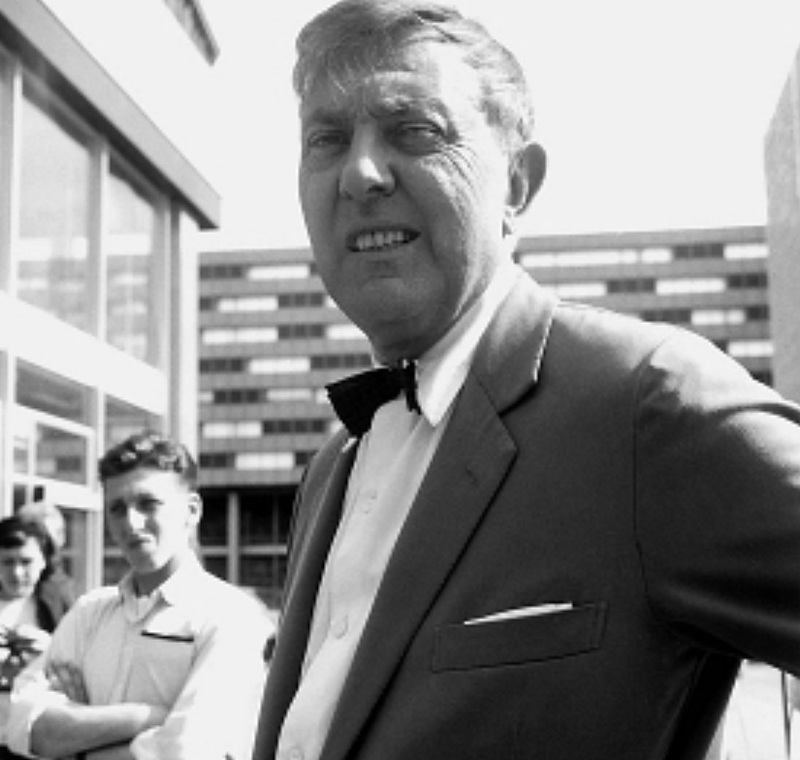 Jacques Tati (Titischev) was born on October 9, 1908 i.n Le Pecq on the outskirts of St Germain en Laye, Paris France. 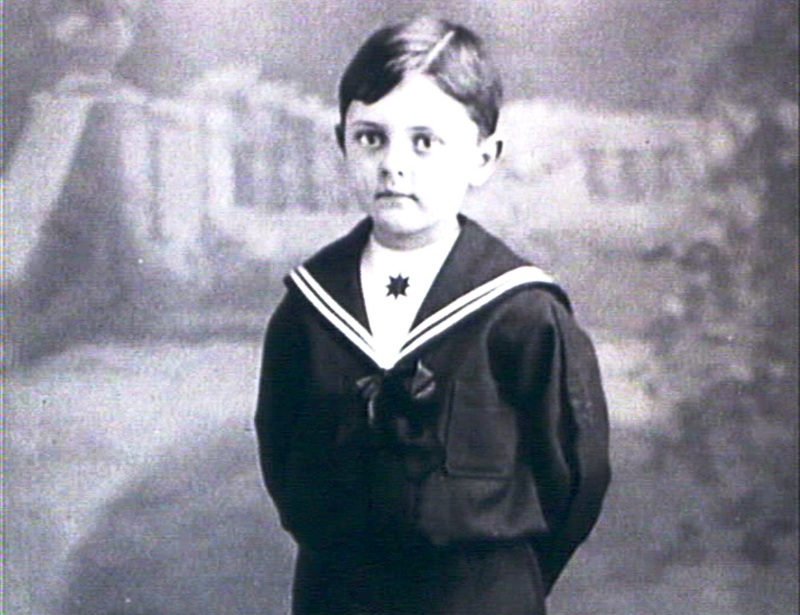 His mother was of Dutch origin, something which, he claimed, shaped his meticulous approach to comedy. “It is almost impossible to make the Dutch laugh,” he once said. 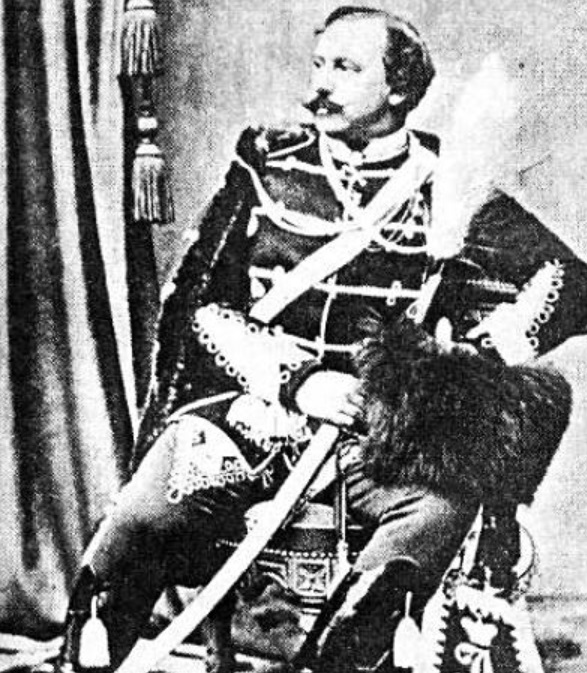 His paternal grandfather was a Russian General, hereditary Count Dmitri Tatischeff, military attaché to the Imperial Russian Embassy in Paris in the 1870’s. “It used to take him a week to go around his lands! It takes me 8 seconds. If all the Russian Generals were like that it’s not surprising that there was a revolution over there !! His maternal grandfather, a Dutch picture framer called Van Hoof, was a friend of Van Gogh and counted Toulouse Lautrec among his clients. 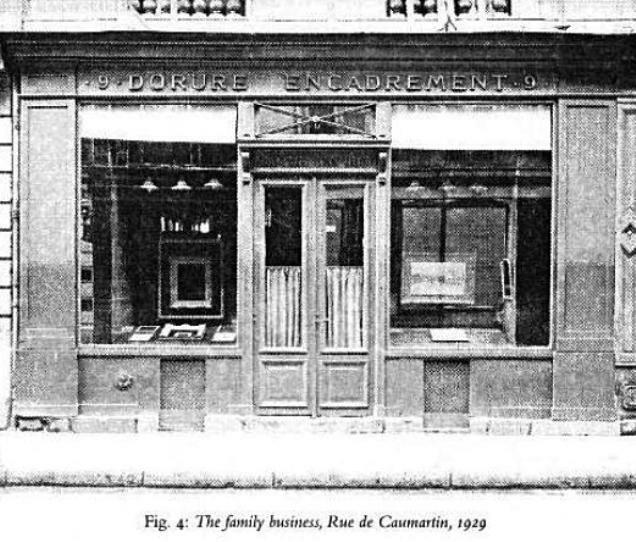 Van Hoof made Van Gogh’s frames ( but refused to buy his paintings ) Georges-Emmanuel, his father, “not a lot of laughs”, took over the prestigious framing company, Cadres Van Hoof, near the Place Vendôme. He spent holidays in Deauville, and his parents had their own framing shop just off the chic Place Vendôme in central Paris. After graduating from college in Saint-Germain, Jacques helps his father in his craft and preparing to enter the National School of Arts and Crafts. Young Jacques knew well what awaited him as a successor in the family business. Though he received art training so that he could enter his father’s art restoration and picture-framing business, much to his parents’ disgust, he became a mime and then began to get bit parts in movies. Military service was held at Saint-Germain en Laye, in the barracks in the Royal Square (16th Dragoons). Jacques was very fond of sports. 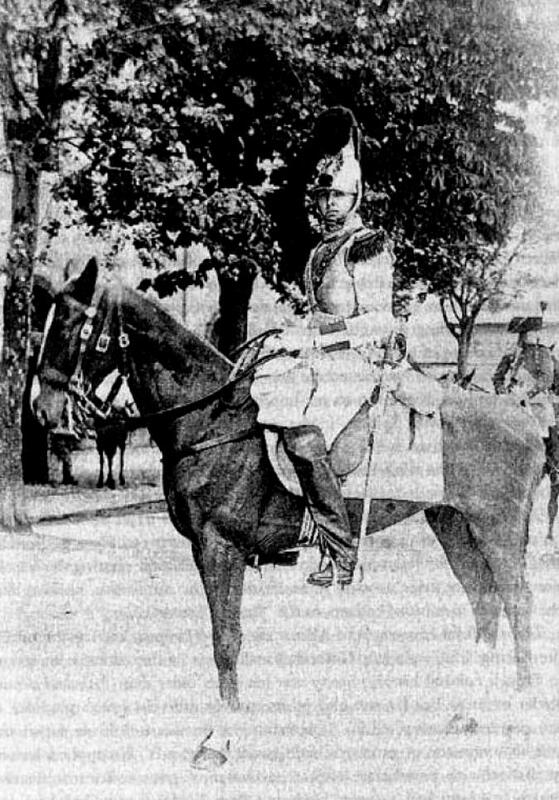 He played football and tennis, boxing, rode on horseback. When he had helped his father in the studio, he took vocational training in England, he discovered rugby. Jacques played professional Rugby joining the Racing Club de Paris in the French first division ( playing 2nd row ) and whose captain at the time was Alfred Sauvy. 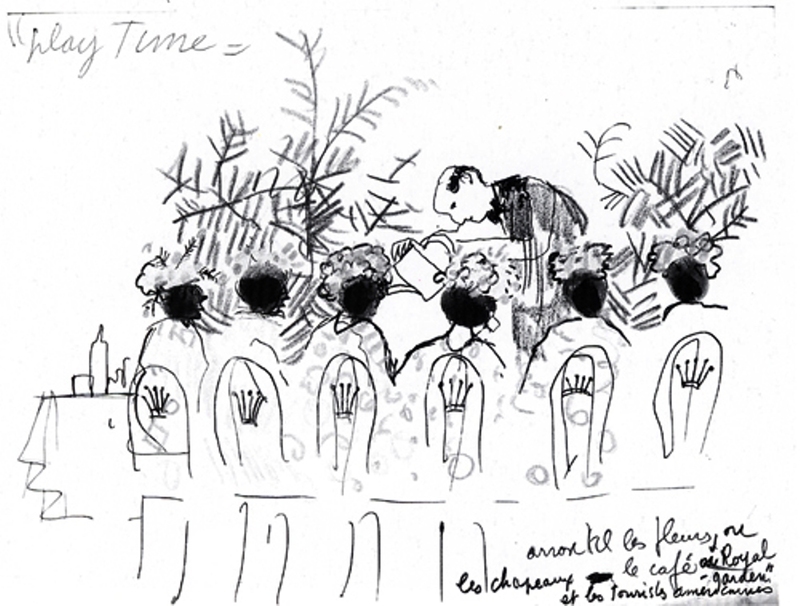 The first performance in public Tati took place in 1931 during Racing rugby club dinners. The reception was such that it has opened up new horizons for Tati. 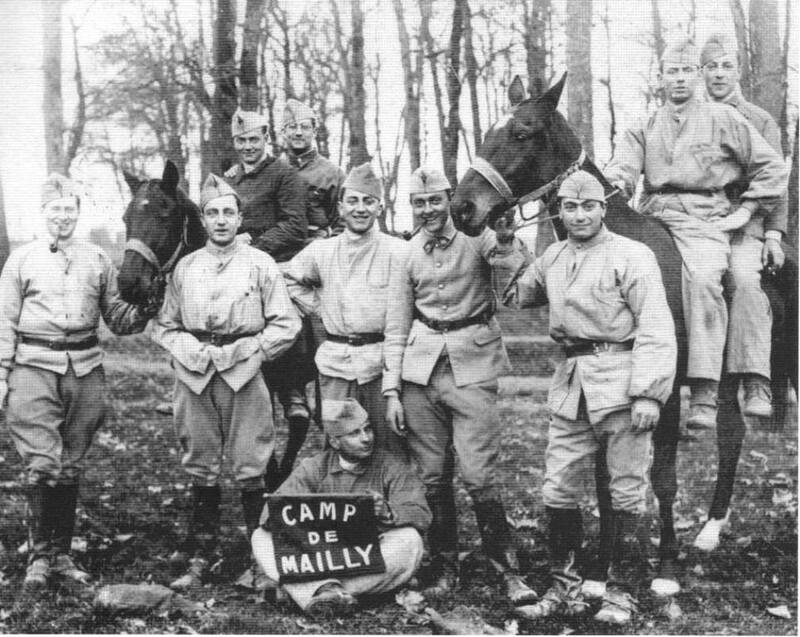 Between 1931 and 1932 the global economic crisis reached France at the same time he left both the Racing Club de France and his apprenticeship at Cadres Van Hoof. Giving up a relatively comfortable middle class lifestyle for one of a struggling performing artist during this difficult economic time, he developed a collection of highly physical mimes that would become his Impressions Sportives (Sporting Impressions). 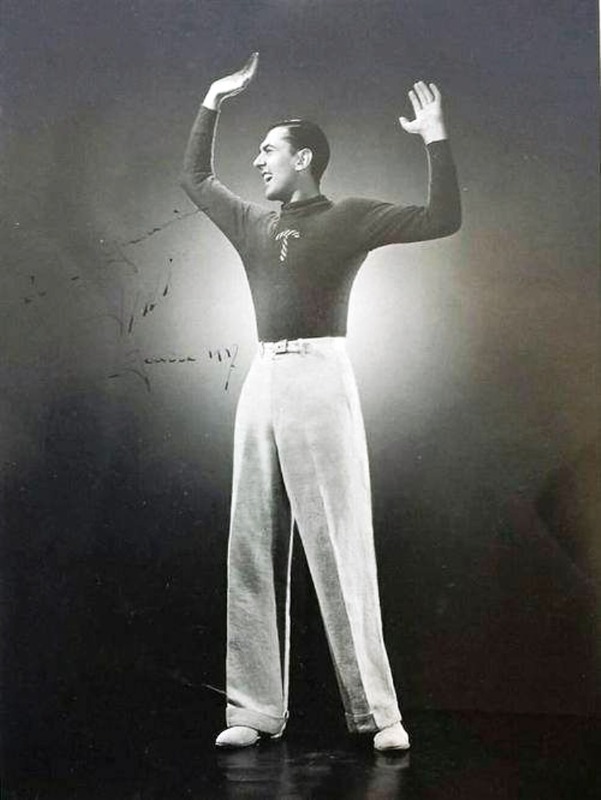 Each year from 1931 to 1934 he would participate in an amateur show organised by Alfred Sauvy. 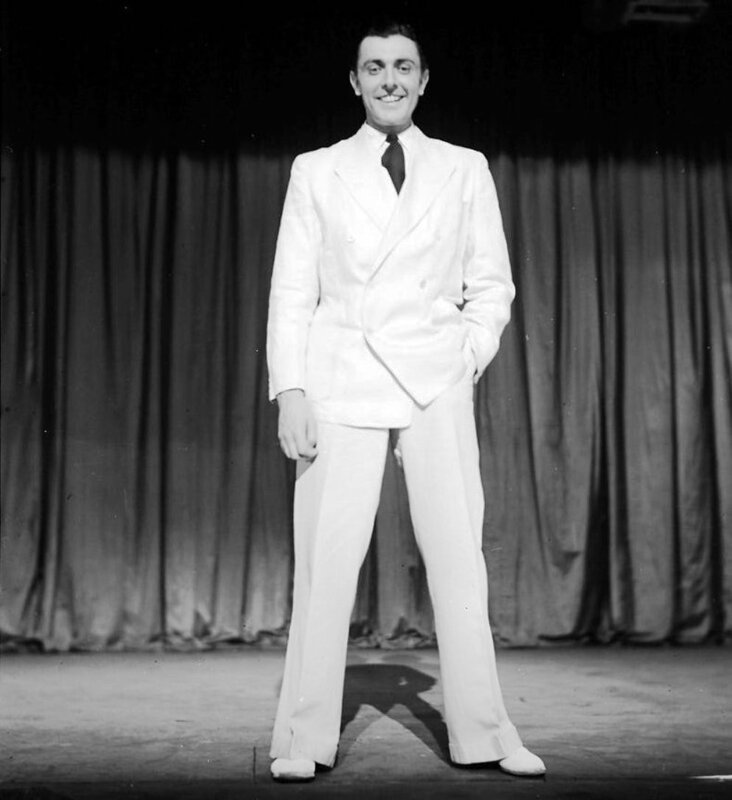 So began the long, tough struggle of the performing artist, moving from city to city, from music hall to circus, from theater to cabaret show – where his speciality was a comic mime of sportsmen. 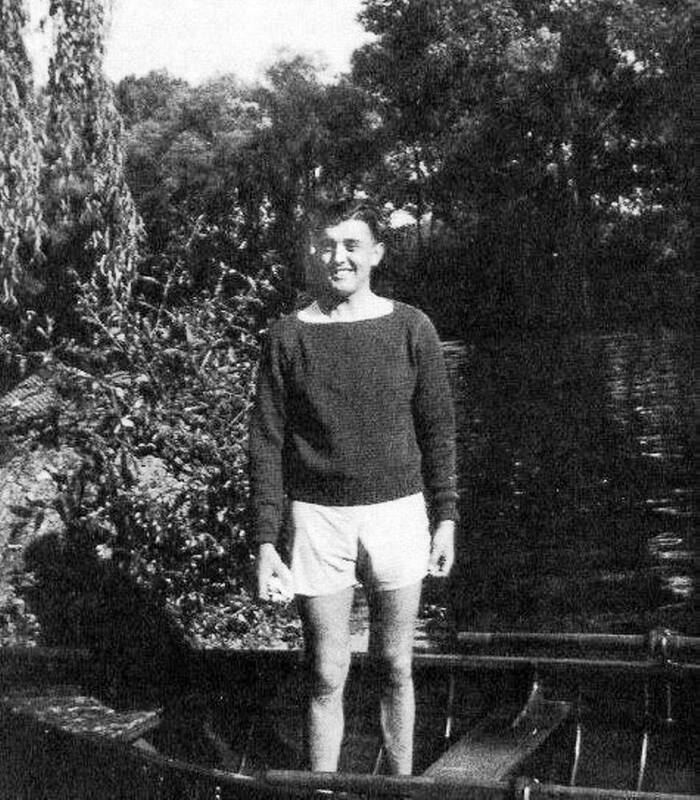 By 1931 he had put all thoughts of picture framing behind him. 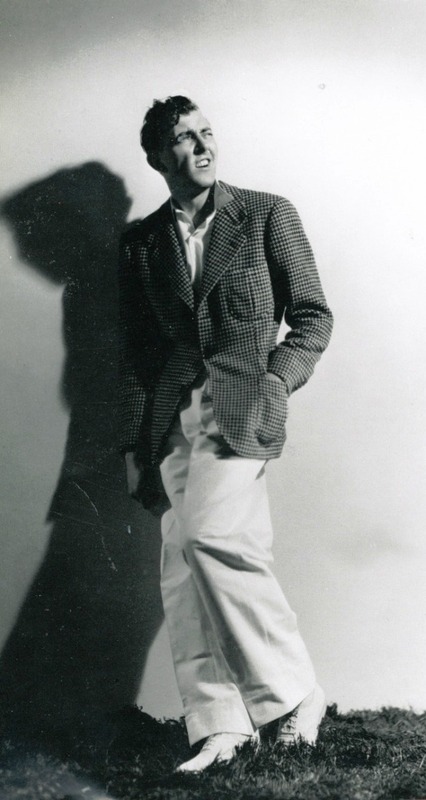 For two years he tried unsuccessfully to break into the Parisian scene, and only in 1933, he made his debut in Cabaret Louis Lepley, where the maitre d ‘portrayed. 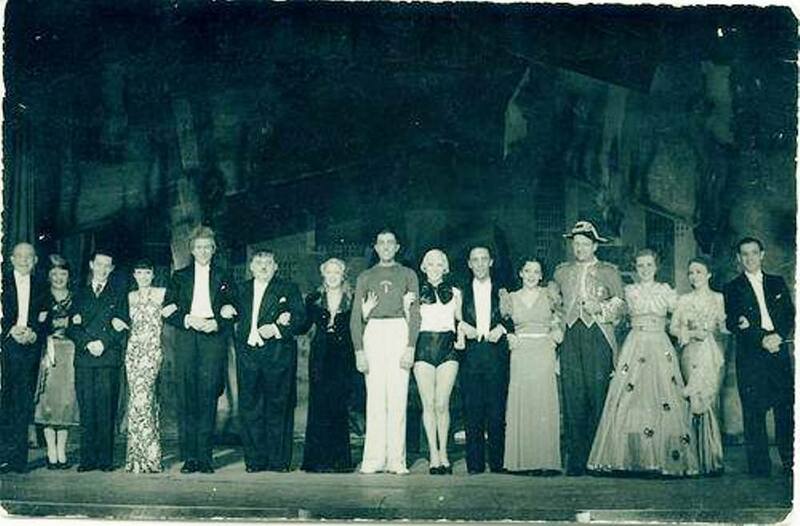 But really it can be considered as his debut sporting pantomime, which he showed in Ritse in 1934 at a party in honor of the ship Normandie. 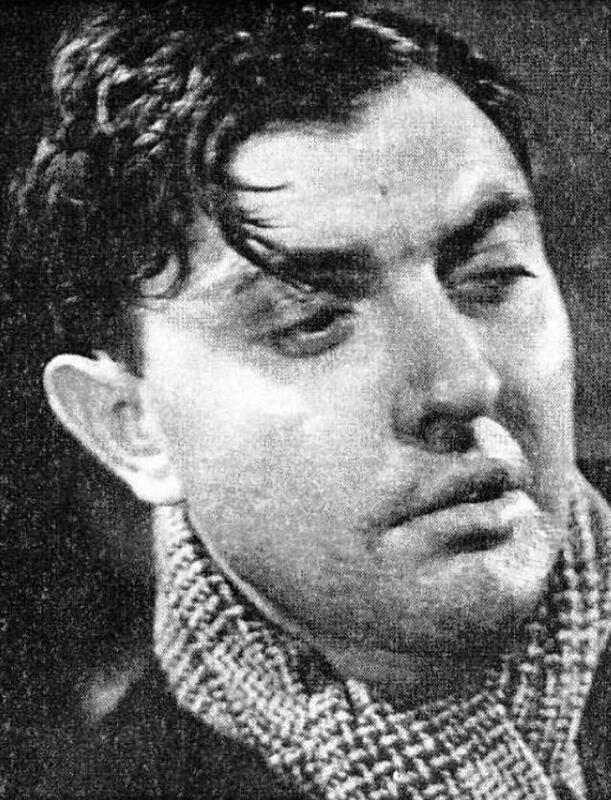 He acted in several comic shorts in the 1930s, which included Watch Your Left (1936) by Rene Clement. 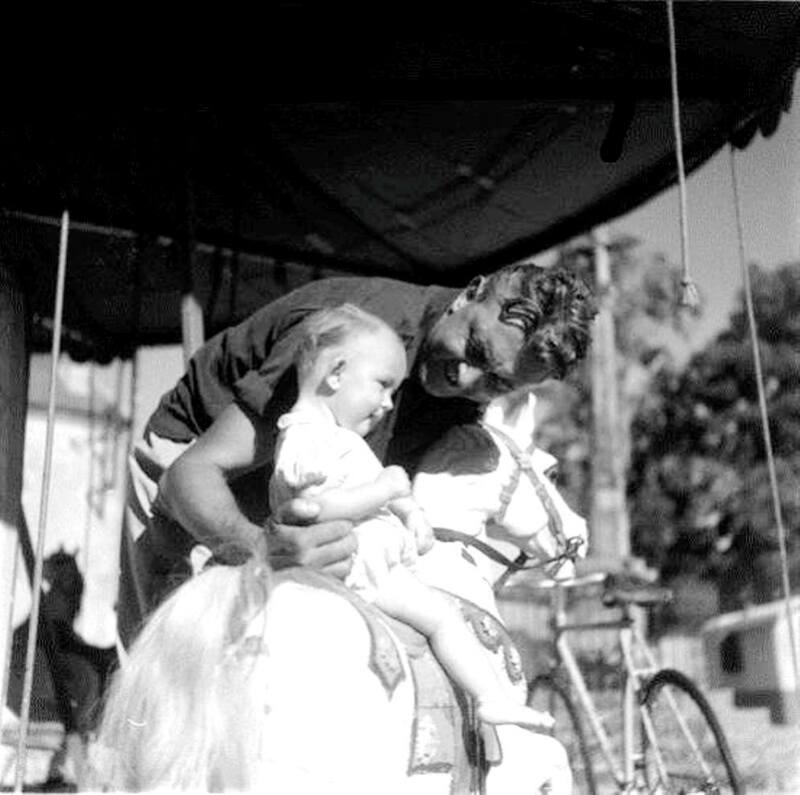 He embarked on a long and painful road music-hall artist, traveling from town to town, moving from theater to the circus, the circus at the cabaret. Tati then goes to the theater Michel. It was following a disastrous audition at the Finsbury Park Empire, after the war, that Tati decided to renounce the stage and pick up the camera. 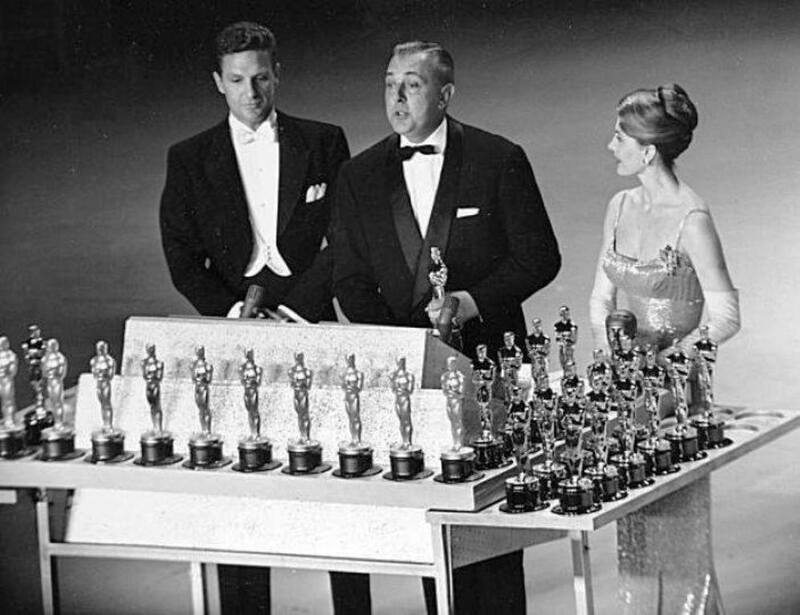 The switch was not unusual: music halls were dying out, film was attracting big crowds. 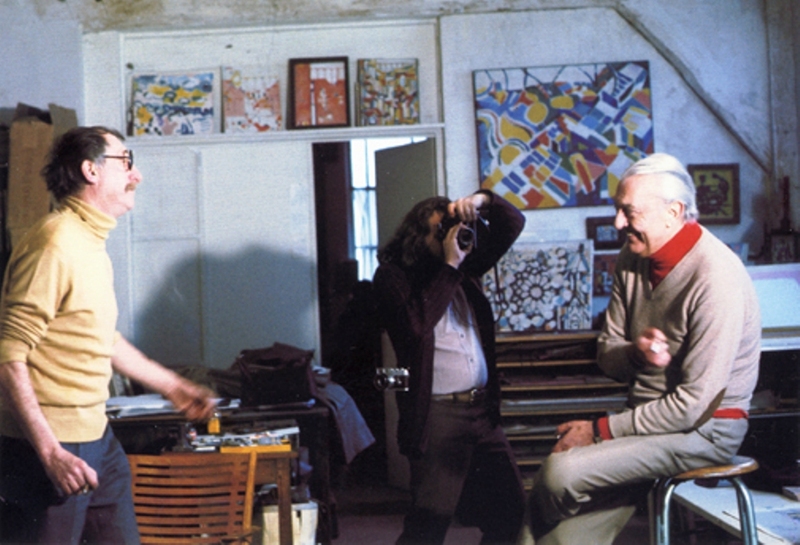 He longed to record his own comic routines and made a short film about François, a rural postman. 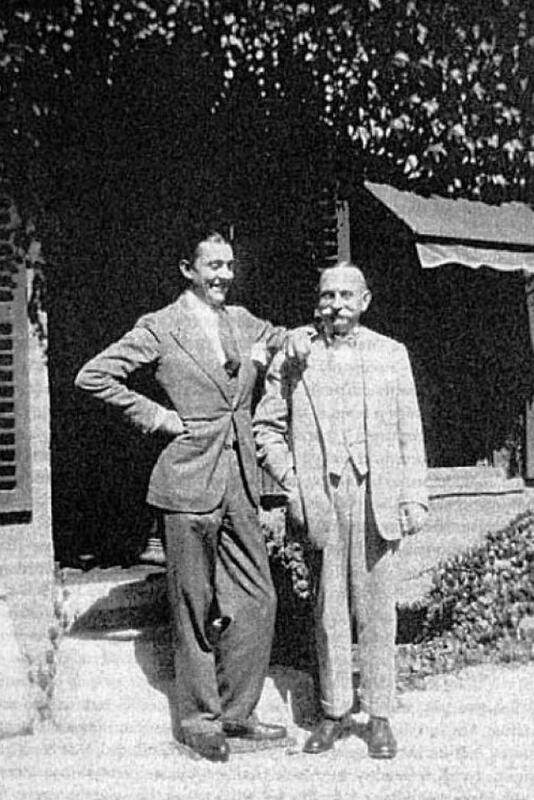 The second Sunday Gay / Gai dimanche / (1935) was adopted less cold. This was followed by other short films:from 1932-1938 he took Train left / (1936), Oscar, champion tennis / (1932) and return to the land (1938). In 1939, he was going on tour in Italy when he was drafted into the army. After demobilization, he went to live in the province of the Indre, where the idea comes to him and the film received the final name Festive Day / Jour de fete / (1949). Tati already had acting experience, too, with the pre-war shorts Oscar, champion de tennis and René Clément’s little gem about a country boy turned boxing maestro, Soigne ton gauche. 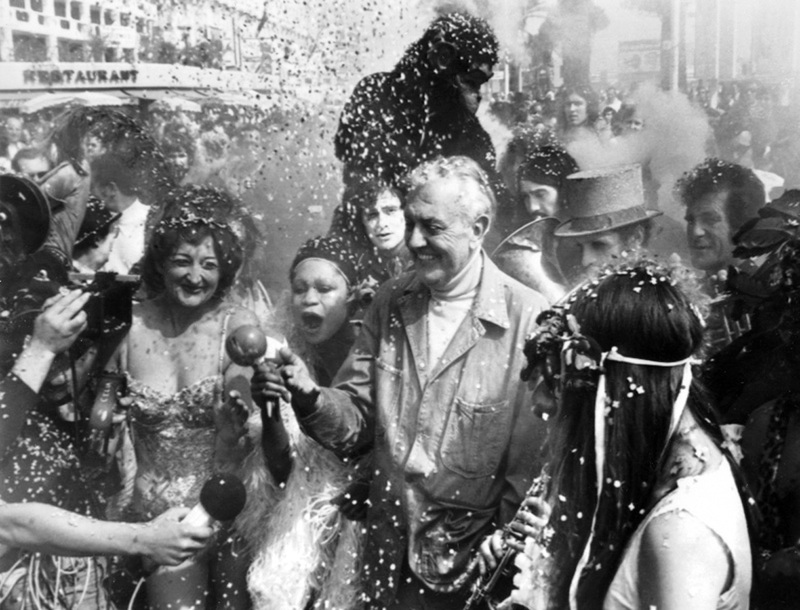 He spent the war hiding with a group of friends in a village in central France and returned there in 1947 to make his first movie, Jour de Fête. The film tells the story of a country postman who tries to adapt his bicycle delivery round to “efficient” American methods. 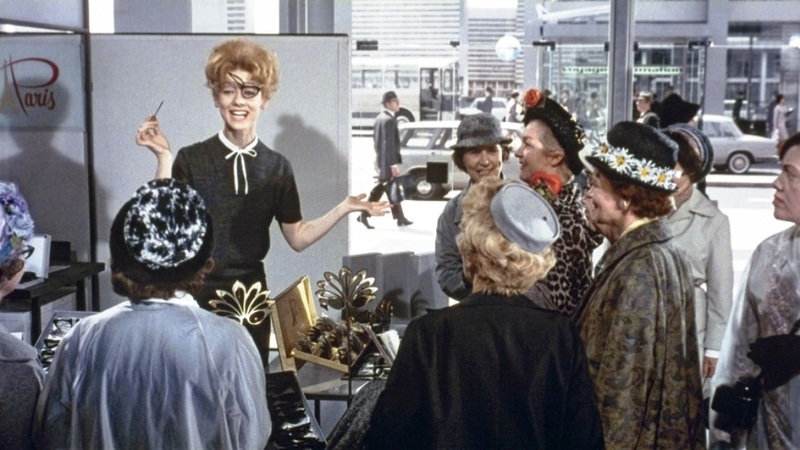 It introduces the themes which dominate Tati’s six, surviving movies: the desperate, or over-optimistic, but always comic efforts of mankind to cope with empowering, but belittling, modern devices, buildings and lifestyles. 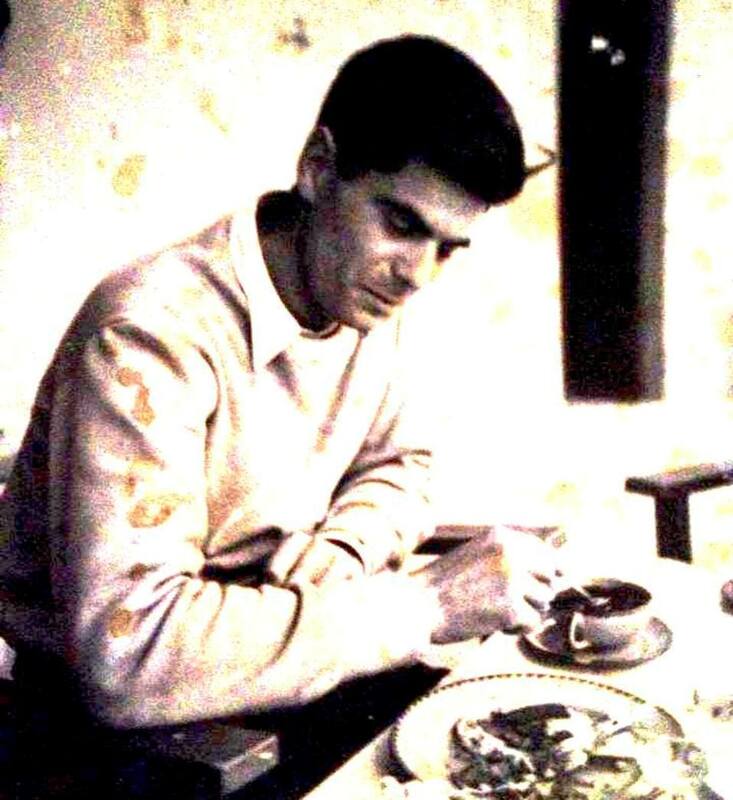 In 1947 Rene Clement wanted to make postmen School / Ecole des facteurs, L ‘/ (1947), but fell ill, and then decided to replace its chief writer and performer. He directed his own short School for Postmen in 1947. 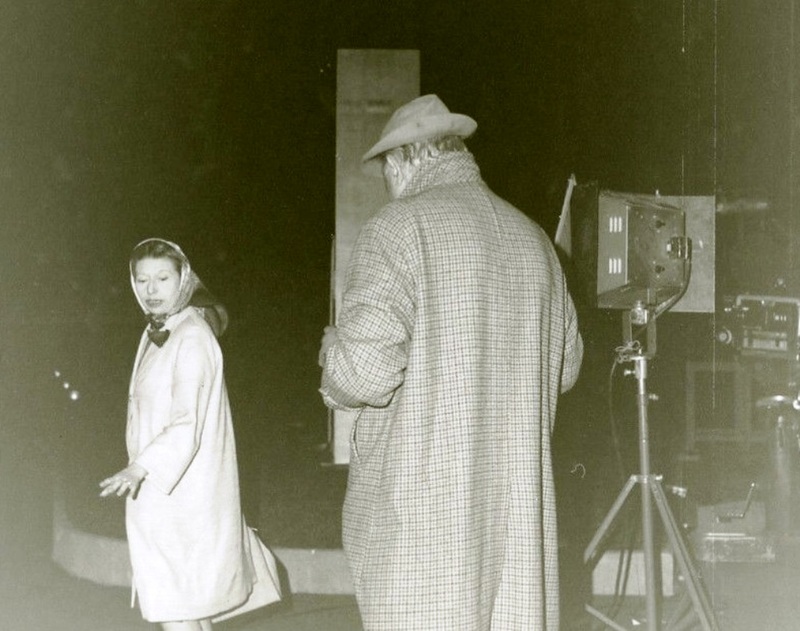 This short feature impressed the audience as well as the producer so much that he wanted it to be expanded into Tati’s first feature Jour de fete (Holiday, 1949). 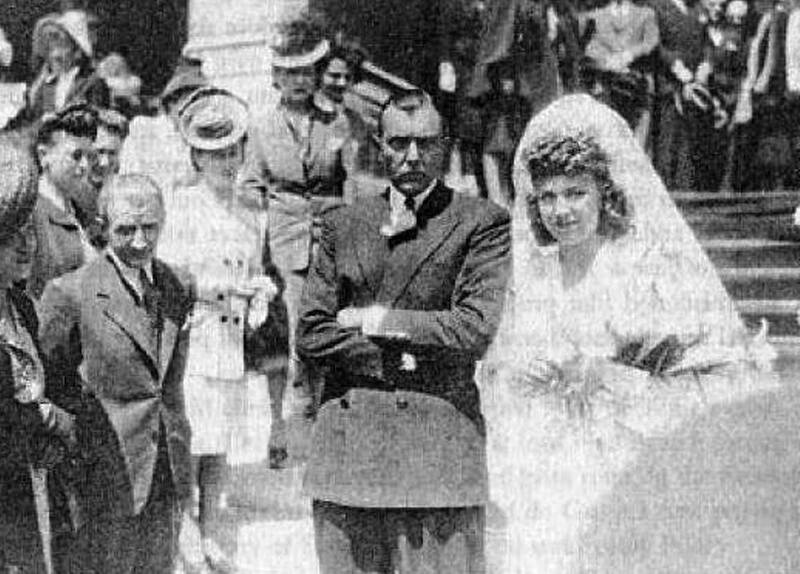 But the shorts were not profitable, therefore, due to the good reception of the film, decided to turn it into a feature. So there was a festive day / Jour de fete / (1949). Producers were asked to make a sequel adventure postman. 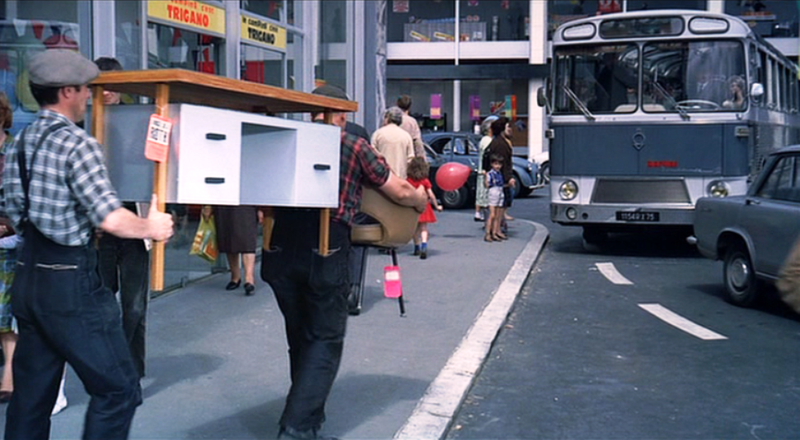 But Jacques Tati courageously decided to do something else. 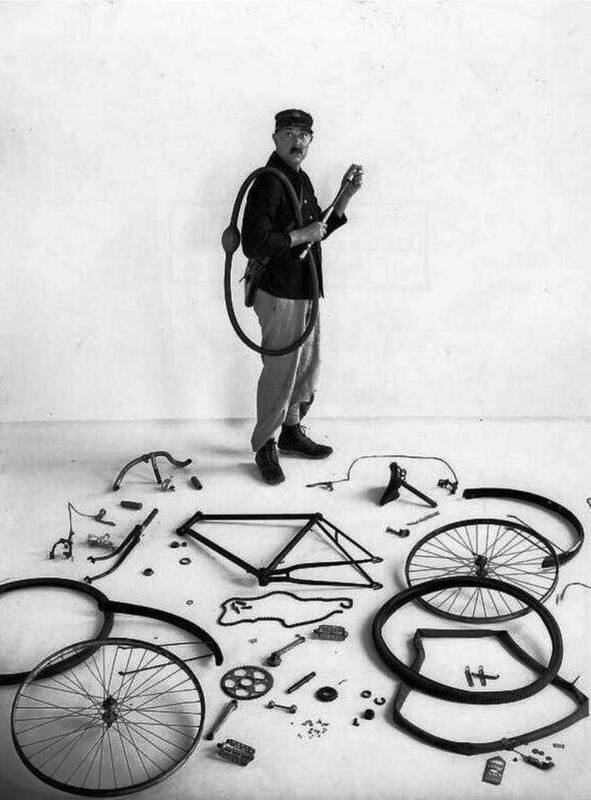 François’ adventures were expanded into a feature, Jour de Fête, in which he becomes obsessed with American efficiency and is determined to apply modern methods (unsuccessfully) to his bicycle delivery route. 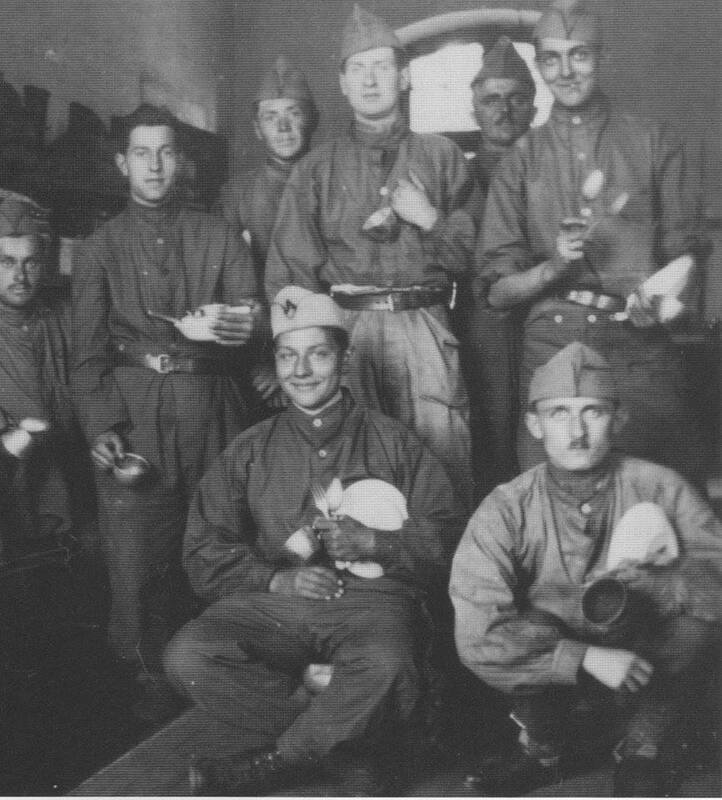 The film was printed in an idiosyncratic black and white process; in some scenes selected objects were hand colored. 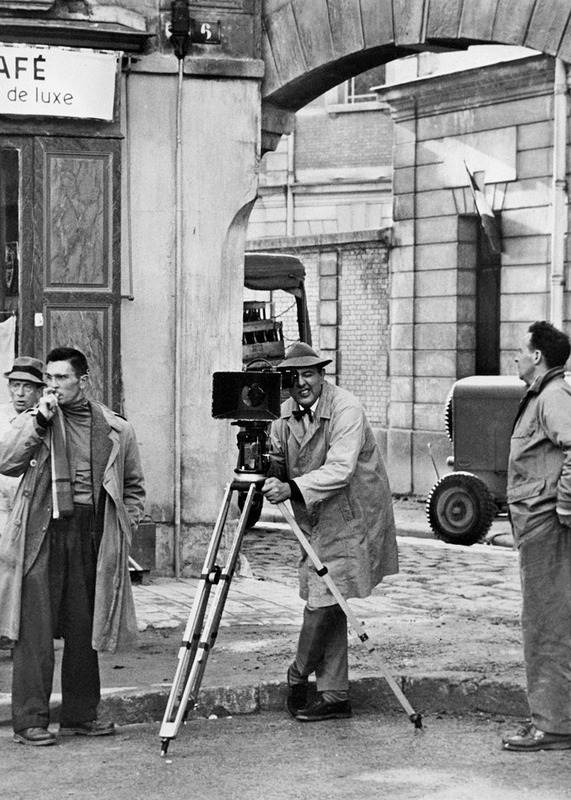 Filming Vacation / Vacances de M.Hulot, Les / (1953) began in 1951 but were suspended due to lack of money. By the film back in 1952 and was completed in October of that year. As in the previous case, it has caused distrust among distributors (there’s nothing there! ), But predpokaz dispelled all doubts. The film was a success in France, and America is a triumph. 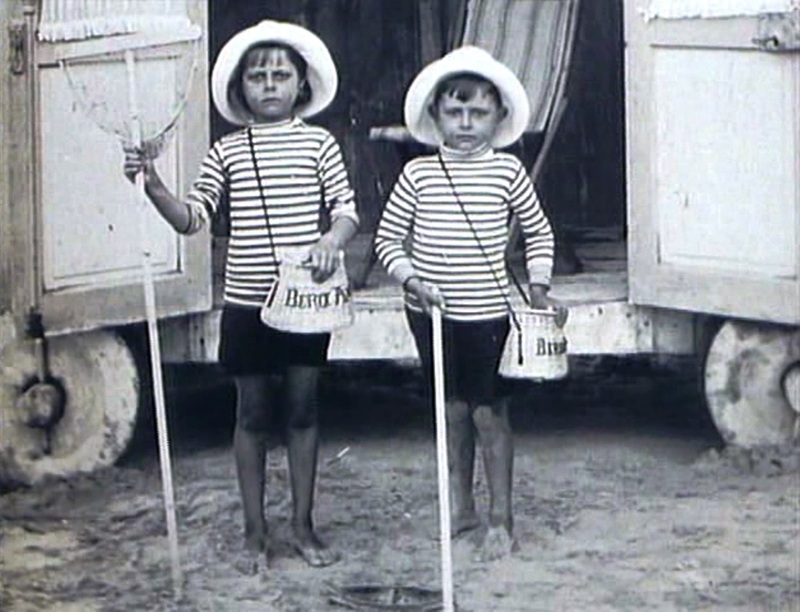 Jour de Fête’s enthusiastic reception led to M. Hulot’s Holiday (1953) the second of Tati’s “films de copains” made with his friends on a low budget. 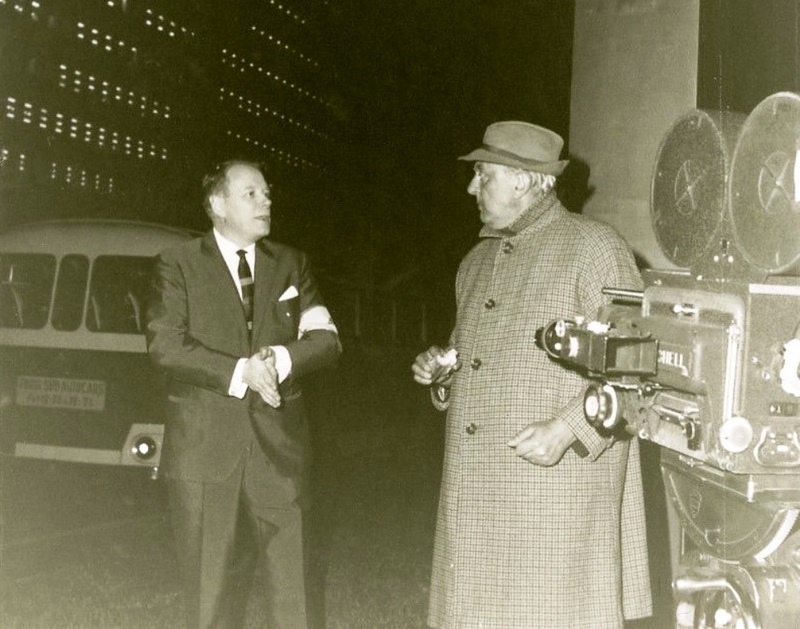 Seated: Jean Renoir, Henri-Georges Clouzot (winner for Les Diaboliques) and Andre Malraux. 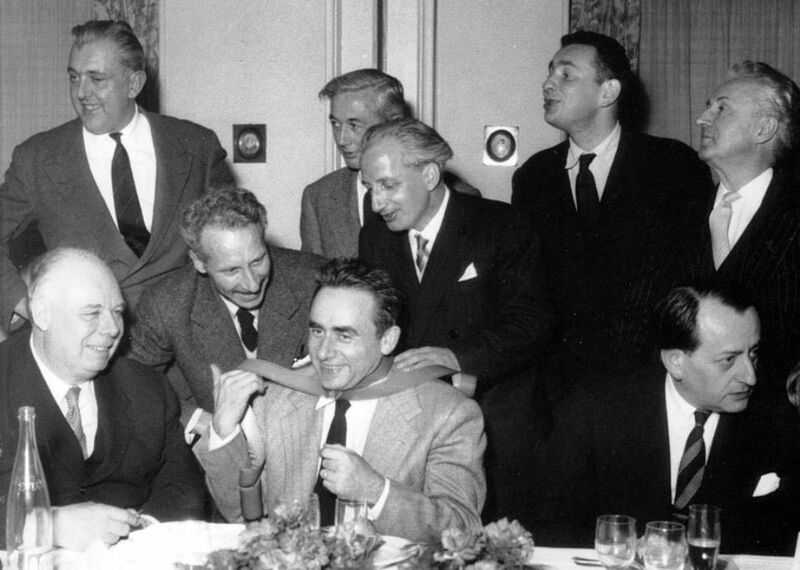 Standing: Jacques Tati, Jacques Becker, Robert Bresson, G. Masso, Alexandre Astruc and Noel. 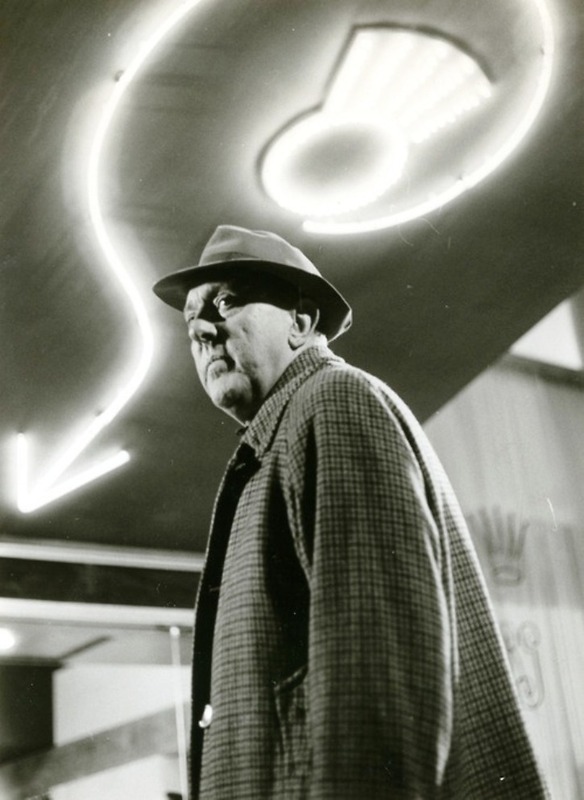 Mon Oncle (1958) was another success, emphasizing M. Hulot’s warmth and idiosyncratic personality as he vied with the stresses and strains of contemporary life. 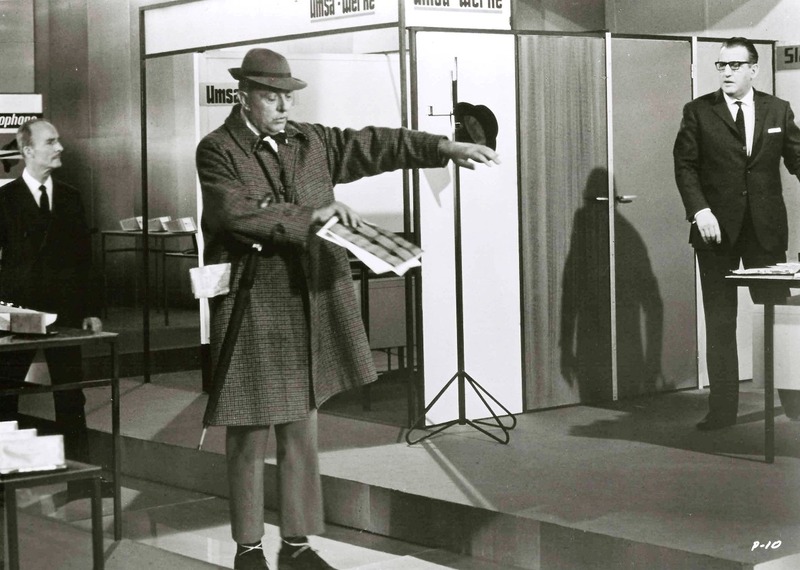 The film saw the creation of a new comic hero Mr Hulot, who is as distinctive and endearing as Chaplin’s Charlie. 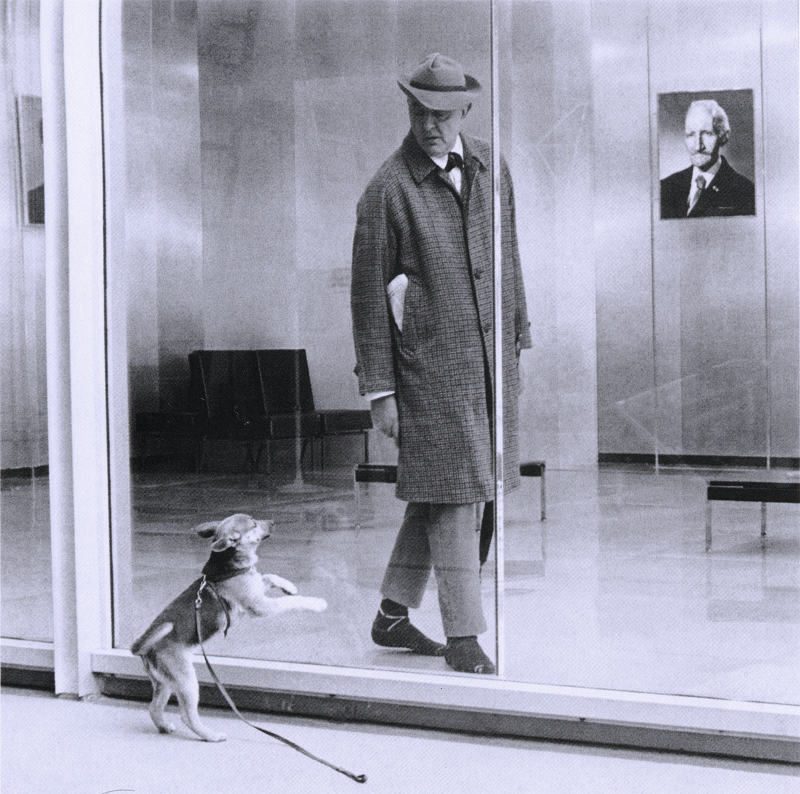 “Hulot is not a doer,” said Tati. 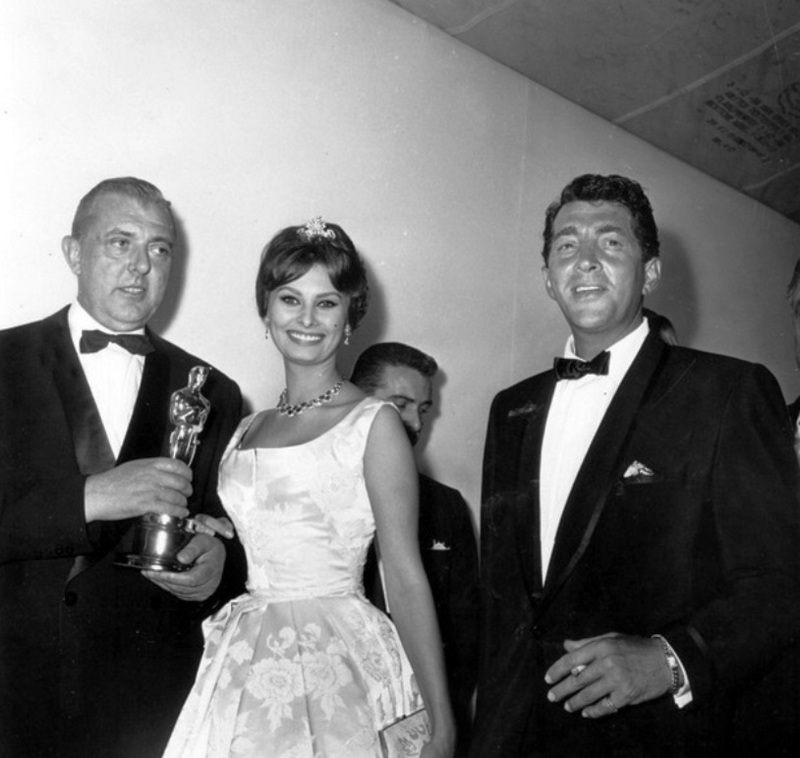 Jacques Tati with the Oscar for Best Foreign Language Film to France for “”Mon Oncle” at the 31st Academy Awards in 1959. 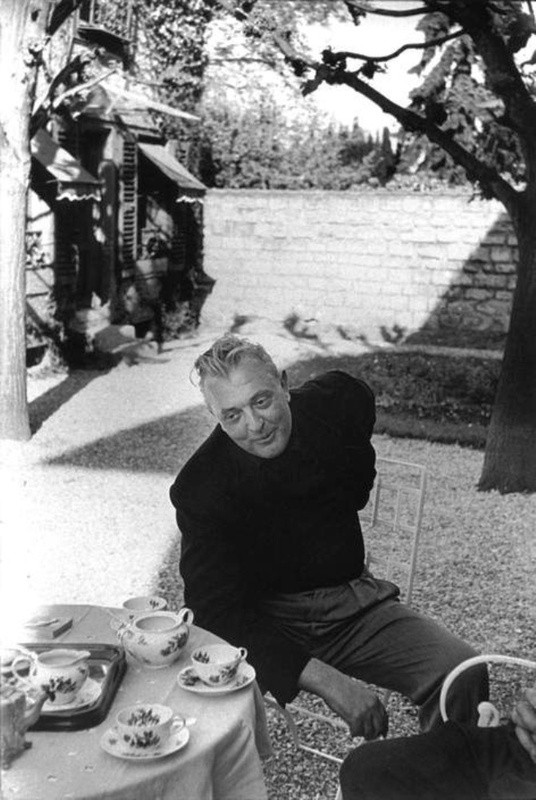 1959 at home in Saint-Germain-en-Laye near Paris. 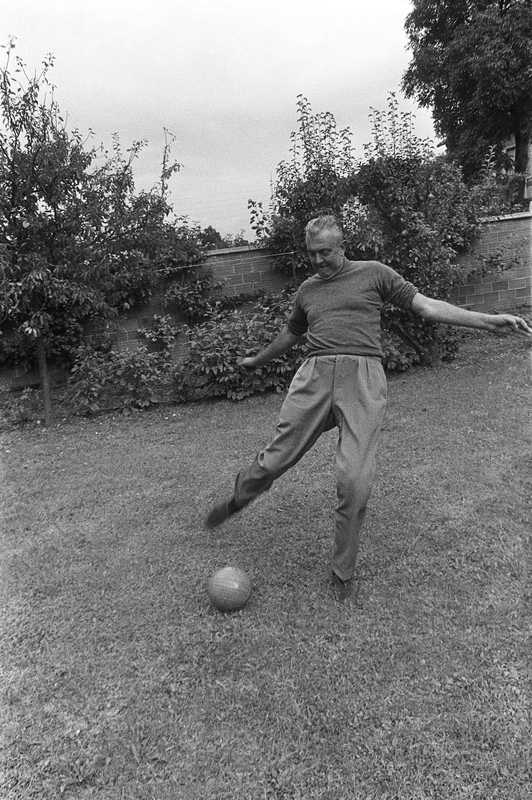 Jacques Tati plays football in the 1960s in the garden of his house in Saint-Germain-en-Laye near Paris. 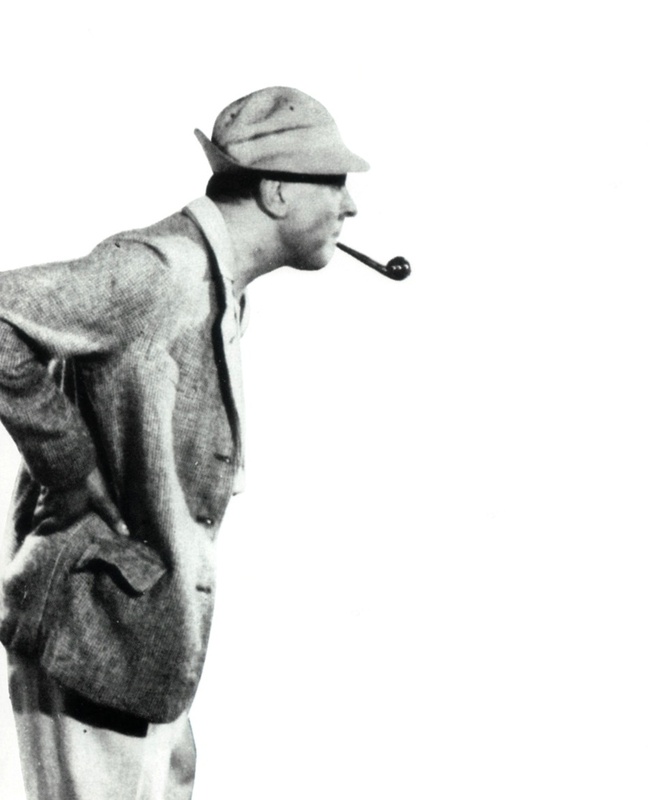 Partly inspired by Tati misadventures of this Mr. Hulot, a chemical engineer from Angena. However, he insisted on the participation of non-professional actors. 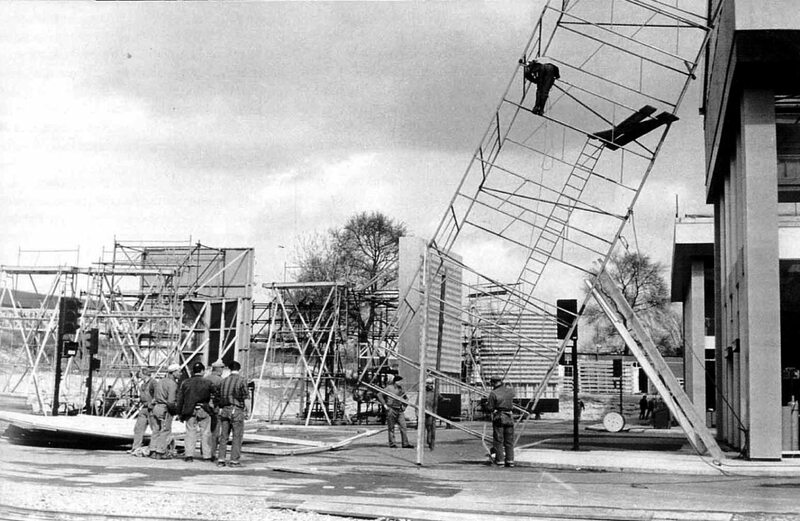 Play Time (1967) required three years of preparation, a year of filming, and then, the installation and filming consumed all the money received for the previous Tati movies. 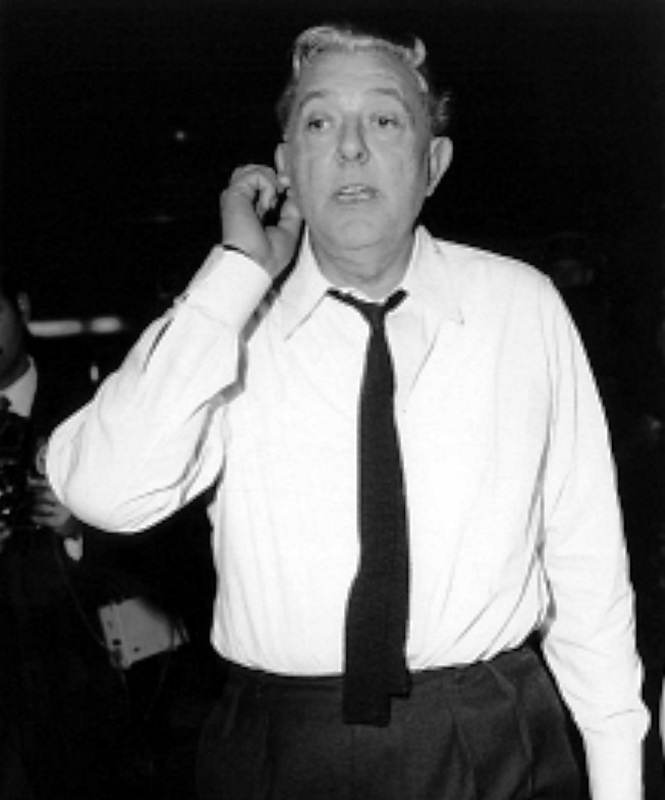 At the time of his death, Tati was, in fact, working on one more motion picture, a film that would reunite him and his old friend, Hulot. It would have been another ambitious project, perhaps at the same impressive range as Play Time. 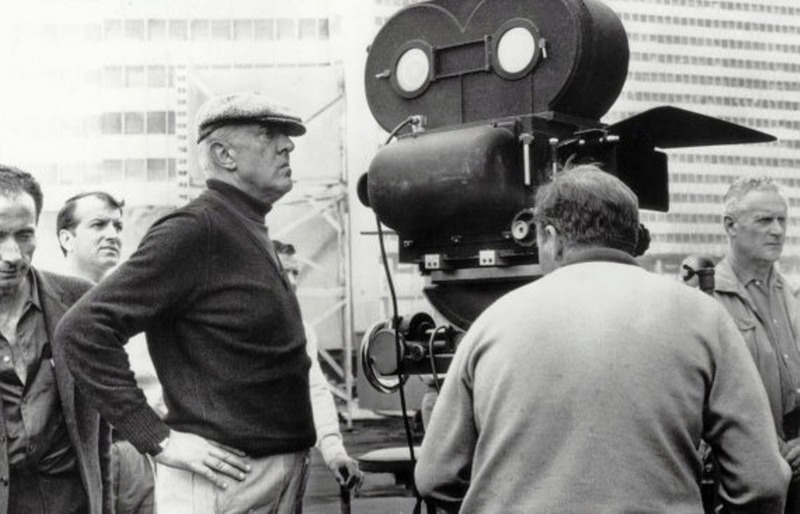 Jacques Tati died in 1982, before realising his seventh feature film project Confusion, which he couldn’t even start due to unavailabity of funds or a producer ! Bellos, David (2012). 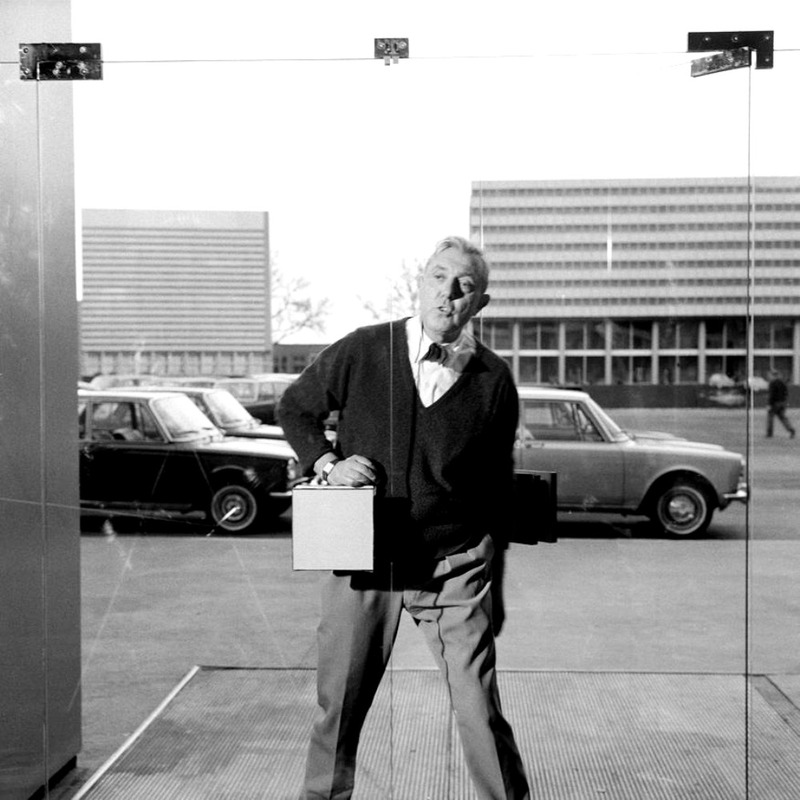 Jacques Tati. Random House. ISBN 9781409021827. 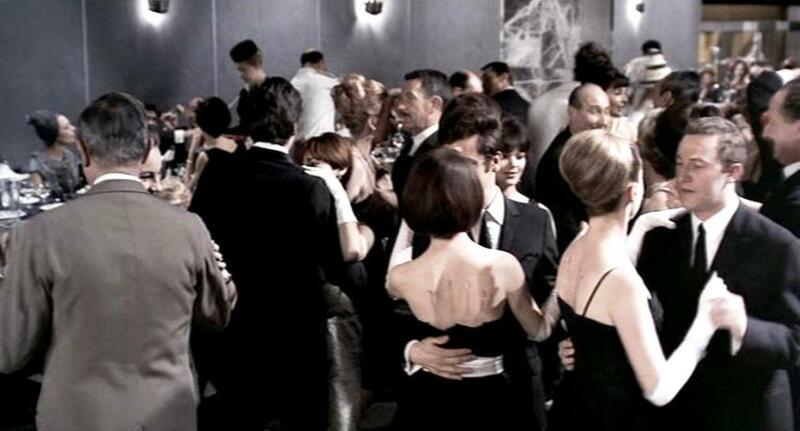 “Film historian Philip Kemp, commentary for the British Film Institute, on the Play Time DVD. 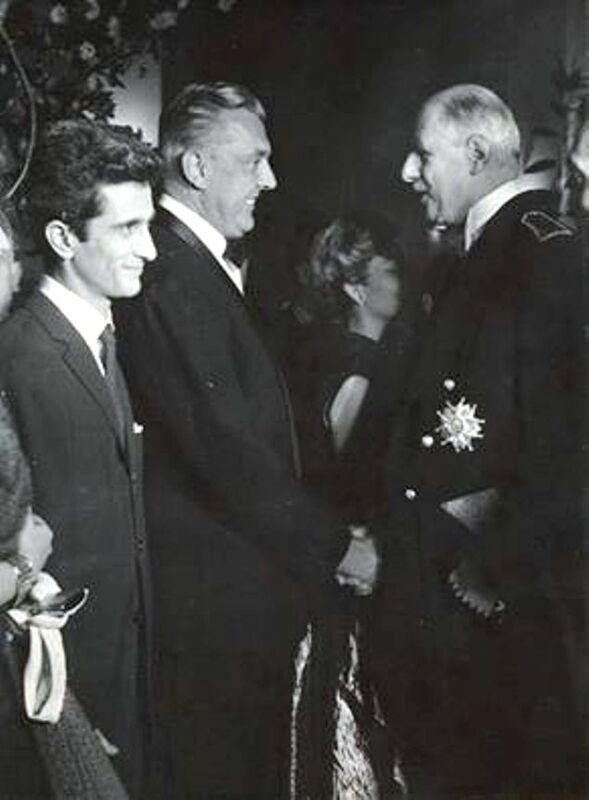 “6th Moscow International Film Festival (1969)”. MIFF. Retrieved 2012-12-17. “Play Time”. British Film Institute. Retrieved 2012-11-04. Roger Ebert on Playtime, one of his Great Movies. Jonathan Rosenbaum’s essay on Playtime from Criterion. 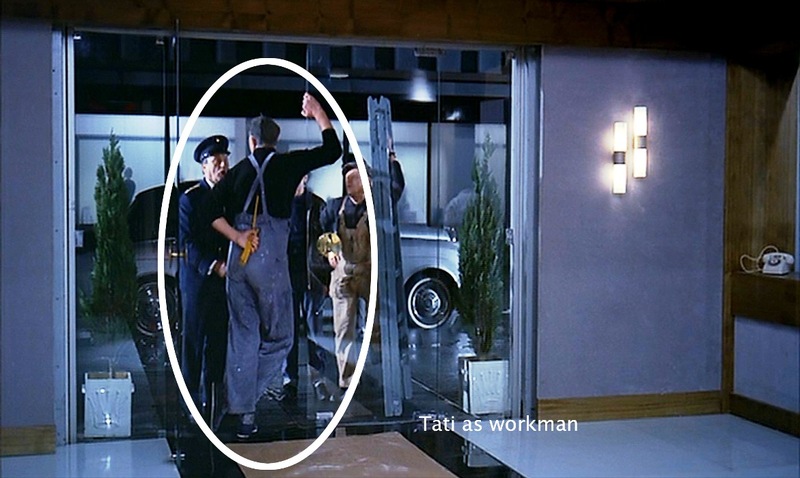 David Bordwell’s post on “Funny Framings” starts off with a Tati example from Playtime.